Once again I’m afraid I will have to offer my sincere apologies to the Association for my absence at the AGM and Annual Dinner this year. 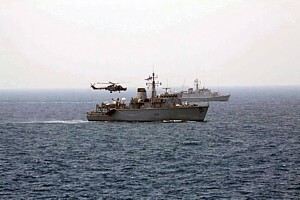 I am currently deployed on COUGAR 13 and flying my flag from HMS BULWARK. 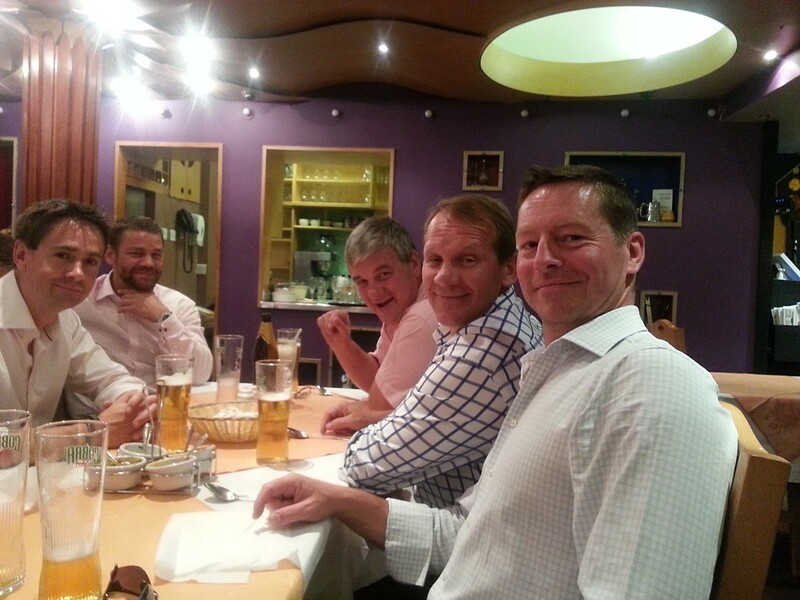 Sorry to miss out catching up with old friends again and celebrating the '88A/B Course Reunions. Coming back to the Gulf again always re-ignites the many memories of the 88-89 and 90-91 deployments in CHIDDINGFOLD and ATHERSTONE; isn’t it great that all these years later, the MCMVs are still here, setting standards for all others to reach and operating at the very centre of everyone’s attention. Please pass my apologies and very best regards to all. Suez Transit photo attached! Sadly, no Gully-Gully man anymore. Embarked HMS BULWARK for COUGAR 13"
The Southend Echo website contains this article in which a councillor expresses his concern about the amount of unexploded ordnance found locally, some of which was dealt with on Tuesday by members of an RN Diving Unit, presumably Portsmouth-based Southern Diving Unit 2 (SDU2). 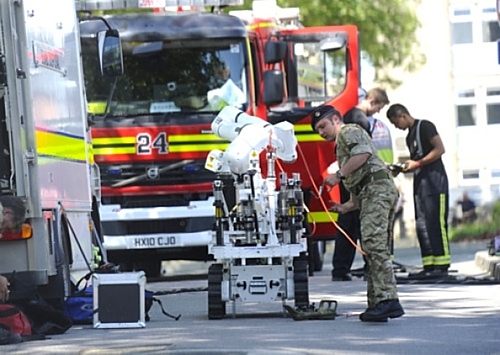 Reportedly, RN EOD teams have been called to 279 items of ordnance around Southend since 2008, ranging from anti-aircraft shells to an anti-submarine mortar projectile. Other Fleet Diving Tenders built in the 1970s included ILCHESTER (A308), INVERGORDON (A311), IRONBRIDGE (A310) and IXWORTH (A318). 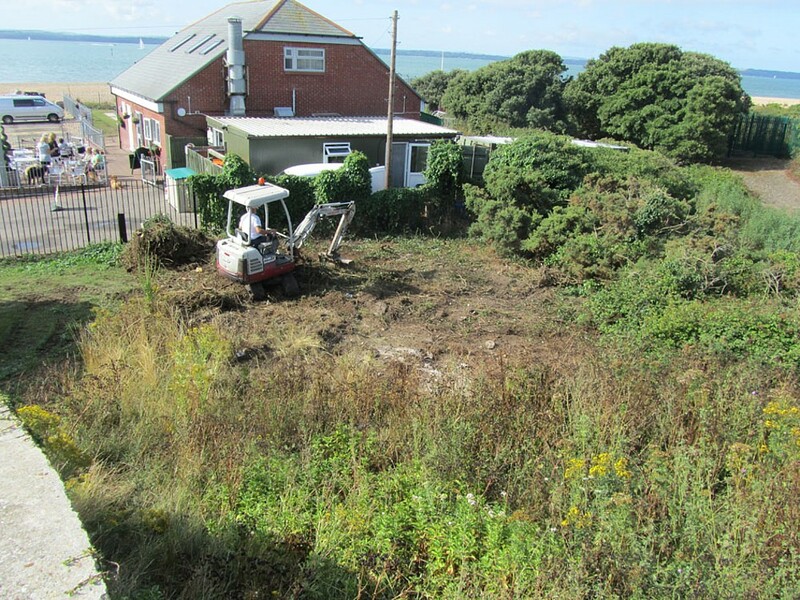 The Plymouth Herald website contains this article announcing that a landslide at Fort Bovisand has forced the relocation of the Joint Service Sub Aqua Diving Centre (JSSADC) to South Yard in Devonport Naval Base. The article also mentions Discovery Divers, co-founded by ex-CPO(D) Robert 'Danny' Daniels MBE (see entry for 22 Sep 13). 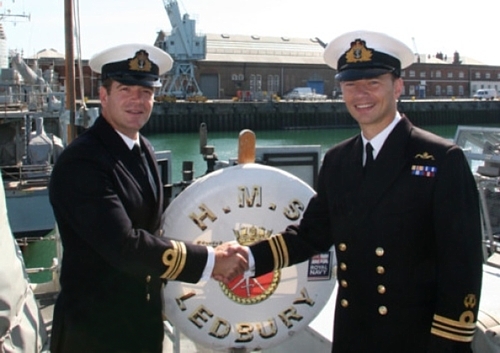 Firstly I would like to formally introduce myself as the new Commanding Officer of HMS LEDBURY and Crew 6 having taken over on 2 September from fellow MCDO and association member Lt Cdr Justin Hains. Justin is now enjoying new challenges as a student on the Advanced Command and Staff Course (ACSC) at Shrivenham. 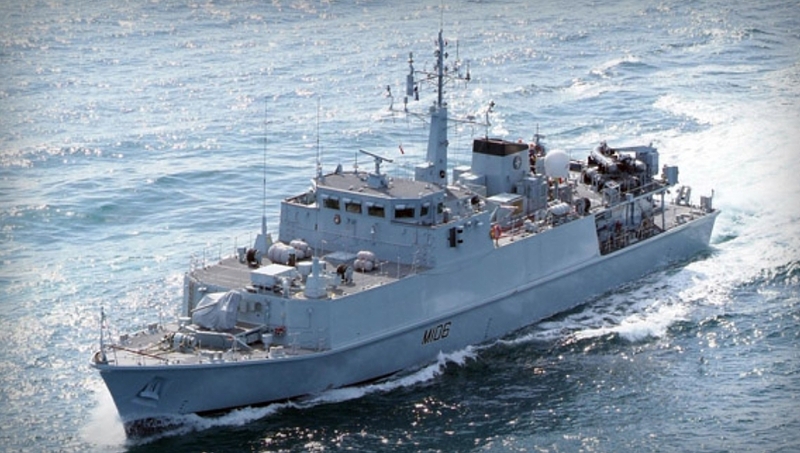 Below is a quick précis of LEDBURY’s activity since April this year during which the ship has been deployed to the Mediterranean as part of the UK’s continuing commitment to the Standing NATO MCM Group – SNMCMG2. 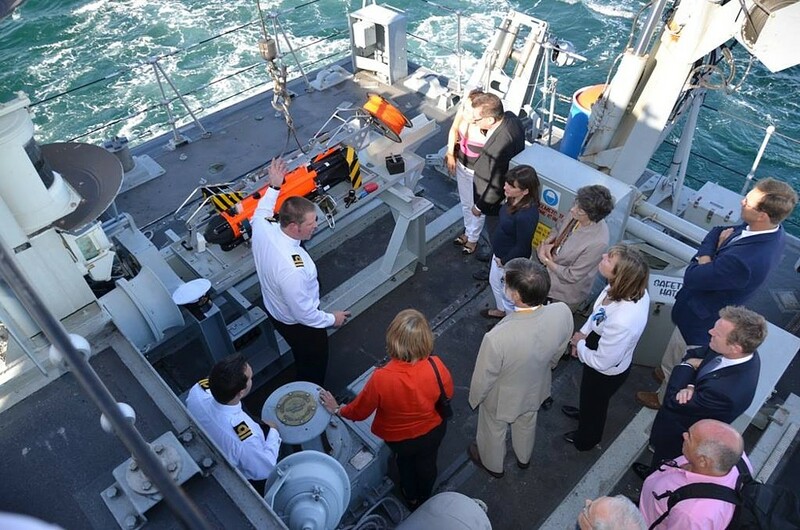 During the NATO deployment, LEDBURY visited a number of countries which offered the crew the opportunity to explore a number of cultures and cities. Particular highlights were Albania, Israel and Jordan. The port of Vlore, Albania was where LEDBURY formally joined SNMCMG2. This port was a pleasant surprise and the crew enjoyed the few days rest and recuperation alongside. 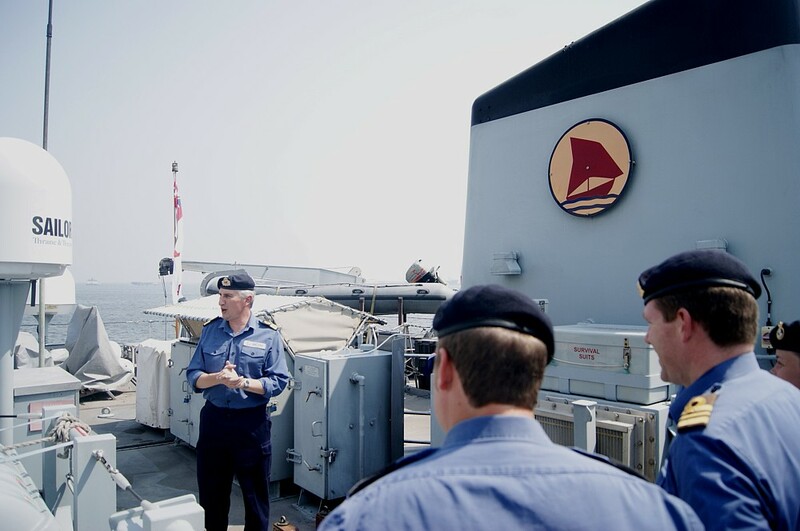 In Vlore, our squadron Commander, Cdr Andy Lamb, was able to visit which also coincided with an official visit from the British Ambassador to Albania. Cdr Lamb and the Ambassador were given a ship's tour and lunch on board. 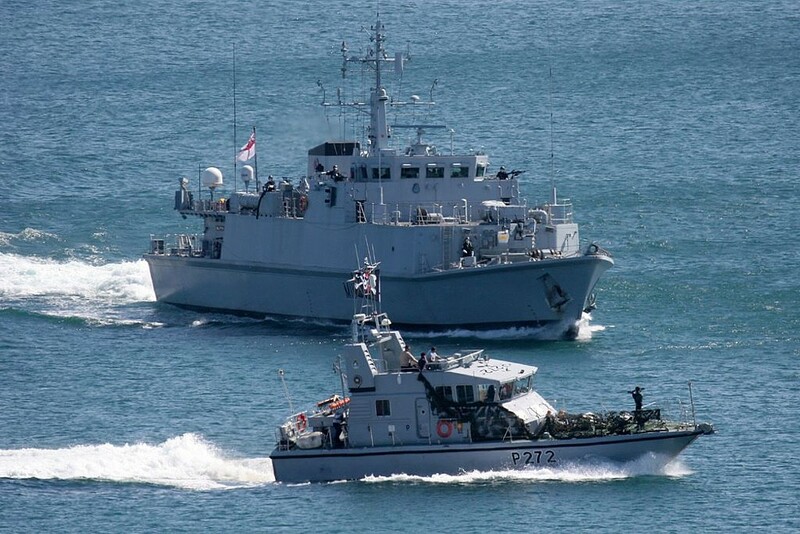 On leaving Vlore, the task group was able to take part in a very successful exercise with the Albanian Navy. 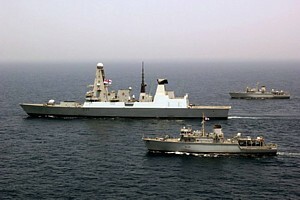 This involved a number of manoeuvres and a replenishment at sea exercise. After a hot but successful transit of the Suez Canal, LEDBURY passed the straits of Messina and entered the Gulf of Aqaba where the ship visited Aqaba, Jordan and Eilat in Israel; two very different cultures. In Jordan, many of the crew visited Petra and the Dead Sea with other activities including some fantastic snorkelling available not far from the ship. 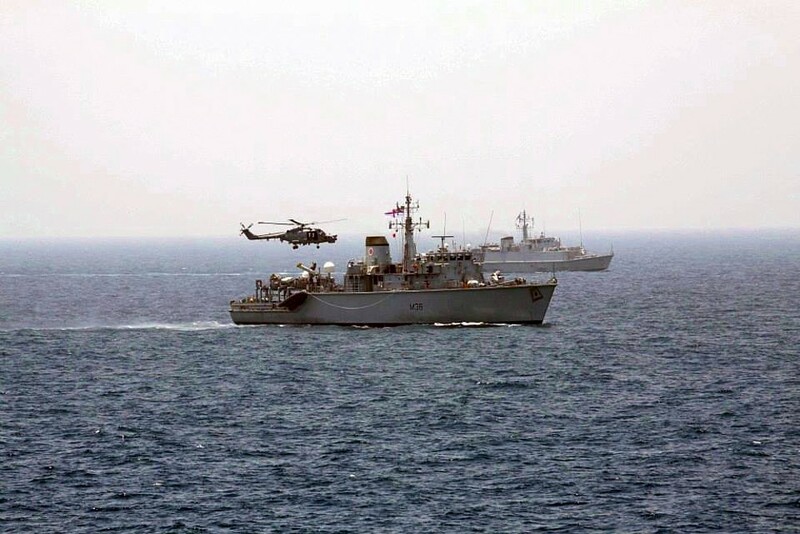 On leaving Aqaba, the Jordanian Naval Force took part in an exercise with the task force, allowing a number of Jordanian officers and divers to experience life onboard an RN warship. Following Jordan, Eilat was a very lively city with the port not far from the main town. During the visit, the ship’s clearance diving element exercised with Israeli divers where useful training was had by both teams. On the final day in Israel the task force conducted a significant search and rescue exercise together with the Israeli Defence Force. Medical teams from the task force and LEDBURY joined forces with the Israeli teams to treat the wide range of the simulated injuries and the exercise provided a useful opportunity to demonstrate NATO’s capability in this area. After three months away, LEDBURY returned to Portsmouth in early August and to friends and families. Following a well deserved summer leave, the crew is now preparing LEDBURY for our next deployment to the Baltic where we will be participating in a major NATO exercise followed by UK visits in November. Finally, thank you for your continued support to the MCD and MCM community and MCDOA website. I look forward to seeing you and many other friends at this year's MCDOA dinner in November. A good weekend with 43 on Saturday and 37 on Sunday. 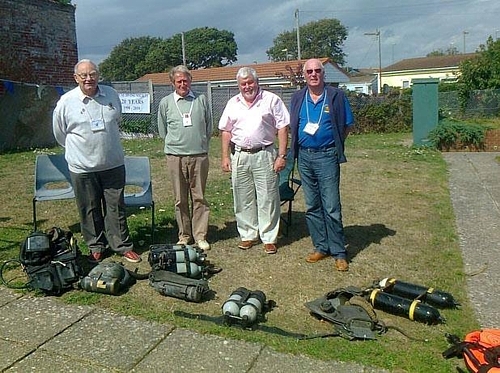 Saturday's visitors were boosted by Mike O'Meara's group of 17 Legend-owner-sailors who also volunteered for the Gosport Historical Diving Walk. The Gosport Heritage Open Days (12-15 Sept) really brought them in! 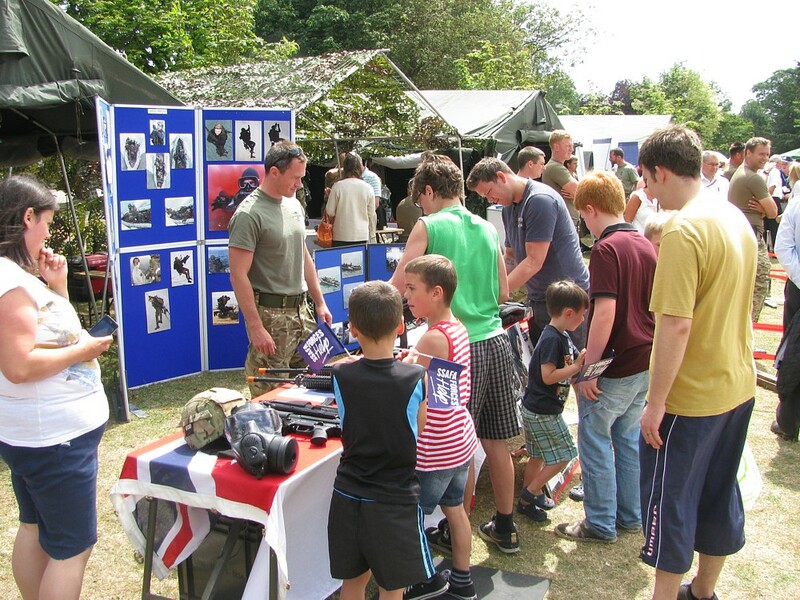 Thursday was 57, Friday 68, Saturday 174 and Sunday 171; making a grand total of 470 visitors! This is up on last year which was 463. It was probably more because they were coming in so thick and fast it was difficult to keep count! Many thanks to the tireless Guides who helped over the long weekend, including James Thomson, Dusty Miller, Martin Marks, Terry Nash, John Towse, Kevin Casey, Mike Dear, and Ann Bevan. 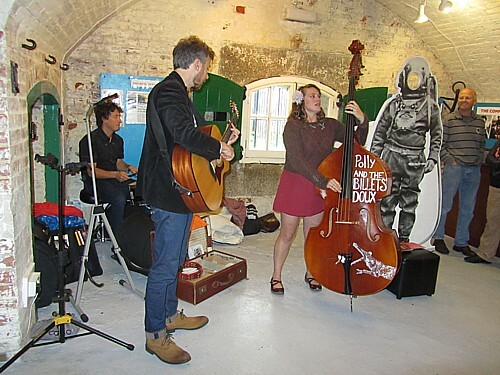 As an experiment, we were given the free services of a brilliant musical group: Polly and the Billets Doux. They were so good we bought their CD! We were honoured with a visit by Lt Col Paul Youngman and his family on Sunday. Paul is the Commanding Officer of the Defence Diving School at Horsea. He was one of Dusty Miller's students in the last century (and millenium). 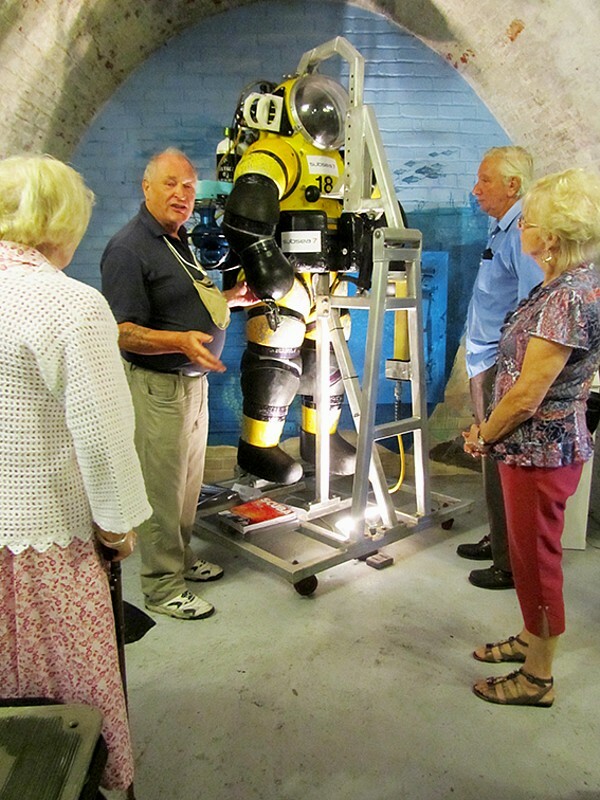 Amongst the interesting visitors was Richard Wardle, son of the famous, late, [MCDOA member] Harry Wardle who was the Deputy Superintendent of Diving and founder of Strongwork Diving. Richard kindly donated some most important historical documents and photographs that had belonged to his father. On 14 September, we were honoured with a visit by the Mayor (Councilor John Beavis) and Mayoress (Lady Christine Beavis) of Gosport. 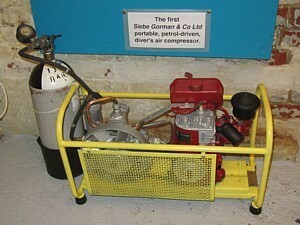 One of John Buxton's several donations a while ago was a portable Siebe Gorman air compressor. This has now been lovingly restored by James Thomson and proudly placed on exhibition. Can anyone let John Buxton see the pic since he hasn't discovered computers yet? If so, please ask him how old it is (1960s?). 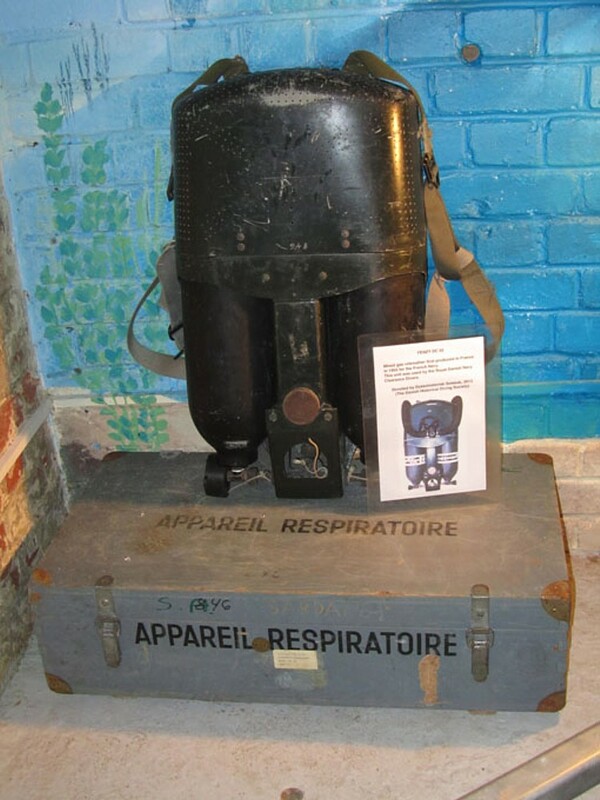 Also now on exhibition is the Fenzy mixed gas rebreather as used by the Royal Danish Navy very generously donated to us by the Danish HDS. We had a great piece of promotion in the Portsmouth News on Tuesday 17 September! The HDS Museum relies on a handful of volunteer guides, at least two but ideally three of whom need to be on site when it is open for business at weekends during the summer. If you live locally and can spare the odd few hours, please contact John Bevan via this email address or call him on 078 0278 5050. You will then be given access to the online roster to fill in your own dates as and when you are available. You don't have to be an HDS member to get involved in this or any other way. The Mail Online website contains this article describing the discovery of a Sunderland flying boat off Plymouth by ex-CPO(D) Robert 'Danny' Daniels MBE. The aircraft had crashed into the sea shortly after taking off in December 1941. 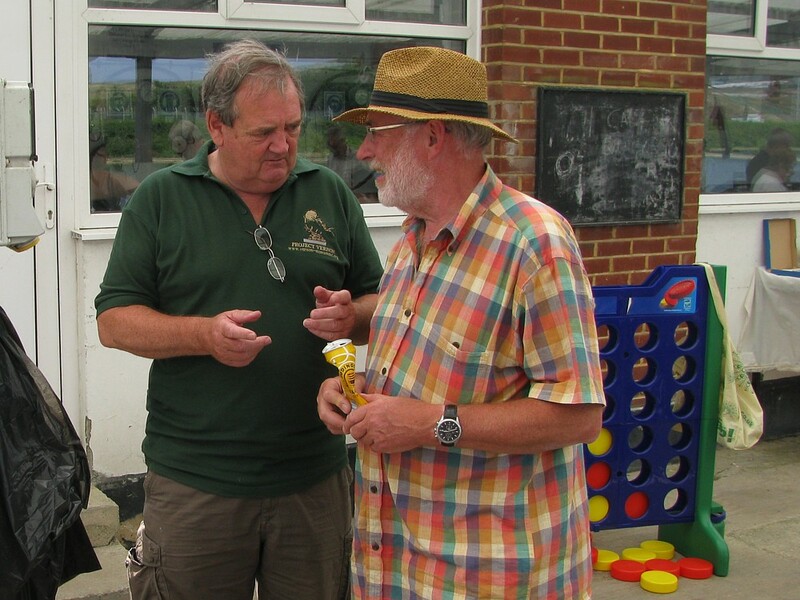 I am appending members' responses to the calling notice for this year's MCDOA AGM, Operational Updates & Dinner to the entry for 15 Sep 13 as I receive them although they should be sent to Soapy Watson, our Honorary Treasurer, as action addressee. 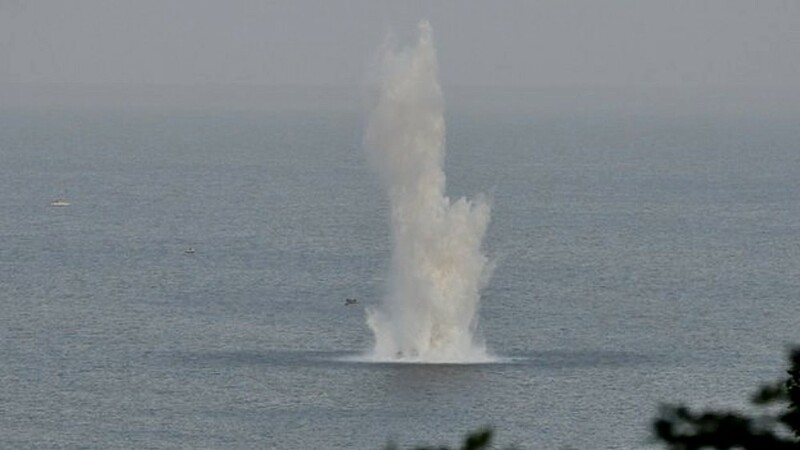 The Galloway Gazette website contains this article describing the disposal of a phosphorous flare near Portpatrick, presumably by members of Faslane-based Northern Diving Group (NDG). 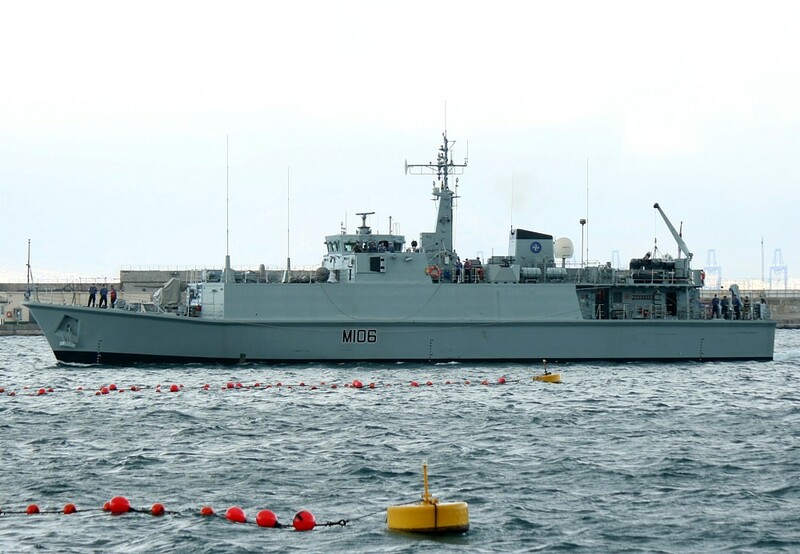 The Northern Echo website contains this article announcing that the Belgian MCM vessel BNS Bellis and the Dutch MCM vessels HNLMS Vlaardingen, HNLMS Urk and HNLMS Schiedam of Standing NATO MCM Group 1 (SNMCMG1) will berth at Jubilee Quay in Sunderland tomorrow for a weekend stand-off after participating in Exercise NORTHERN COASTS 2013 off Scotland. The Royal Navy website contains this article describing the participation of units of the Response Force Task Group (RFTG) in their first major exercise in the Red Sea since passing through the Suez Canal last week while on their COUGAR 13 deployment. The article features MCDOA President Paddy McAlpine OBE ADC, the Task Group's Commander who, understandably, has had to tender his apologies for absence from our forthcoming annual dinner owing to operational commitments. "Once more, this year’s Association Dinner will be held in HMS Excellent’s Wardroom on Friday 22 November 2013. 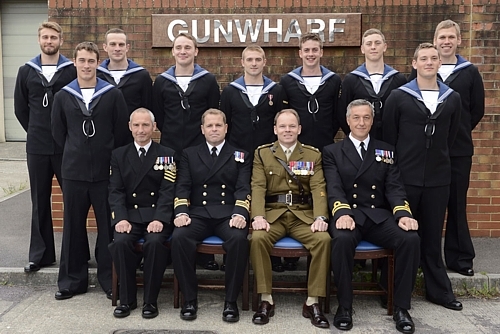 There will be a number of leavers this year including Commodore Phil Burrell as the senior leaver, Capt Adrian Cassar, Cdr Paul Jones (the Commanding Officer of HMS EXCELLENT), Cdr Chris Davies, Cdr Bernie Thompson, Cdr Tim Ash, Cdr Phil Ireland, Lt Cdr Dave Bate, Lt Cdr Jason Mullen and Lt Shaun McKeever. The dinner will cost a very reasonable £45 per head for members (£50 for Guests). Before applying, please ensure that your standing order mandate is in effect for the annual membership subscription of £15, as there are still many members who have not changed their mandate. 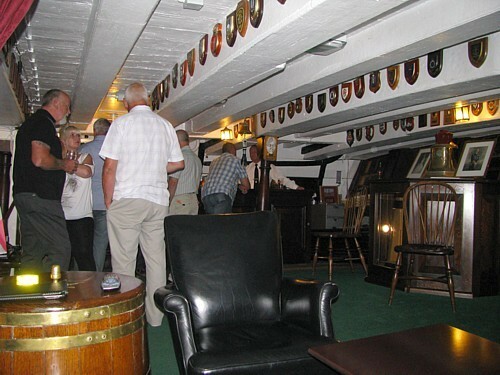 We will follow the traditional format commencing with pre-dinner drinks in the bar at 1900 followed by good food and refreshments and a hearty sing-song to the musical accompaniment of the HMS Nelson Volunteer Band before retiring for a nightcap or two. This year we are very fortunate to have Vice Admiral Peter Hudson CBE as our Guest of Honour; he was promoted to Vice Admiral in February 2013 upon assuming Command of the NATO Maritime Command at Northwood. 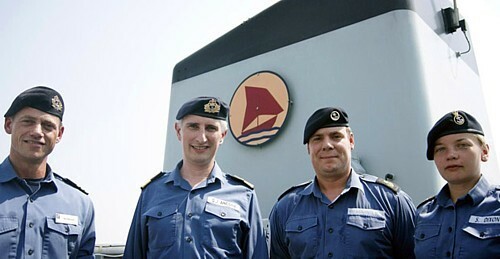 In 1994 he relieved HRH Duke of York to command HMS COTTESMORE along with many other ships. His biography can be downloaded here. As well as toasting the 25th anniversary of the 1988A/B Long Courses, this will also be a great opportunity to meet up with many old friends and acquaintances. Any service leavers (who are paid up members) wishing to be dined out are requested to contact the Hon Secretary. 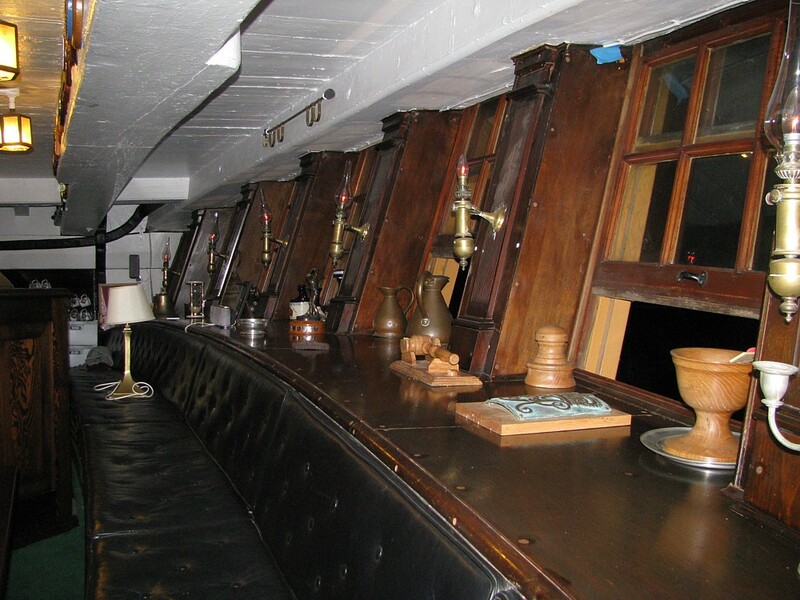 As ever, the mess is likely to be full but limited accommodation will be available on board HMS BRISTOL courtesy of her Commanding Officer, Lt Cdr David Price. Unfortunately, there is no insurance cover for non-MOD personnel so it is a case of serving personnel only. Members should also be aware that the heads on board will be under refurbishment so facilities are likely to be limited to Portaloos! To ensure that you do not miss out on this great evening please complete and return the application, ensuring that it reaches me before 31 October 2013. The calling notices for the AGM, Operational Updates and Annual Dinner are available for download here and via the 'Forthcoming Events' page. Serving and ex-serving WO(MW)s and WO(D)s are thoroughly welcome to attend the dinner at the 'guest rate' of £45. 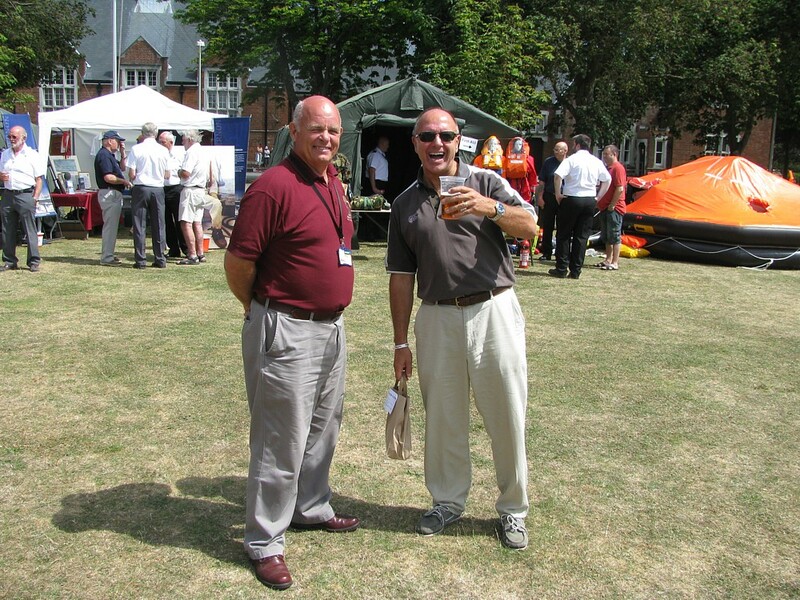 As is our custom, we will be marking the 25th anniversary of LMCDO '88A (Course Officers: Jon Chapple and Dave Griffiths. 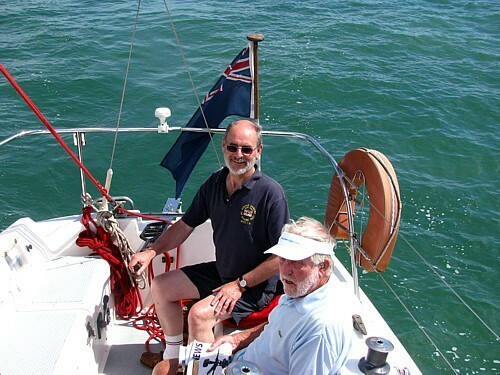 Course Instructors: Ray Ramsay and Chris 'Charlie' Howe. 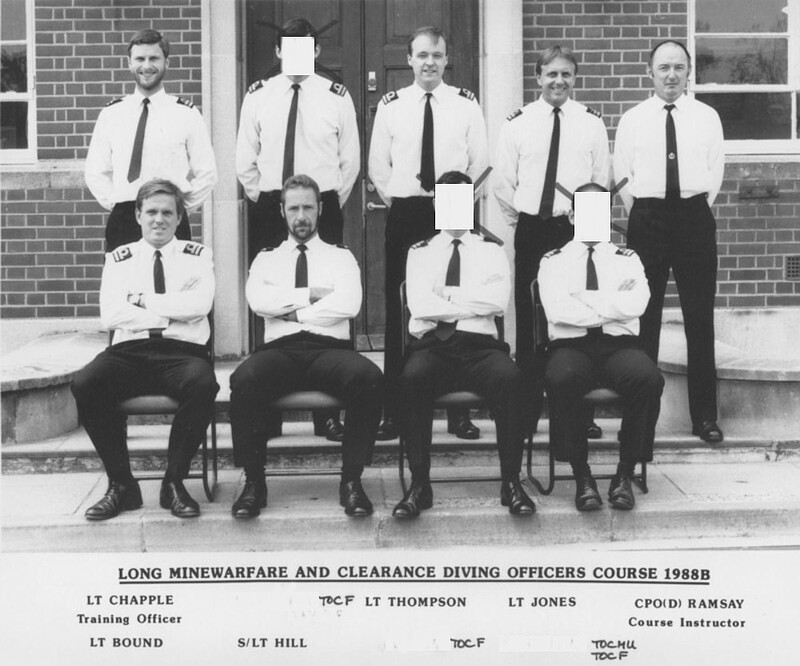 Students: Chris Ashcroft (MW only), Dougie Bell, Mark Durkin, Simon Elliman, Kim Godfrey (Completed Diving module on LMCDO '89A) and Martin Jenrick (MW only)) and LMCDO '88B (Course Officers: Jon Chapple and Dave Griffiths. Course Instructors: Ray Ramsay and Chris 'Charlie' Howe. Students: Simon Bound, Chris Deere RCN (MW only), Nigel Hill, Neil Hinton (MW only), Paul Jones, Bernie Thompson and Dave Utting (MW only)). I understand that MCDOA Past-Chairman Paul Jones, who is also being dined out of the RN, is coordinating a mass turnout by course members. 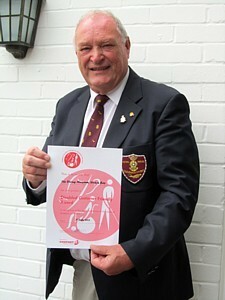 I also understand that Derek Leach intends celebrating the 40th anniversary of LMCDO '73 (Course Officer: Ed Thompson. 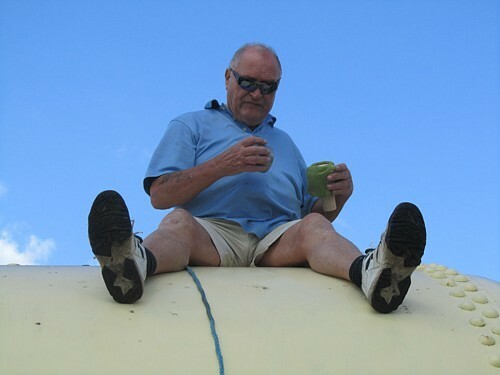 Course Instructor: the late Bill Bauckham. Students: Alan Bayliss, the late George Dance, Surg Lt Charles Evans (Diving only), Stu Harper, Mike Kooner, Derek Leach, MCDOA Past-President Richard Moore and Andy Stribley) and is hoping for strong representation. We will also be dining out any MCDOA members leaving the Service. If you are a leaver and wish to be dined out this year, please inform our Honorary Treasurer Soapy Watson in good time and advise him which version of glass mine or diver you would like as your 'gizzit'. Leavers must have been paid-up members for at least the past three years to dine for free but may pay for the privilege if they have joined the Association in the meantime. This event is heavily subsidised by the MCDOA so only bona fide members and affiliates are eligible to attend and bring private guests. Check that the Standing Order covering your annual membership subscription is still valid and reflects the increased amount of £15 per year before applying or you will be disappointed. If you are not yet a member of the MCDOA but feel you are entitled to join, the necessary Application Form and Standing Order Authority (effective from next 1 Jan) are available for download via the Membership section but you must also send a cheque for £15, payable to the MCDOA, to cover the current year. I look forward to seeing as many as possible on the day of the race. Apologies that I am unable to attend the MCDOA AGM, update and dinner this year as I will be away. Best wishes to all and I hope you have a most enjoyable day and dinner. Hope you are well. Unfortunately I will not be able to join you at the dinner so please pass my apologies to the assembled masses and blow a bubble or two for me! Please pass my apologies to one and all. 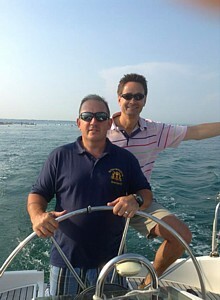 I'm out here in the Gulf with Captains Elvin and Bence doing handover and l'ill old me as the continuity man. However, I do have a favour to ask. I still haven't been able to trace my leaving glass diver statue thingy. It wasn't available at my leaving dinner a couple of years ago and I have had no luck since tracing it. Any ideas where it might be? Cheers and good luck for the dinner! 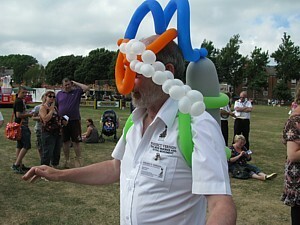 By Webmaster: I have asked Soapy Watson, our Honorary Secretary, whether he can chase up a replacement 'gizzit' for Bill. Thanks for the update - quite a shock to see the course photos after all of 25 years. 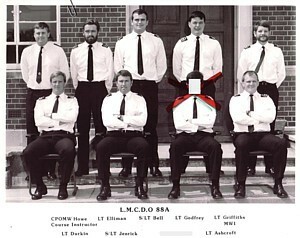 I completed LMCDO '88A as a MW Officer and joined you soon afterwards in BERKELEY off Dubai. My how time flies! The MW module of '88A was of course famous for the 'leg of lamb' incident which almost saw Elliman and me court-martialled ...... but we can save that for his eventual dining out. 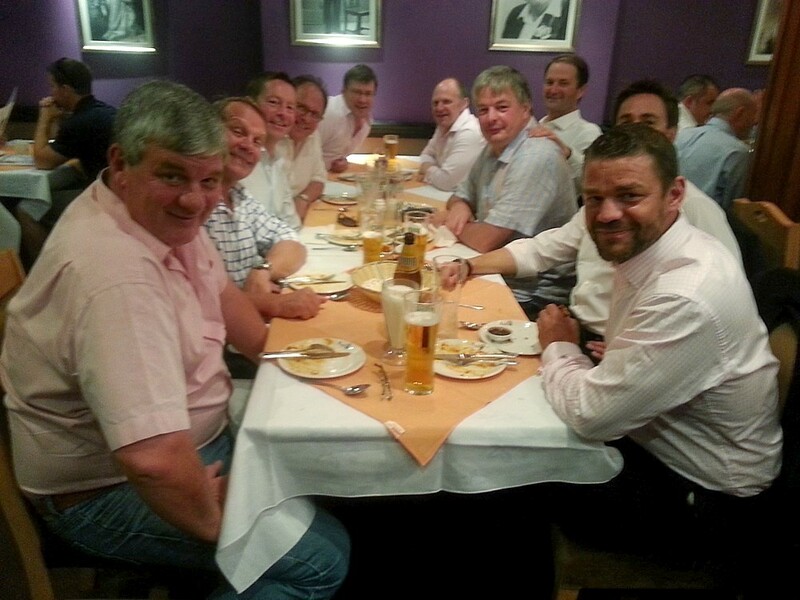 It is always great to see so many old colleagues at the dinner and I plan to attend so I hope Jonesy is successful with his rounding up of other members, some of whom I have not seen in years. I hope all is well with you and look forward to catching up on the day. Once again many regrets unable to attend the social event of the year, although Julie will be back in UK at the time, so perhaps I should send her as the Spidy Ince rep? Then again, perhaps not! I will certainly look seriously at getting over for 2014 as it will be the 25th Anniversary of 89A/B. It will be a relatively short stint at the MCD HQ though as I have just been selected to become the Maritime Surveillance Advisor for Tonga. 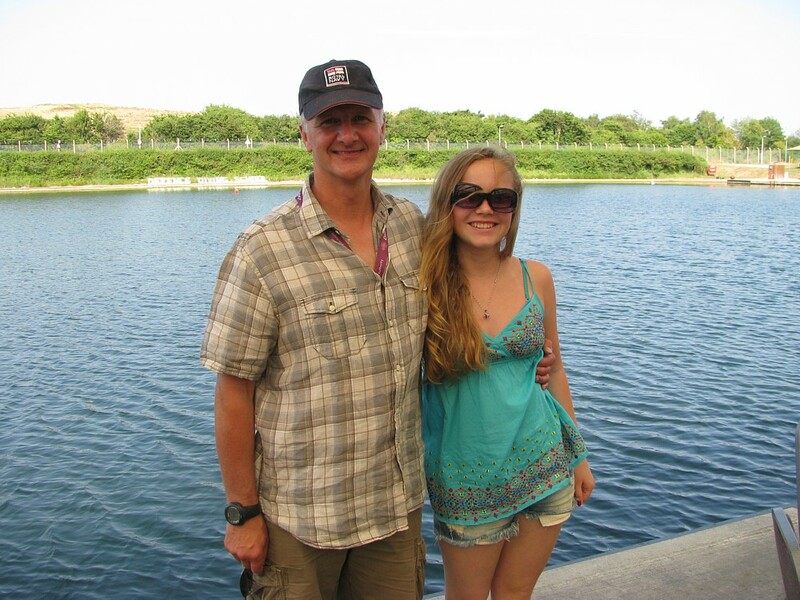 Julie and I ship out in Jan 2014 for a three year South Pacific island adventure. It cashes in on my newly acquired patrol boat and border protection skill sets and the only diving I will be doing will be for the shear joy of it. As you know I have also written and published a book under my nomme de guerre Bradley Vincent, called 'Far From Breaking Waves - A Sailor Cast Adrift in Afghanistan'. 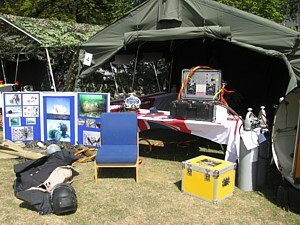 It is a Royal Navy career centric diver's dit based around my RAN deployment to that 'wonderful' country. If any of the brethren are interested in obtaining a copy they can do so via Amazon and iTunes. Signed copies can be obtained through Paul Guiver's company 'Divers and Collectables' and it will soon be available through the Vernon Monument website. Of course folk can always contact me direct. I can't resist a plug opportunity! Actually the book is doing rather well down here, but the day job remains fulfilling so I don't plan to retire and become a full time writer just yet. All my very best to my MCD brothers. 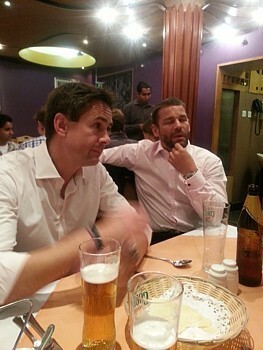 I'll raise a glass on the night to Nick Stanley and Jonesy. Apologies for not replying to your email earlier. I am currently at the defence academy enjoying ICSC (Maritime) whilst still holding onto my hat as XO MCM2 Crew 1. My draft order is finally in for the Guz team and a steady (single) job is approaching. Suffice it to say I haven't had the time to get together with Soapy for a handover but will try to get amongst the Treasurer's job ASAP. Of note I have to brief on the maritime/land seam during our staff ride to Normandy and wondered if you had any books in your library on the LCOCU or any dits (wouldn't want to miss out on a chance to spread word the branch's contribution. Hope you are well. Looking forward to the dinner. Sadly I may be abroad in November so cannot attend the Annual Dinner. I hope you are well and still enjoying running the website as noone knows how we could do without your amazing input. Any time you are down this way please let us know as you and yours are always welcome. I have already sent my apologies to 'Soapy' as I will be in Australia visiting my sister... A great pity that I will not be attending as I have tried to attend all the MCDO dinners since moving back to Pompey. Please offer my MRU. I hope to be there next year. Given my age, I should add God willing. 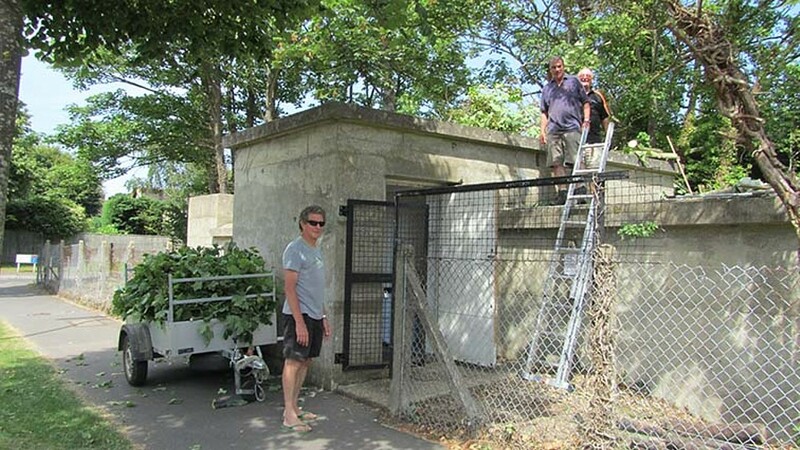 The Kingsbridge & Salcombe Gazette website contains this article describing a call-out for Plymouth-based Southern Diving Unit 1 (SDU1) to deal with a second rocket found embedded in a Napoleonic admiralty signal tower at Soar near Kingsbridge in South Devon (see entry for 12 Sep 13). The Panorama website contains this article, the Your Gibraltar TV website this article and the Gibraltar Chronicle website this article announcing today's arrival of HMS Penzance (MCM1 Crew 3) in Gibraltar for a short visit en route to join Standing NATO MCM Group 2 (SNCMG2) in the Mediterranean (see first entry for 11 Sep 13). 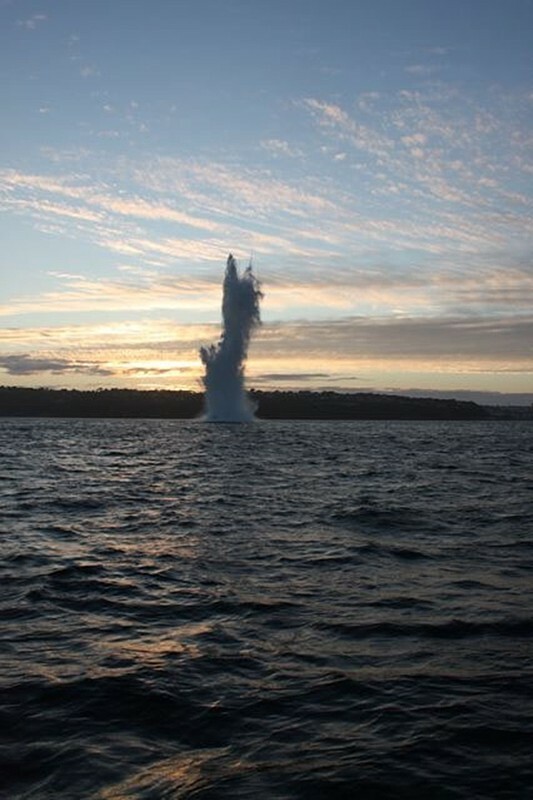 The Western Morning News website contains this article and the Plymouth Herald website this article describing two EOD incidents dealt with by Plymouth-based Southern Diving Unit 1 (SDU1) within the past two days. 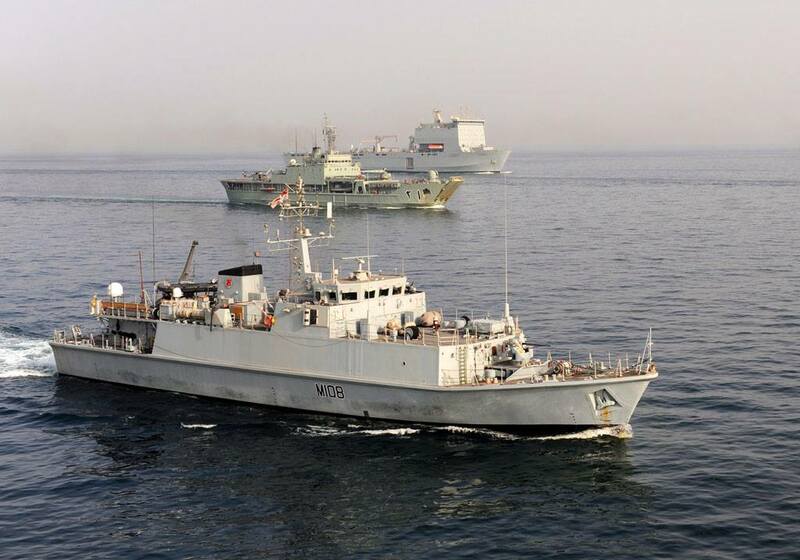 The Royal Navy website contains this article describing last Friday's departure of HMS Penzance (MCM1 Crew 3) for a Mediterranean deployment with Standing NATO MCM Group 2 (SNCMG2). 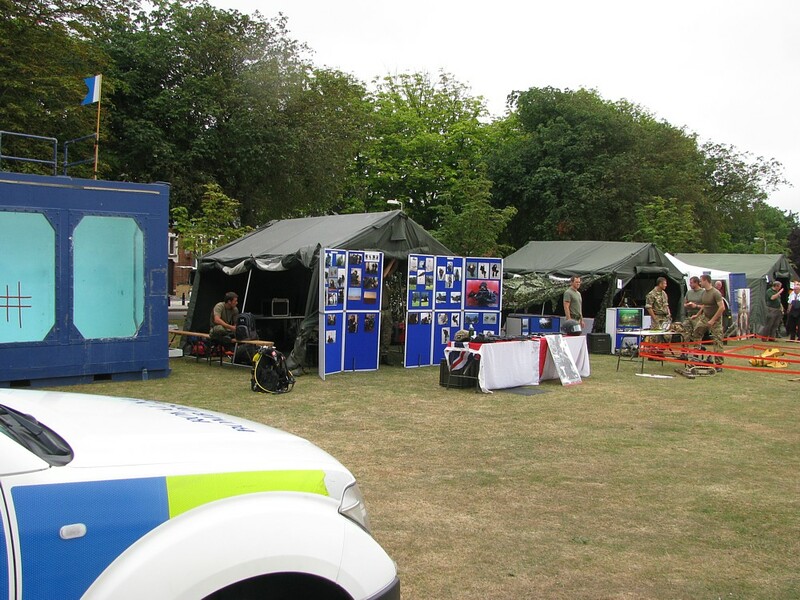 Postscript: Rather belatedly, the MoD website published this article on 20 September and the RN website published this article on 23 September describing the same event. 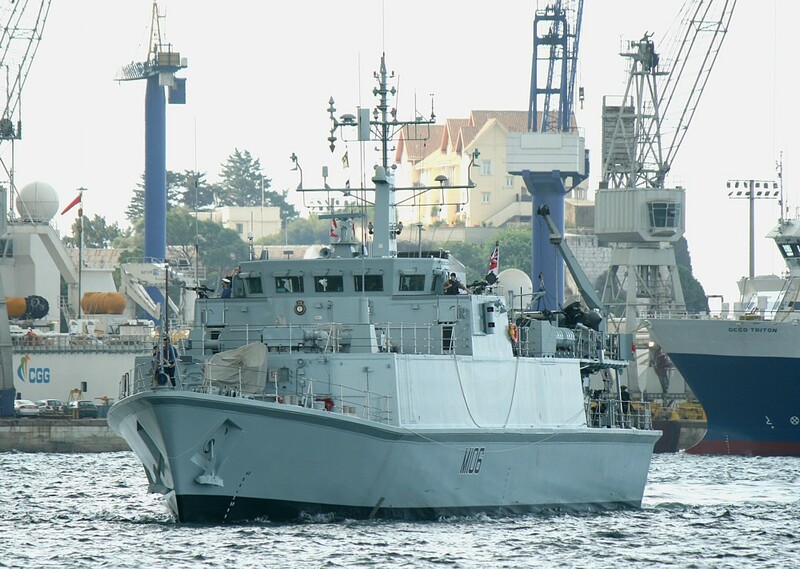 The Royal Navy website contains this article announcing an affiliation visit to Inverness this weekend by HMS Grimsby (MCM1 Crew 7) although the ship will not be open to the public. 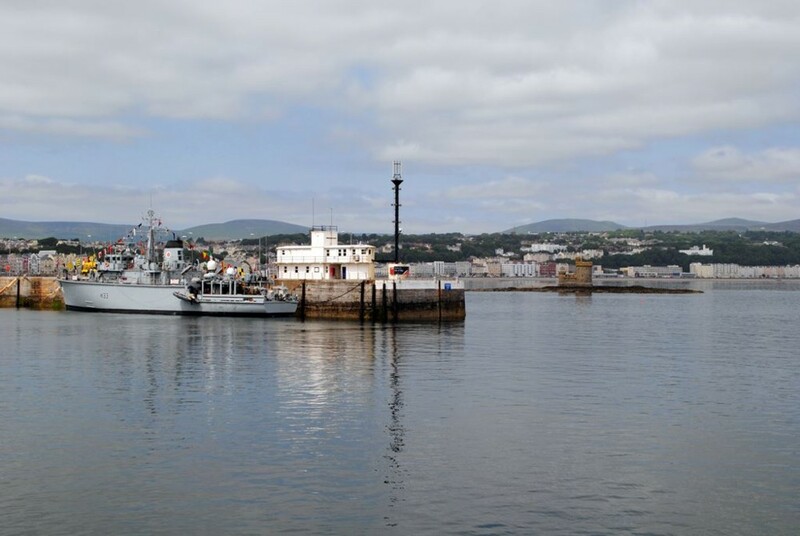 The Royal Navy website contains this article explaining how divers from HMS Brocklesby (MCM2 Crew 3) cleared rope fouling the propeller of the Isle of Man ferry, MV Ben-My-Chree during a visit to Douglas to support the opening of the Tynwald, the world’s oldest parliament, in early July (see entry for 1 Jul 13 in News Archive 43). 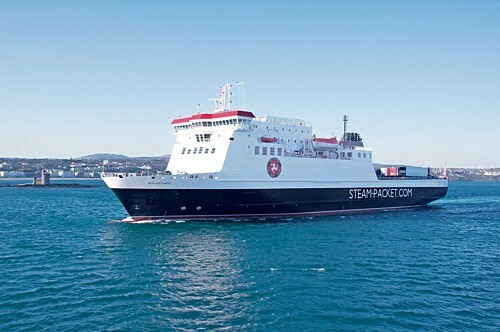 A whip-round among the passengers raised £1,000 for the Royal Navy & Royal Marines Charity (RNRMC) which was matched by the ferry's operator, the Isle of Man Steam Packet Company. 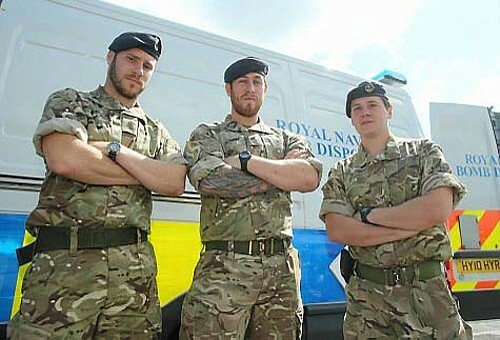 The article features PO(D) Darren Lewis, LS(D) Martin Platts and AB(D)s Dan Box and Tom Davies. Congratulations to all concerned. Postscript: On 20 September, the Portsmouth News published this article covering the same story. The Leicester Mercury website contains this article announcing that the medals awarded to Ordinary Seaman Bennett Southwell GC will be auctioned by Dix Noonan Webb Ltd at the Washington Mayfair Hotel in London on 20 September. As Lot 1568, they are expected to fetch between £50,000 and £60,000 and the relevant details are available here. OS Southwell was attached to the Admiralty's Land Incident Section for bomb & mine disposal duties while serving at HMS Vernon in the early part of the Second World War. He was killed on 17 October 1940 during the Blitz while assisting Sub Lt Jack Maynard Cholmondeley Easton GC RNVR to deal with a German GC ground mine (a sea mine that was also employed as a land mine) which had penetrated a house at Hoxton in the East End of London and was suspended from the chimney by its parachute. The clock started when a fuze removal tool was applied and OS Southwell was killed by the blast, having run across the road to take shelter. He was awarded the George Cross posthumously "for great gallantry and undaunted devotion to duty". Sub Lt Easton, also serving at HMS Vernon, was awarded the George Cross for the same incident. He had shouted to OS Southwell to run for safety and then ran himself, reaching a surface air-raid shelter just as the explosion occurred destroying six complete streets. When he recovered consciousness he was buried deep beneath bricks and mortar and his back was broken. He was dug out eventually and spent a year in plaster before continuing his service in command of a minesweeper. By 1939, concurrent with the formation of Royal Engineer Bomb parties, the Admiralty and Air Ministry had set up their own separate and distinct Bomb Disposal organisations, each with an exclusive responsibility to its parent service. In August 1940, the UK Joint Service Bomb Disposal Charter was raised to outline and establish inter-Service responsibilities for UK Explosive Ordnance Disposal. Naval Bomb Disposal Teams were set up under the Admiralty's Directorate of Naval Ordnance under the Director of the Naval Unexploded Bomb Department (DUBD) to discharge the Royal Navy’s responsibility for dealing with unexploded bombs on its own property. 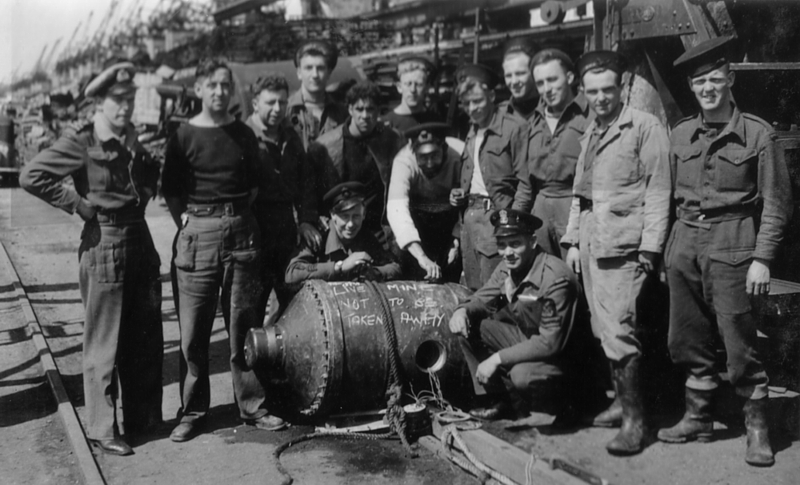 By 20 September 1940 there were Naval bomb disposal teams at 27 shore establishments, all trained at HMS Vernon. Each team was led by a BSO (Bomb Safety Officer) who was normally a Sub Lieutenant RNVR or Commonwealth equivalent of the RNVR. One of the BSOs was an American called Draper Kauffman. He graduated from the US Naval Academy in 1933 but retired to civilian life because of weak eyesight. In 1939 he joined the French Ambulance Service and was captured by the Germans when they overran Holland and Belgium. Upon his release as a citizen of a neutral country (USA), he joined the Royal Navy as a Sub Lieutenant RNVR and was trained as a BSO. He performed bomb disposal duties for 14 months until October 1941 when, following an accident, he returned on leave to Washington. Here, he was approached by the US Bureau of Ordnance and asked to establish a US Bomb Disposal School. Thus, Lt D L Kauffman RNVR became Lt D L Kauffman USNR and Officer-in-Charge of the first US Bomb Disposal School. He was subsequently awarded the Navy Cross for bomb disposal work at Pearl Harbour and finally retired from the USN as a Rear Admiral after establishing the US Navy's first Underwater Demolition Teams (UDTs), the forerunners of the Sea, Air & Land Teams more commonly known as the SEALs. His eventful life and career are described in America's First Frogman - The Draper Kauffman Story, written by his sister Elizabeth Kauffman Bush who is also the sister-in-law of former US President George H W Bush. According to Lt Cdr Leon Verdi Goldsworthy GC DSC GM RANVR in The Touch and Go War, the recovery of two unexploded magnetic mines at Shoeburyness in November 1939 had provided grim proof to HMS Vernon's Enemy Mining Section (EMS) of the war it was to fight. The task imposed on the EMS soon outstripped its capacity and very soon a larger unit, the Rendering Mines Safe Section (RMS), was hastily formed. Comprising such famous names as Wadsley, Syme, Mould, Gidden, Armitage, Newgas, Fenwick, Smith, Taylor, Kessack, Reid, Cliff, Upton, Gosse, Goldsworthy and others, it was initially based in Banks Block at the Admiralty in London and was set to work after only minimal training. Its orders were simple and to the point: "Get rid of the damned things." During the Blitz of 1940, the Admiralty's RMS Section found new quarters in Charing Cross Road and was renamed the Land Incident Section (LIS) of which OS Southwell was a member. It had acquired power, prestige and much paraphernalia. Whole trains were available to the section at an hour’s notice to whisk personnel and equipment anywhere in the United Kingdom. 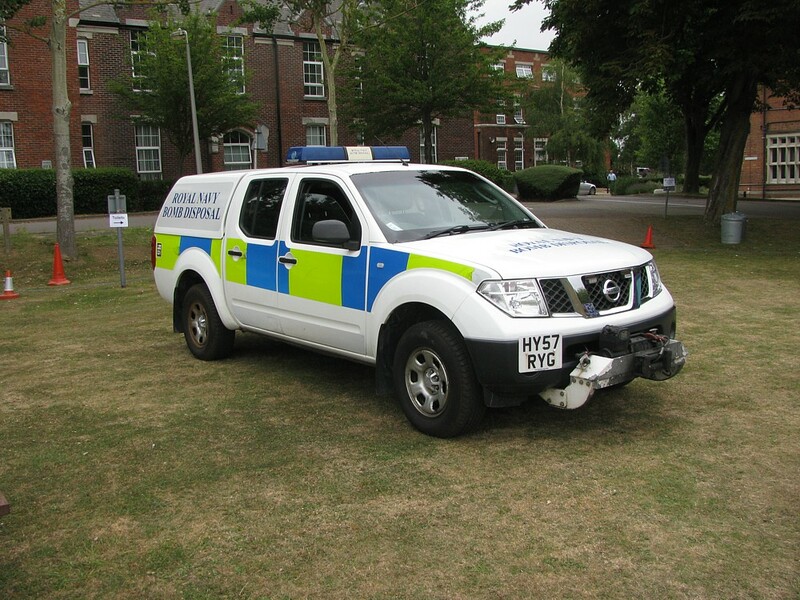 Humbers, festooned with blue priority lights, magnetically operated bells and fitted with War Office number plates had replaced the left-hand drive Fords. Tools were now really magnetic. A secret telephone was installed with a priority only second to Cabinet. 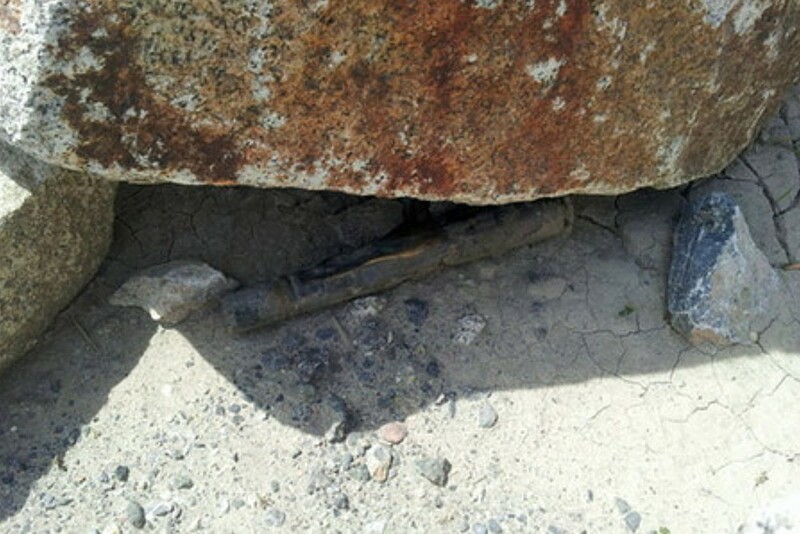 The Land Incident Section was still mainly a disposal force. Outposts were established in Edinburgh, Glasgow, Liverpool, Leeds and Bristol and markedly reduced the time taken to arrive on site. 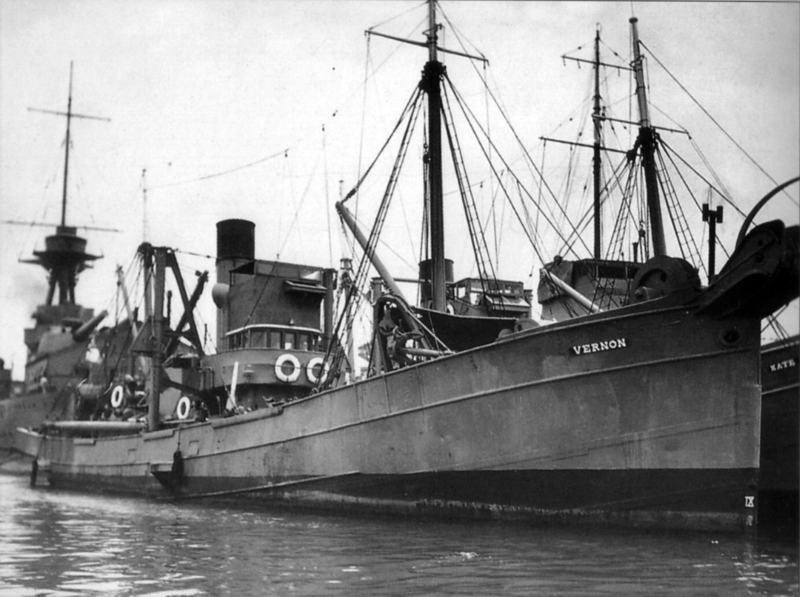 New mines were reported to Vernon whose privilege it was to attempt recovery. In September 1944, the duties performed by DUBD were taken over by the Director of Torpedoes and Mining (DTM), the new department thus formed being known as DTM (Bombs and Mine Disposal Section). 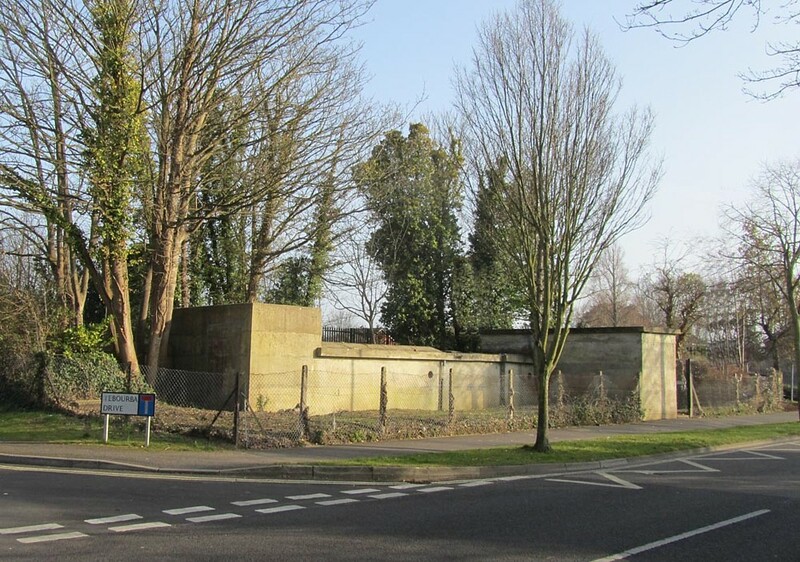 This new branch, based at HMS Vernon, thus controlled the BSOs (Bomb Safety Officers), RMS (Rendering Mines Safe) personnel (who were already an integral part of DTM) and the Land Incident Section. The organisation continued until disbanded at the end of the war. 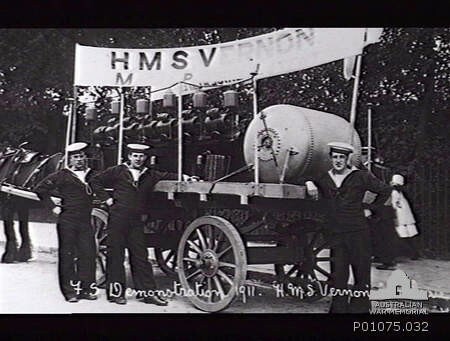 The personnel of these units are among those we intend honouring with Project Vernon, the campaign to erect a monument at Gunwharf Quays in Portsmouth to commemorate the minewarfare & diving heritage of HMS Vernon which previously stood on the site. Please donate generously via this webpage (not forgetting to complete the Gift Aid registration which adds 25% to your contribution) or buy some of the merchandise available via this webpage. The miniatures of the monument are particularly recommended. The Royal Navy website contains this article and the Portsmouth News website this article describing the supersession of MCDOA member Justin Hains by fellow member Simon Pressdee in Command of HMS Ledbury (MCM2 Crew 6) on 2 September. 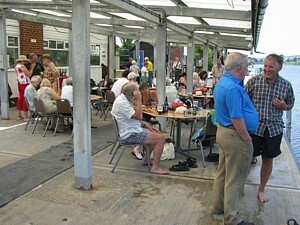 The wind and the rain ensured the public did not sit for too long on the beach this weekend. 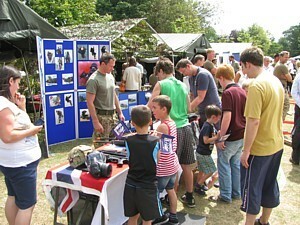 So we enjoyed good numbers of visitors on Saturday (42) and Sunday (42). Ex-CD Alan Broadhurst called in with his family on Saturday. 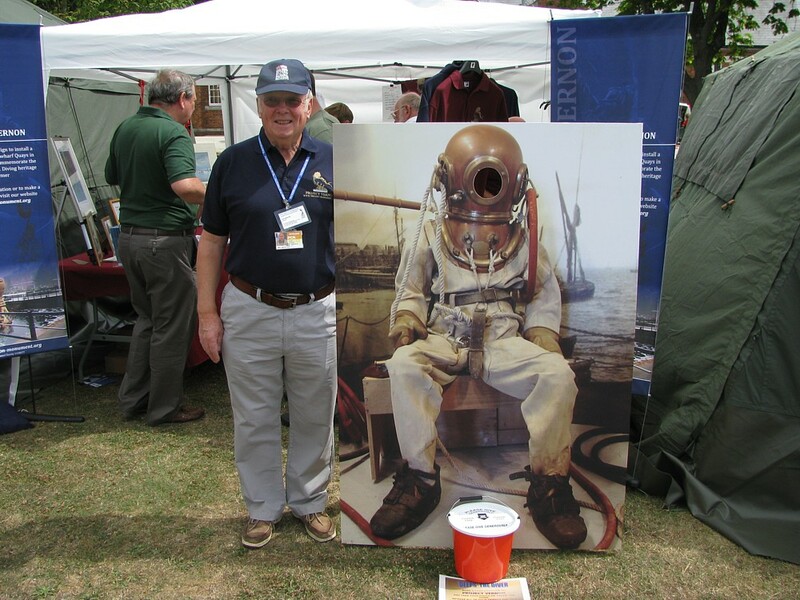 He is well-known for being one of two of the unfortunate divers who passed out in HMS Reclaim's diving bell back in 1970 owing to being given the wrong gas and when the crew suddenly discovered they did not have any means of getting in to the bell to help them. The full story has yet to be told. 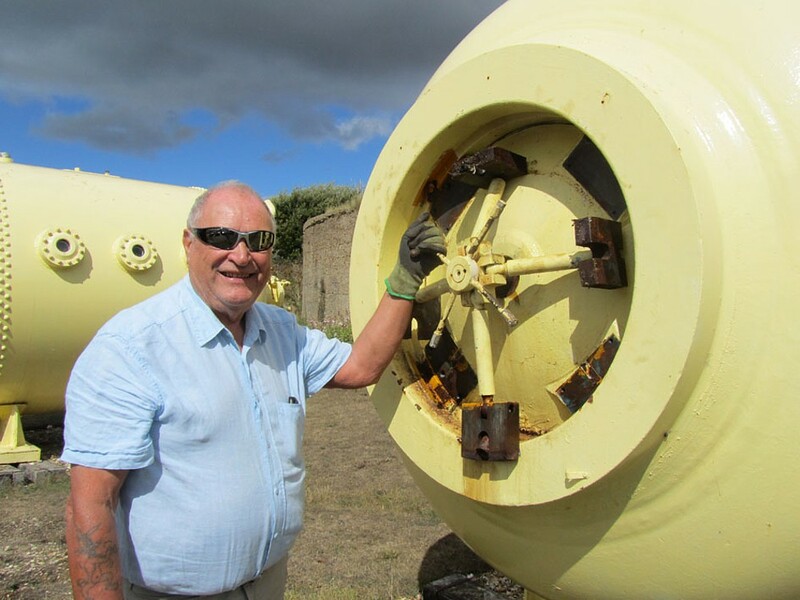 Jim Thomson has successfully managed to re-open the lock door on the ex-RNPL 690m chamber after destroying several sockets and spanners in the attempt! This was after managing to 'recommission' the medical lock as well. Don't forget to watch Who do you think you are? on BBC1 at 9pm on Wednesday evening when HDS members are dragged in to help her investigate her descent from a famous Whitstable diver! 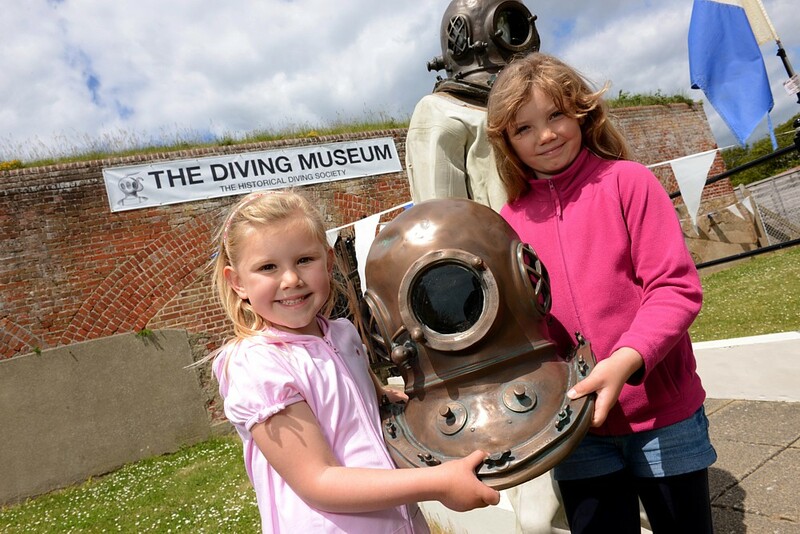 The Diving Museum will be open for four days this coming weekend, Thursday to Sunday, 12 - 15 September, free of charge. We usually get several hundred visitors on these events so if you can help, please do. Just had a nice browse through your website and saw the article on Alan Broadhurst and his family's visit to the museum. You mentioned that he was one of the divers that had an extended stay in the transfer chamber. I dropped an old S.288 from HMS Reclaim into the museum and it records that particular dive. I included a little missive with it titled Dive No. 61. Bob Frazer was our Chief, thankfully, but because of a leg injury I was the controller for that dive. Now having a background in the deep diving world, I look back and wonder how we managed to get them all safely to the surface, especially the two extra people we locked in to help them, one who had never been under pressure before. Anyway, I hope to be in Portsmouth in November and if we get the chance, and you're interested, I'll tell you all about it and why it happened. Following the gathering of the London division of the MCDOA in town on Thu 05, I thought I'd forward a few snaps of the happy gathering. 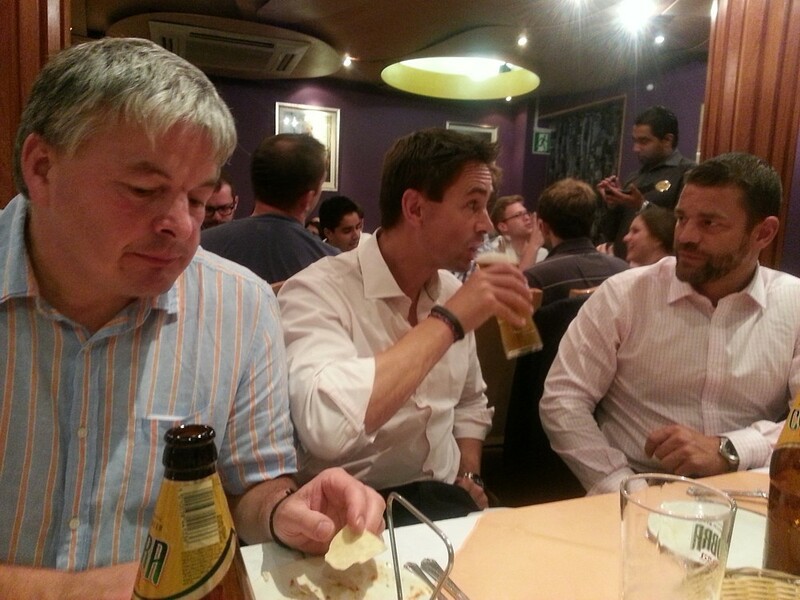 We mustered at a popular pub in Covent Garden before enjoying some of London's finest North Indian Cuisine and righting the wrongs of the world over a few glasses of Cobra! Attendees were: Andy (Sharkey) Ward, Kim Godfrey, Jason Poole, Peter Greenwood, Martin Mackey, Stuart Robinson, Al Nekrews, Dave Hunkin, Chris Baldwin, Keith Broughton and Chris Ashcroft. I'm going to try to make the London event a more regular occasion and am hoping to organise a similiar bash for the end of March 2014, date and location to be announced in due course but I'll update nearer the time. 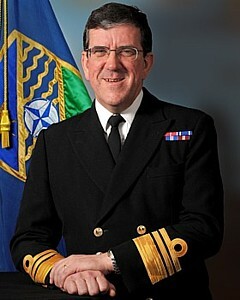 Admiral Sir John 'Sandy' Woodward KCB GBE. A Thanksgiving Service for Admiral Sandy Woodward will be held in Chichester Cathedral on Thursday 14th November at 2.30 p.m. The service will be followed by a reception in the Cathedral precinct. It will be much appreciated if those who are wishing to attend could email Tessa Simpson at Admiral.woodward@btopenworld.com. 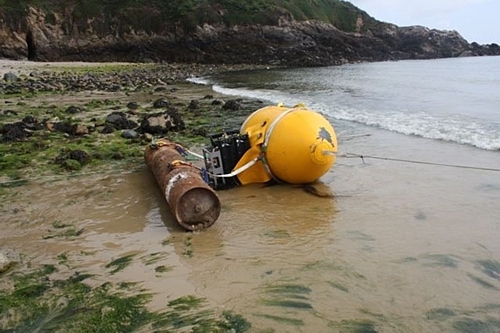 The Western Daily Press website contains this article describing a callout for members of Plymouth-based Southern Diving Unit 1 (SDU1) to deal with an item of suspected ordnance near Lynmouth in North Devon. The Portsmouth News website contains this article (only part of a two-page spread published in today's hard copy version) describing the operations of HMS Dragon with HMS Quorn (MCM2 Crew 7) and the other three RN minehunters currently deployed in the Gulf (see entry for 22 Aug 13 in News Archive 43). The Royal Navy website contains this article describing the participation of HMS Blyth (MCM1 Crew 2 commanded by MCDOA member Ash Spencer) and HMS Brocklesby (MCM2 Crew 3) in the Regional Forces West Exercise 2013 at last weekend's Bournemouth Air Festival. 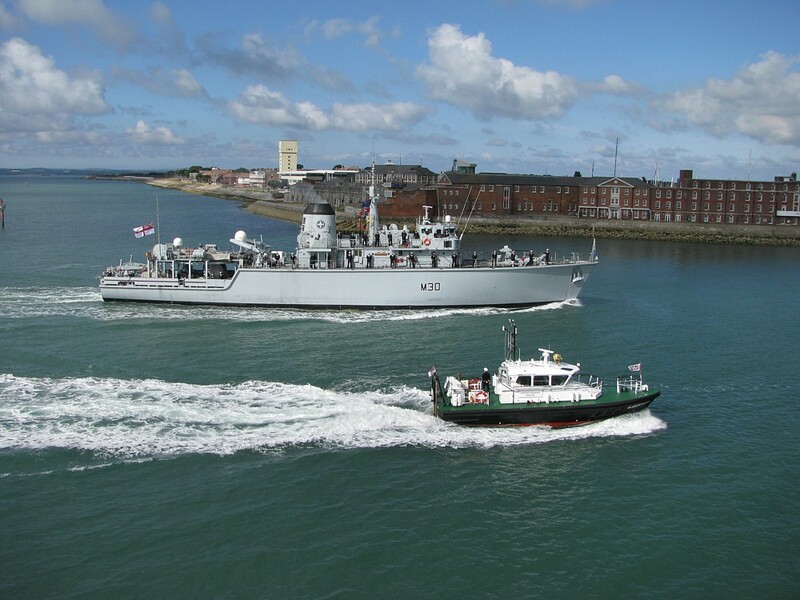 Other ships included HMS Northumberland and HMS Mersey along with URNU vessels HMS Blazer and HMS Smiter. 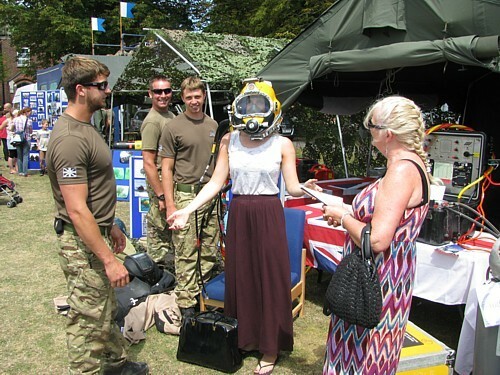 HMS Blyth was originally programmed to be the guardship for the Dartmouth Regatta but this duty was undertaken by HMS Chiddingfold (MCM2 Crew 5) instead (see entry for 28 Aug 13 in News Archive 43). I am grateful to David Morgan of Lampeter in Wales for sending me two photo albums belonging to his late grandfather, Cdr Rupert W James RN who died in 1961. The albums cover Rupert's time as Head of the Controlled Mining Section of HMS Vernon both before and during the Second World War although he and his group were evacuated to Hillside House in Purbrook for much of the Blitz on Portsmouth. "…Soon after the full outfit of 192 mines had been loaded, Lieutenant Commander R W James, who had taken a leading part in the operation, had decided that it would be expedient to embark extra fire appliances. As James sat in his office telephoning the order to the Naval Stores Officer, a civilian officer burst in, interrupting the telephone conversation. “Keep cool! Don’t get excited!” the civilian shouted. 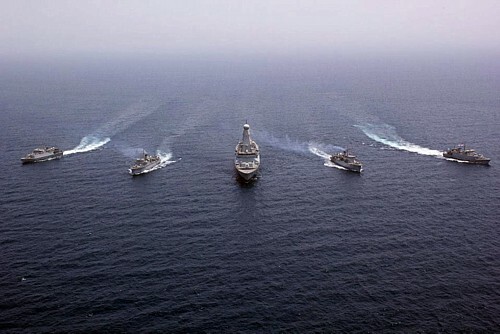 The establishment of net and loop defences at the Mediterranean Fleet anchorage was of paramount importance. On 11 October 1935, two weeks after Altreus had arrived in Alexandria, two guard loops had been laid and were in operation controlled from a station ashore. It was a truly memorable achievement but one that was little appreciated…"
I will publish a selection of these wonderful photos when I have fully digested the contents of the albums. As a taster, here are some elements of a controlled minefield prepared for laying. The first photo was obviously taken in Vernon Creek. Definitely Vernon Creek. Those pontoons remained unchanged through the years! 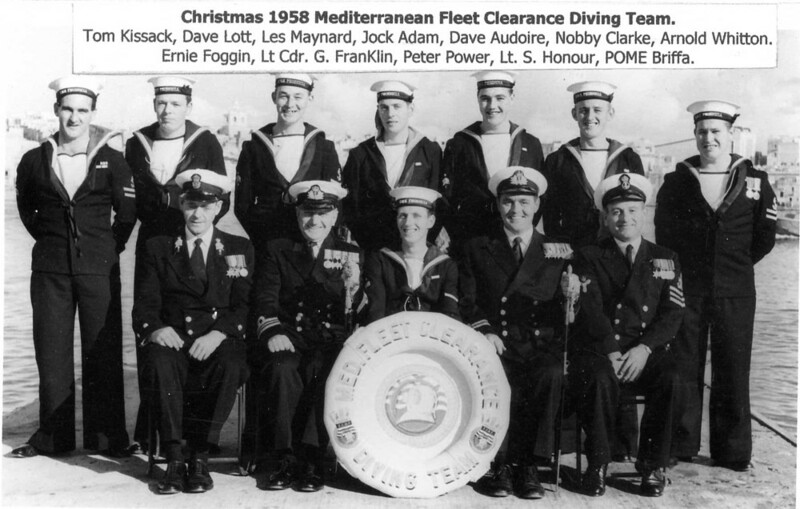 I am also indebted to Peter 'George' Alderton for sending me photos chronicling some of his eventful diving career including his time in the the Plymouth Command Deep Diving Team, Flag Officer Scotland & Northern Ireland's CD Team, the Mediterranean Fleet CD Team, the Far East Fleet CD Team, the Joint Services Bomb Disposal School at Horsham and as a civilian diver with Sub Sea Offshore. He served in the Royal Navy between 1953 and 1976. In February 1953, I joined HMS Vernon for a CD3 Course. Six months later, six ABs had qualified out of the total from three Port Divisions: three each for the Med and three for Hong Kong. AB Chaplin, AB Sayer and I sailed from Liverpool on board an Oz emigrant ship, MV Cheshire, arriving in Hong Kong during the Great Shaukiwan fire: 50,000 homeless. Eric Gash was the OIC of FECDT which was still using 'P' Party apparatus. CDBA was still in sealed boxes in the lay-apart store. We three commissioned them. Harry Wardle now OIC. There was no CD presence in Singapore and we would take passage in HMS Comus for ten-week visits to conduct conversion courses (SALVUS to UBA) and any outstanding bomb jobs. Our main task in 1954 was courses but there was also a very large amount of UXBs of various kinds in Selarang Creek at a depth of 25ft. Another task was to jackstay walk survey from Johore Causeway to Keppel Harbour. Customs and Excise asked us to do a search for contraband lying on the bottom of Telok Ayer Basin. While doing the search, LS(CD) Charles Brian Larkin was attacked and killed by a shark (28 July 1954). 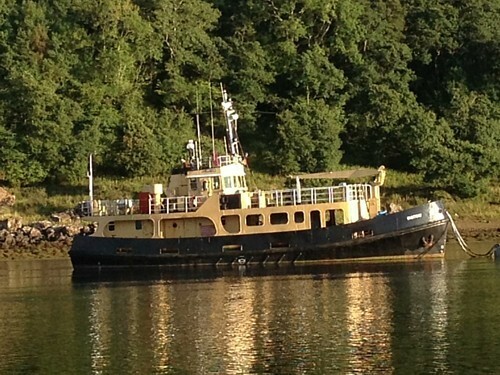 Less than 24 hours later, I was standby diver for the course on HMS Cossack, starboard side to on jetty. 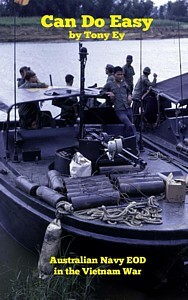 We were port quarter on a landing craft. Diver failed to answer signal and line was taut so in I went. Diver was fouled by starboard prop, hanging 10 ft under it with his mask off. Despite all efforts, he was not saved. Back to Hong Kong on SS Empire Orwell [ex-TS Pretoria]. The second RN diving casualty in Singapore within two days was PO Arthur Spencer Castle Perkins, the Barrackmaster of HMS Terror. His death from drowning was reported here in the Straits Times of 1 August 1954. The Navy News website contains this article announcing the unveiling of the 'new' funnel badge to be worn by ships of the RN MCM Force in the Gulf (see entry for 25 Aug 13 in News Archive 43). 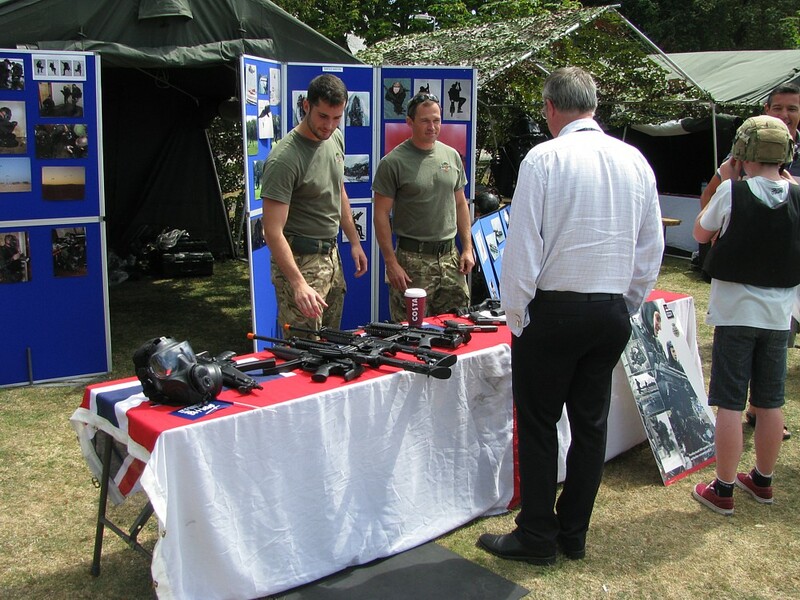 This initiative was the brainchild of MCDOA member Martin Mackey, Commander UK MCM Force in the Gulf last year, and the article features MCDOA member Neil Marriott, the present incumbent. Postscript: On 5 September, the Royal Navy website published this article covering the same story. 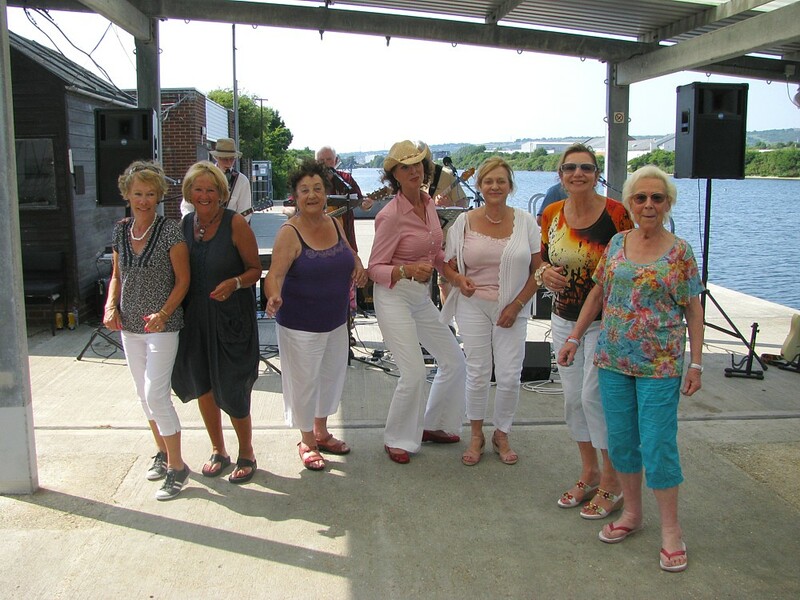 The sunny weather ensured a good weekend with 38 on Saturday and 32 on Sunday. 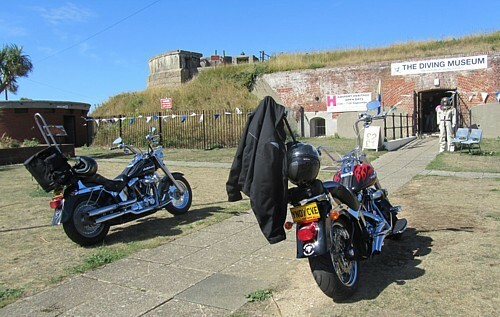 We were even treated to a visit by four bikers (Harley Davidsons) who had come all the way from Lincoln. Bill Norton made a return visit and brought some more, most valuable records of experimental saturation diving for the Reference Library. HDS member John Buxton has generously donated an iconic SG compressor from yesteryear. It needs a little TLC to make it look a little more respectable. Could you take on the project? 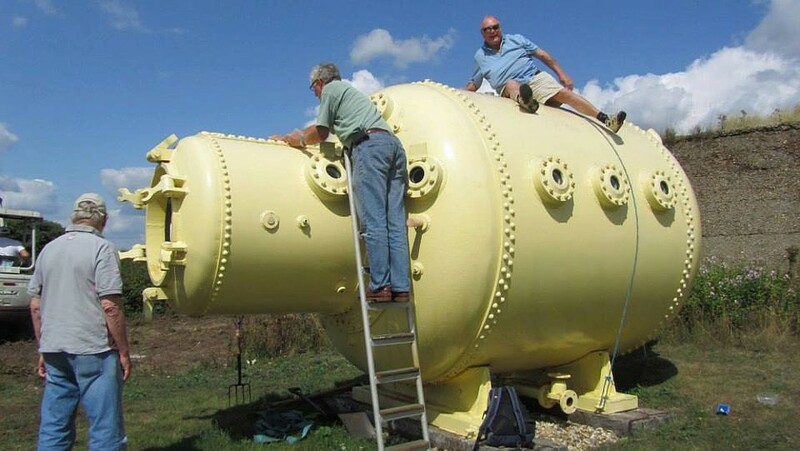 It has been decided that we are not in a position to accept the kind offer of the RN Submarine Museum to take on the LR3 submersible. The main reasons are the considerable cost to move it and the huge maintenance responsibility that would come with it. The space we had prepared can now be made available for other external exhibits. For those interested, there are a number of helmets along with an autographed Davis book, some knives and boots coming up at the next Charles Miller auction, 30 October: www.charlesmillerltd.com. 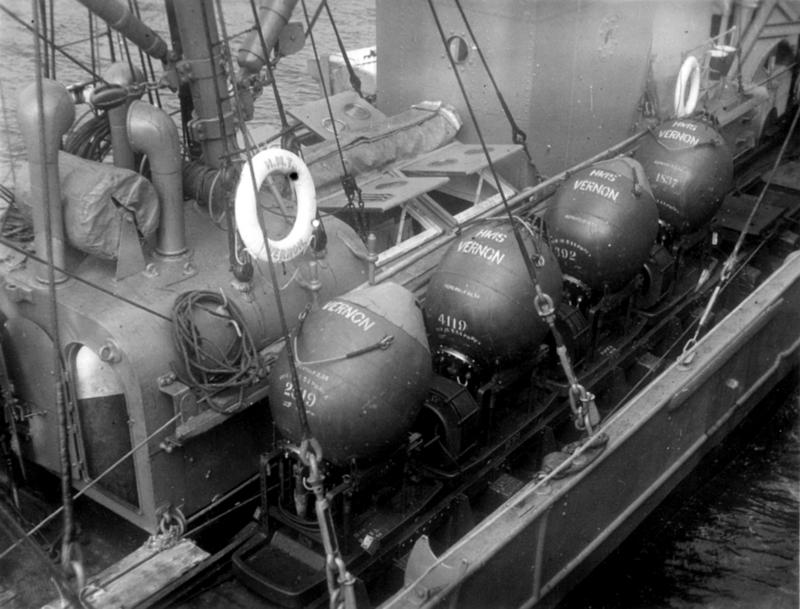 The Plymouth Herald website contains this article describing the disposal, presumably by members of Plymouth-based Southern Diving Unit 1 (SDU1), of part of a Second World War German mine trawled up by a fishing vessel south of the Mewstone off Plymouth. The MCDOA website has increased its following for the fourth month running. During August, it was accessed by 42,303 distinct host servers, the first time this statistic has exceeded 38,000. The number of people accessing the site is likely to be even higher as many servers (e.g. MoD, US military, etc.) are shared by several users. 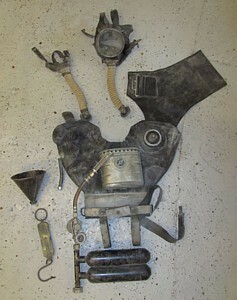 MCDOA associate member Dr John Bevan, Chairman of the Historical Diving Society (HDS), has announced that my old acquaintance, retired Danish Army Engineers Corps diver Sven Eric Jorgensen of the Danish HDS, has donated a DC 55 rebreather in its original case to the UK HDS Diving Museum in No.2 Battery at Stokes Bay. 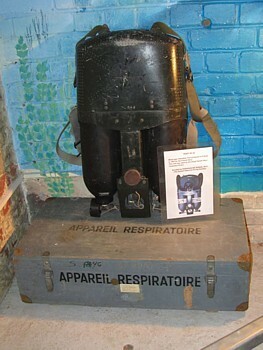 This silent, non-magnetic semi-closed circuit breathing apparatus was designed by Duffaut Casenave in 1955 (thus its designation) and was manufactured by Spirotechnique. 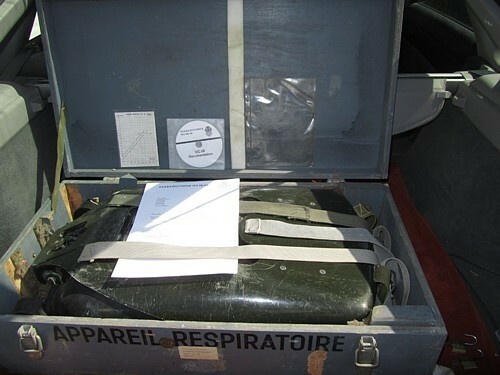 Many in our community will have seen it used by French naval clearance divers among others. 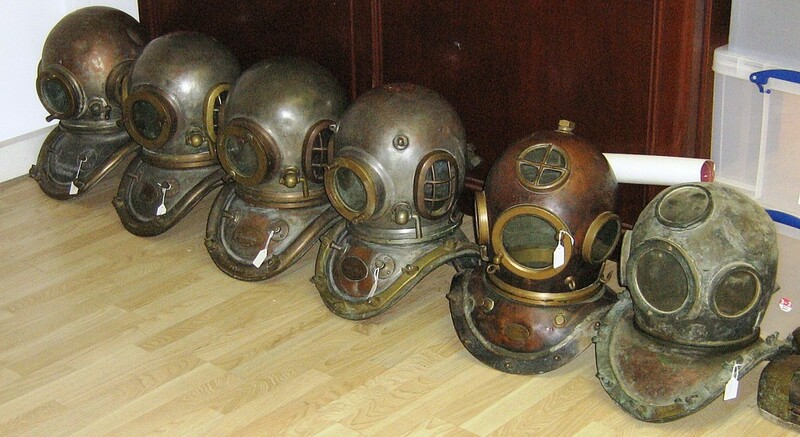 This set will be a valuable addition to the museum's already impressive display of naval and military diving apparatus maintained by former FCPO(D) John Dadd BEM and ex-CD Jim 'Tommo' Thomson. 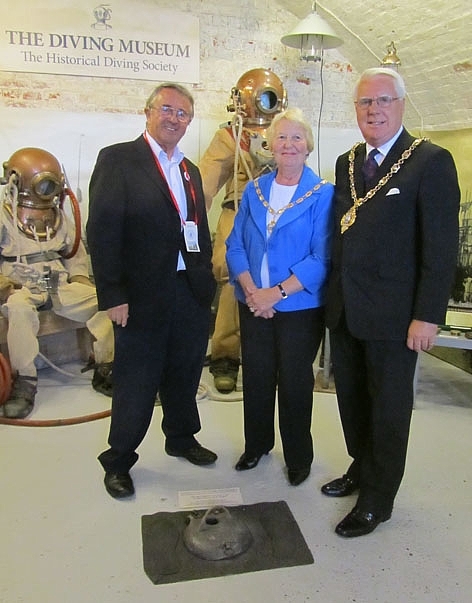 John Bevan has also announced that the new Mayor and Mayoress of Gosport, Councillor John and Mrs Christine Beavis, will make an official visit to the Diving Museum on Saturday 14 September. 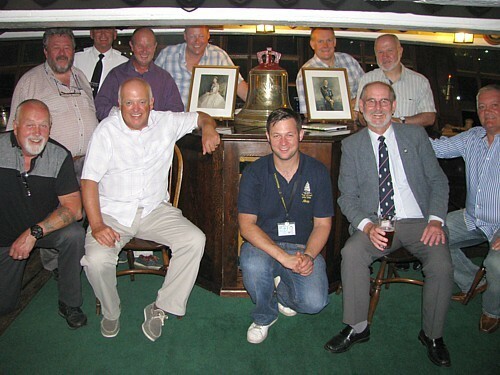 I am grateful to Nick Dewing and Ricky Nelson, members of HMS Victory's ship's company, for hosting some of their fellow members of the Minewarfare Association (MWA) in the Chief Petty Officers' Mess last night. Not for the first time, it was a pleasure and a privilege to attend an informal MWA gathering on board the oldest commissioned warship in the world. Dual-MCDOA members present included Bill Kerr, Steve Brown and Yours Truly (Rob Hoole). Other MWA members comprised David 'Bagsy' Baker, Phil Brace, John 'Hydra Joe' Erskine, John Gunter, Paul 'Taff' Reader and Pete Whitehead. Many happy returns to Phil Brace who was also celebrating his 58th birthday and was accompanied by his wife Sue, the bar manager of the WOs' and SRs' Mess at HMS Excellent. 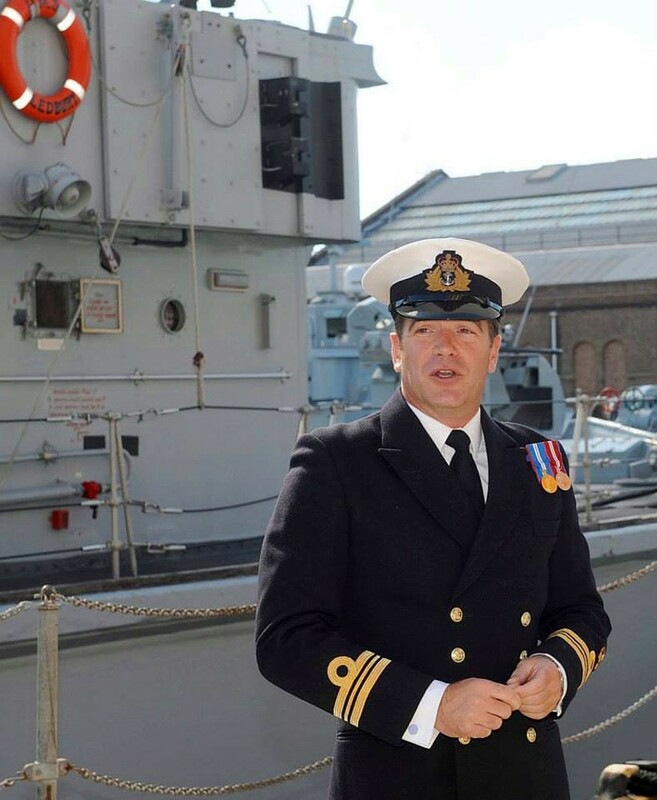 "I am writing to introduce myself as the new Commanding Officer of MCM2 Crew 2 and HMS CATTISTOCK having taken over from Lieutenant Commander Steve Higham at the end of June. First of all, a short introduction to myself: I have served in the Royal Navy for just over sixteen years, spending most of that time at sea in a variety of ships. My career has taken me all over the world, from the South Atlantic to the Pacific but in particular the Indian Ocean and the Arabian Gulf. 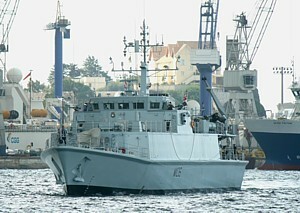 Earlier this year, CATTISTOCK returned to the UK from a NATO deployment to the Mediterranean. Since then, we have continued to be extremely busy and are preparing for our next deployment; we have conducted essential maintenance and are about to commence a period of training and assessment on the West coast of Scotland with the staff of Flag Officer Sea Training. Following our workup, Crew 2 will deploy to the Arabian Gulf at the beginning of December. HMS CATTISTOCK will remain in the UK to commence a refit and my crew will take over HMS ATHERSTONE, which is currently based in Bahrain. The Arabian Gulf is familiar to many of the ship's company but our deployment will certainly present fresh challenges to us all. The region remains vital to the UK and the continued presence there of our minehunters, frigates, destroyers and auxiliaries reflects the Royal Navy's commitment to protect our interests there. Although other regions of the world may be drawing the headlines at present, the Arabian Gulf always remains not only an essential source of energy and trade but also a potentially volatile area and everyone is fully aware of that as we continue our preparations. The deployment promises to deliver a wide range of tasks, from advanced training with our allies in the region and multi-national exercises to flying the UK flag in visits to foreign soil. 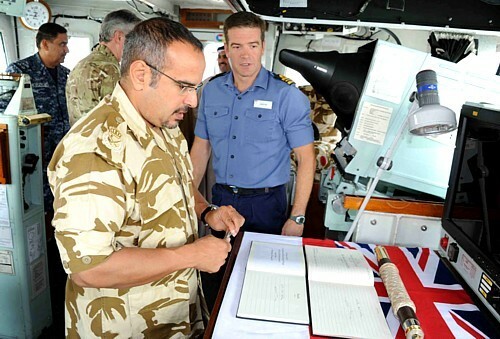 Looking to the future, past the Arabian Gulf deployment, I am now in a position to confirm that Crew 2 will return to HMS CATTISTOCK in July 2014. By that point, she wiil be part way through a major refit designed to keep her on the front line for another ten years. The refit is likely to mean the ship will be in dry dock in Portsmouth for some time and will present us with the opportunity to renew and refresh our affiliation to you in the latter half of next year. The ship's company has always appreciated our affiliation and feel it is very important to maintain our close ties. I will write to you before we deploy to the Arabian Gulf but in the meantime, I would be delighted to hear back from you with any news or stories you would like to share with the ship's company. 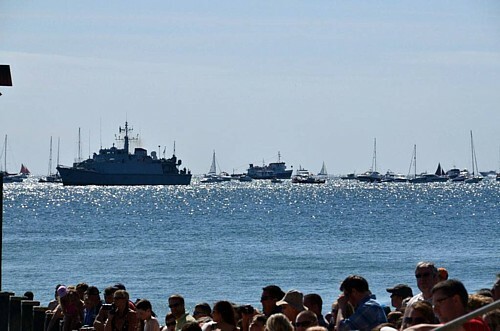 The Royal Navy website contains this article anouncing tomorrow's arrival of HMS Chiddingfold (MCM2 Crew 5) to act as guardship for the Dartmouth Regatta (see entry for 24 Aug 13). She will be open to the public 1000-1200 and 1330-1600 on Saturday and 1000-1300 on Sunday with regular transfers out to the ship on a first-come, first-served basis. A bumper Bank-Holiday weekend was enjoyed by 46 on Saturday, 53 on Sunday and a massive 66 on Monday! 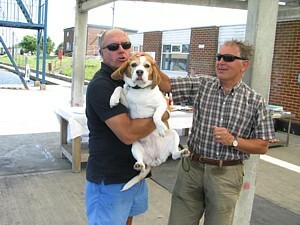 Lt Cdr Bill "Chippy" Norton RN swooped in on us from sunny Spain on Sunday. He's pictured here with our very own Dusty Miller of similar vintage. Bill also generously donated a pile of books and reports to the Reference Library. John Buxton, famed cave dive, called in on Saturday and dropped off a Siebe Gorman air compressor and a few other items. 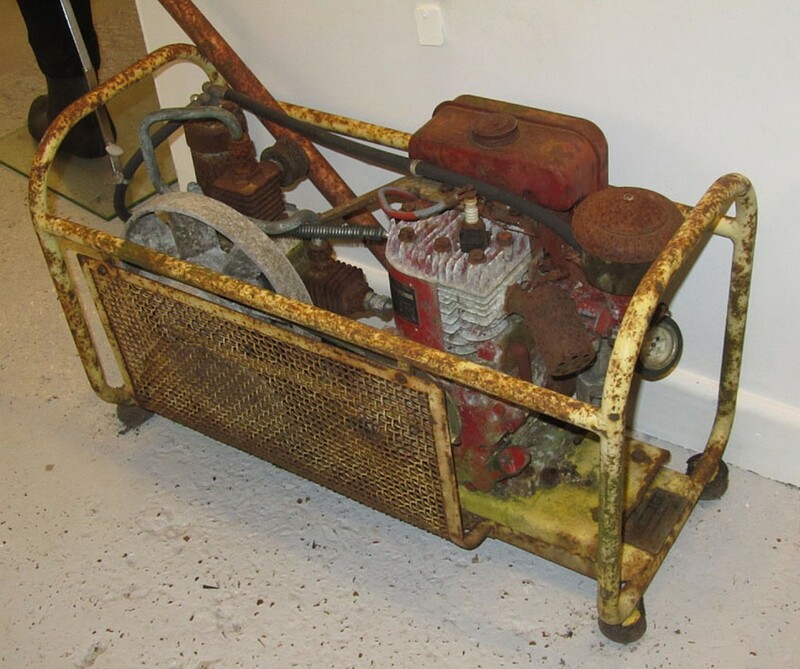 The tiny compressor (1 cu ft / min) could do with a wire brushing and repainting if anyone would like to take it on as a project. It's a real piece of diving history. 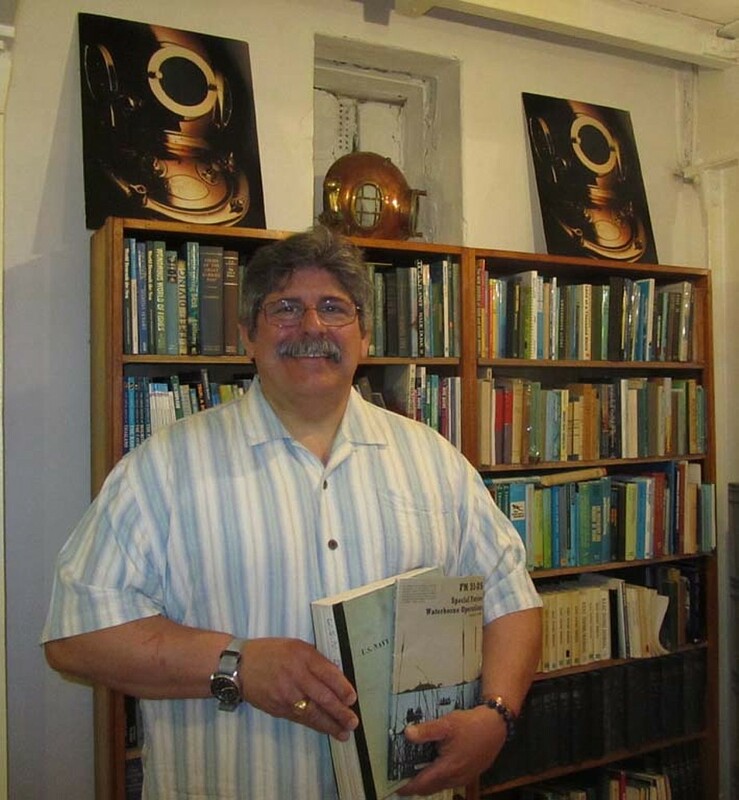 Thanks also to Gavin Anthony [MCDOA associate member] who dropped in three boxes of archived experimental diving reports etc for the Reference Library. 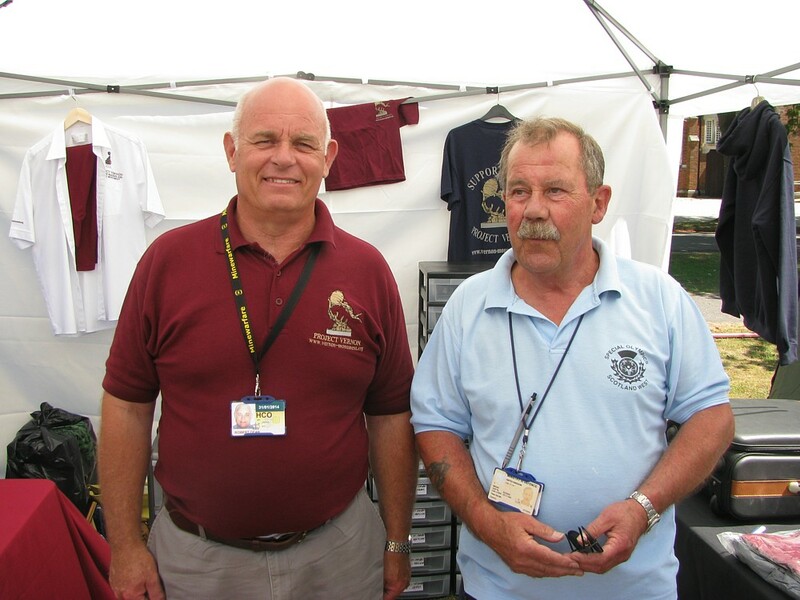 The HDS Museum relies on a handful of volunteer guides, at least two but ideally three of whom need to be on site when it is open for business at weekends during the summer. If you live locally and can spare the odd few hours, please contact John Bevan via this email address or call him on 07802 785050. You will then be given access to the online roster to fill in your own dates as and when you are available. You don't have to be an HDS member to get involved in this or any other way. The Portsmouth News contains this article describing Sunday's disposal, presumably by members of Portsmouth Based Southern Diving Unit 2 (SDU2), of a wartime 500 lb bomb off Selsey in West Sussex. Today's Daily Telegraph contains this obituary for sub-sea equipment entrepeneur Mike Borrow who died on 16 June at the age of 84. It was written by Maurice 'Mo' Byham, an ex-Fleet Air Arm aircrewman and rescue diver who left the Royal Navy as a commissioned helicopter pilot in 1968 to pursue a highly successful career in subsea operations in the North Sea oil and gas industry. Among his many other achievements in diving, Mike Borrow was the founder of Underwater Marine Equipment (UMEL) and conducted the first commercial oxy-helium dive in Greece in 1963. 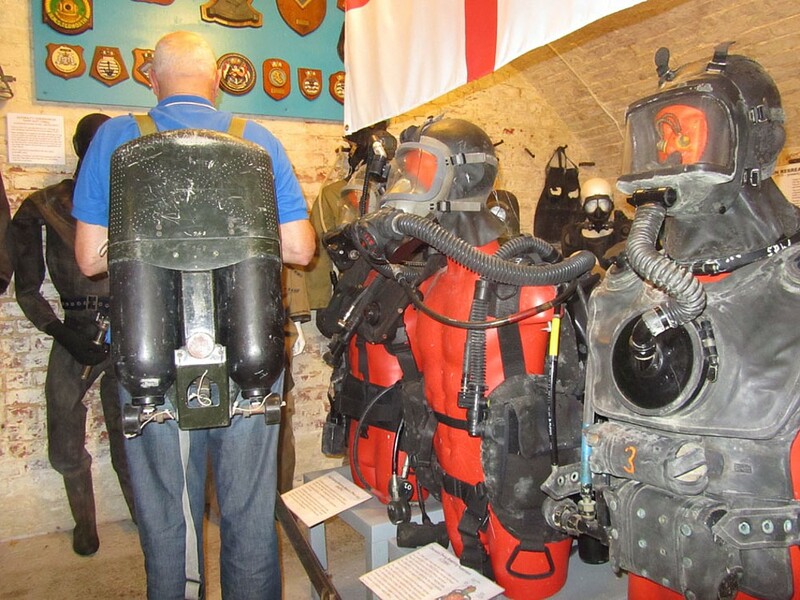 Most prominently, he invented the highly successful JIM atmospheric diving suit, capable of exceeding a depth of 600 meters, which was first trialled from HMS Reclaim in 1972. The suit featured in the James Bond film For Your Eyes Only in 1981 and was used to help salvage a Wellington bomber from the bottom of Loch Ness in 1985. 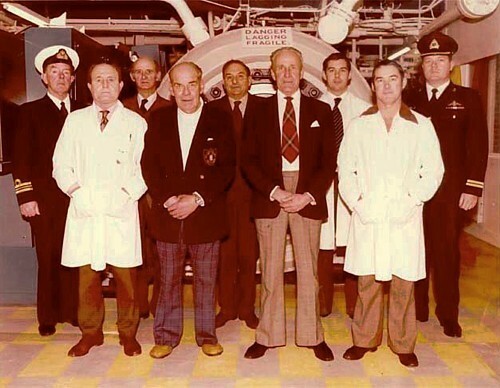 Mike's funeral, held at Guildford Crematorium on 25 June, was attended by many eminent figures from the world of underwater technology. I am sure all members of our community will join me in extending our deepest condolences to his widow, Frances. From an early age, Mike was fascinated with all things nautical and aeronautical. At the age of three he watched a civil air display from his home in Chingford, and was fascinated by the enormous R101 and R100 airships as they roared overhead to the Bedford Airship Mooring Tower. Mike attended Bancroft's School in Woodford Green, Essex from 1938-44. As part of the war effort, he joined the National Association of Spotter’s Clubs, part of the Royal Observer Corp and achieved the distinction of being able to recognise over 90% of aircraft. In 1943 he joined the Navy League Sea Cadets and gained his certificate in seaman gunnery, again being recognised for a ‘superior performance’ on the 20mm Oerlikon Sea Gun. In 1944, he realised his dream to join the Merchant Navy. Apprenticed, at 16, to the Hain Ltd Cargo Ship Company, Mike sailed the seas from the Clyde to Lagos. By 1950, he had left the service and joined Stanford's, the marine cartographers, editing and updating coastal navigation charts and recording natural hydrographic activity. 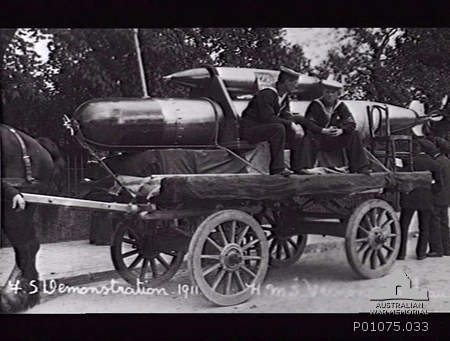 From Stanford's, he joined RFD Beaufort where his work involved developing the use of inflatable craft, marine and aircraft life-crafts. 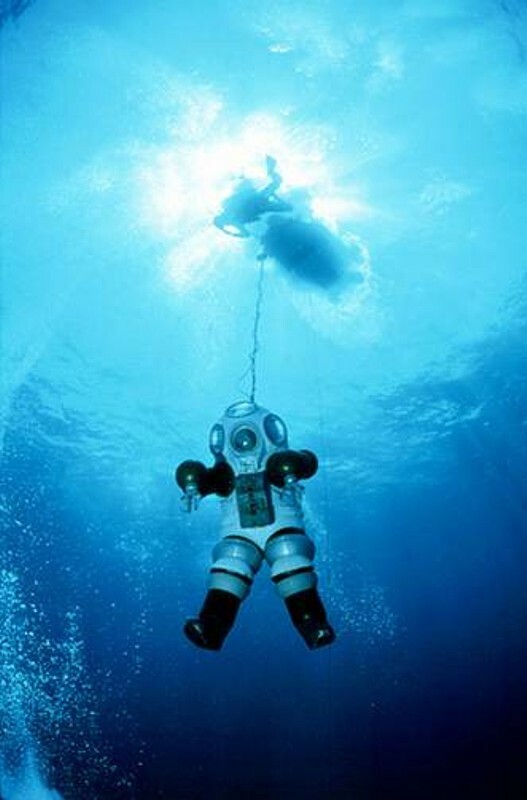 submarine escape and even early space suits. 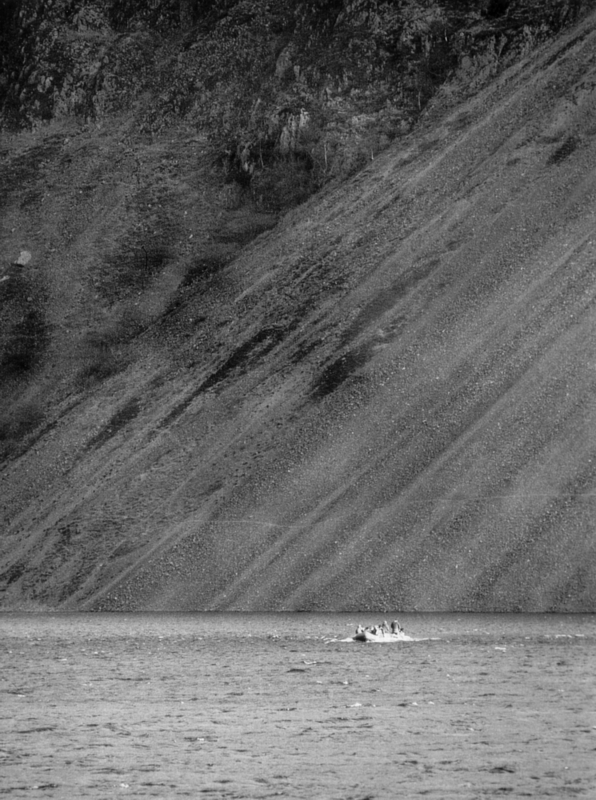 An advertising stunt that Mike suggested for the cigarette maker, Wills, brought more attention to the adaptability of inflatable boats than the cigarette brand! Cruising along the south coast with the mast advertising the cigarettes, Mike found himself offering assistance to stranded boats or swimmers in difficulties. This potential for inshore rescue was recognised by the RNLI and Mike worked with them to develop the new age of rescue lifeboats! Mike also acted as an industrial agent for C.E. 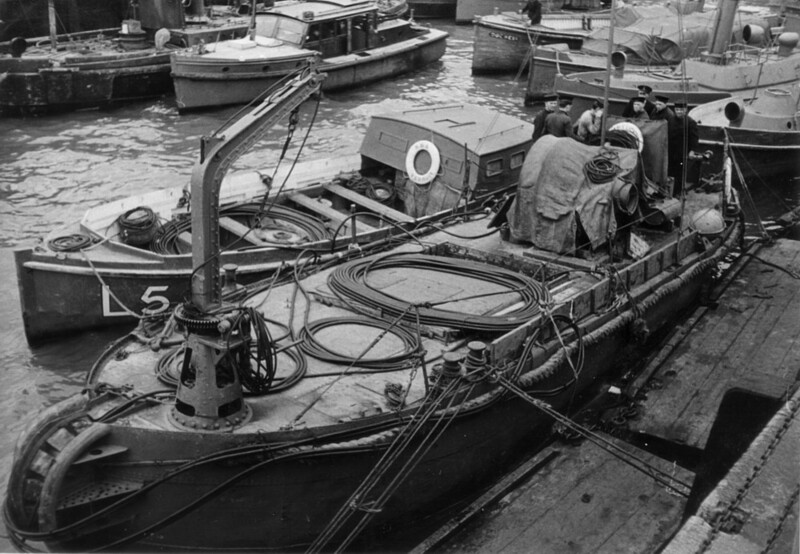 Heinke, selling diving apparatus, (standard, harbour and self-contained) to dock and harbour authorities, salvage and diving contractors, government and the military. Through this he regularly met with Cdr “Buster” Crabb, the retired naval diver who subsequently disappeared in mysterious circumstances the day after they had one of their regular meetings together in London in 1956, Mike had no idea what he was up to! 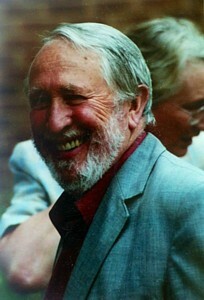 Mike Borrow was the co-founder of the Archaeological Diving Group in 1953. 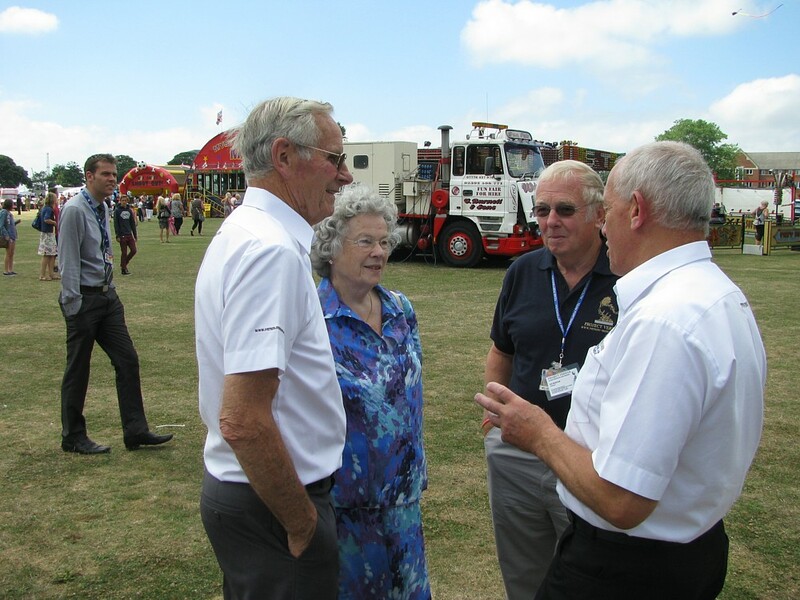 In 1959, he formed his own company, UMEL (Underwater Marine Equipment Ltd.), initially in Essex, then in Fleet, later in Farnborough and finally in larger premises in Borden. 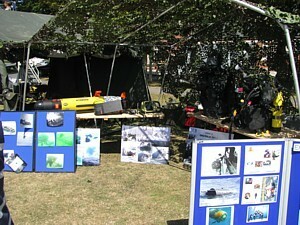 Development of a wide range of subsea equipment and tooling progressed over the forthcoming years, they developed the first flexible habitat for underwater welding and a complete acrylic habitat for the Daily Express at the International Boat Show that was subsequently donated to Royal Engineers; in 1963 he coordinated the first commercial oxy-helium dive in Greece. In 1960 UMEL were the first to use a proton magnetometer underwater and in 1963 built Thumper, the first commercial sub bottom profiler, for the English Channel survey. During this period Mike was also a director at Underseas Ltd., which was surveying for the channel tunnel but in 1963, he resigned his directorship to concentrate fully on UMEL. Mike Borrow’s interest in solving subsea problems took many routes. The loss of the Comet airliner In October 1967 created the requirement for acoustic marking of aircraft Black Boxes to enable swift search and recovery. UMEL had previously contacted the Ministry of Aviation in 1961 with the proposed solution but following initial discussions nothing more was heard. The New Scientist column ARIADNE highlighted the fact that, despite continued contact by Borrow with the Board of Trade, nothing of substance was forthcoming, as the various government departments had not responded to correspondence files. ARIADNE suggested that perhaps “pingers” should be attached to the files until they had been answered. In 1985 the saga continued with ARIADNE highlighting continued involvement by UMEL following the Air India crash that year. In 2009 Mike continued his campaign following the Air France disappearance of flight 447 from Rio de Janeiro. Mike Borrow continued his business interest in subsea equipment but had never dived so UMEL pursued the route of one-atmosphere subsea operations. With Lintott Engineering they designed and built SURV, the first British commercial manned submersible. 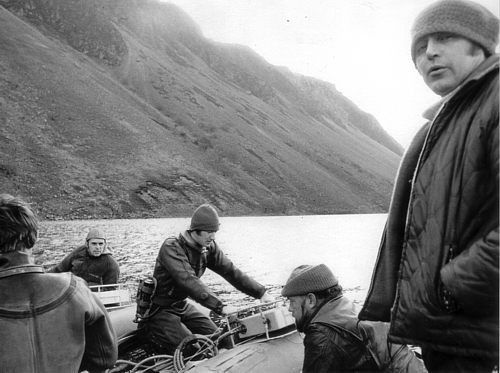 The development commenced in 1964 and trials and demonstrations took place on the south coast and in Scottish lochs in ‘67 and ’68 with the RN, AUWE and the Institute of Oceanography. 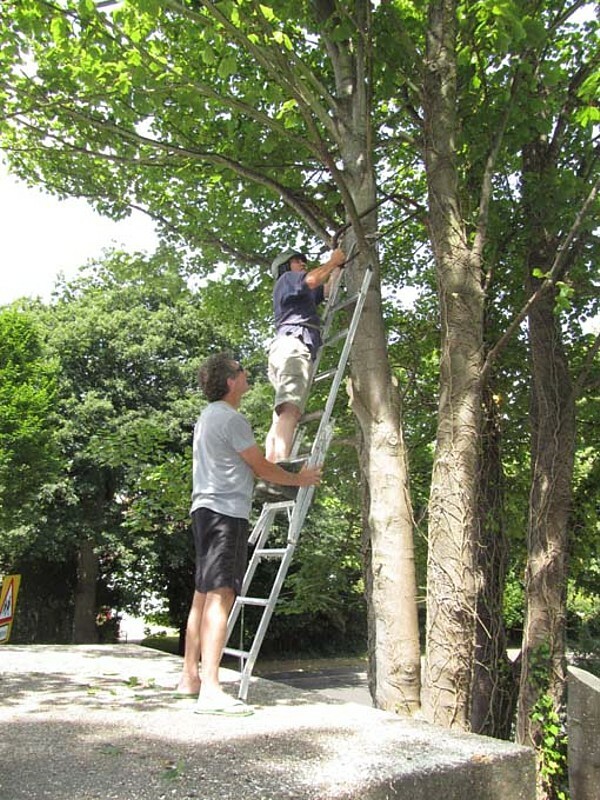 Technical problems, together with the inevitable financial pressures on a small company, proved insurmountable and the SURV project was subsequently abandoned. SURV finally took pride of place in the Science Museum. The SURV development brought its benefits to UMEL, Mike Humphrey, a young ambitious engineer, joined the SURV project team as a submersible pilot. 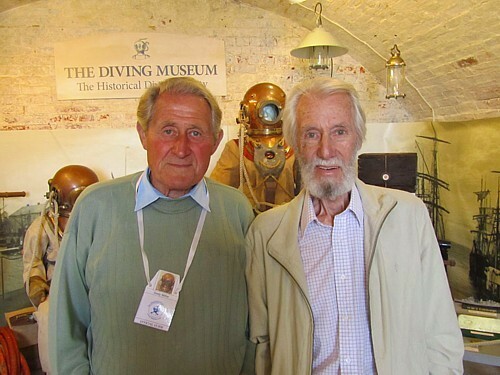 They had met whilst Mike Humphrey was sourcing deepsea camera equipment and pingers for cable route surveys for Cable & Wireless and the two Mike’s went on to be an exceptionally strong team in the future development of stereo camera systems and JIM, the one atmosphere diving suit. 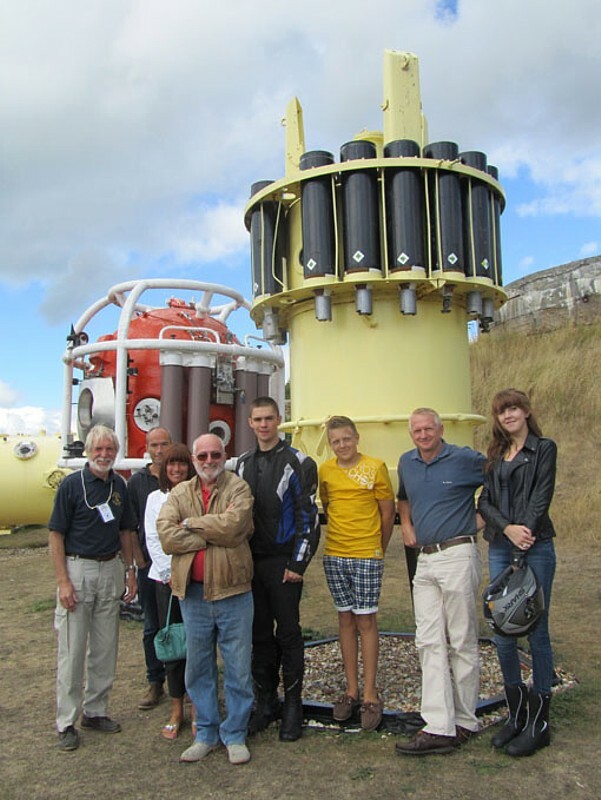 The underwater industry was growing fast and UMEL developed and manufactured a wide range of oceanographic equipment. There were many facets to UMEL’s business including development of high speed remote control vehicles for deployment from submarine torpedo tubes for AUWE, and their state of the art subsea camera systems. However, the JIM one atmosphere diving suit development probably took up most of their time and energy. The JIM ADS was named after Jim Jarrett, who had dived on the Lusitania in the original Tritonia diving suit in 1933, and they persuaded the Tritonia ADS suit developer, “Pop” Peress, to come out of retirement to work with UMEL. NRDC part-funded its development but were unhappy when later the American diving company Oceaneering acquired a 50% stake. Oceaneering were the only serious contender and because they controlled the use and sale of JIM, growth was limited. The only other sales allowed were for non commercial operations and the US and Royal navies bought JIM for submarine rescue and salvage operations. In 1985 UMEL was finally taken over by Slingsby Engineering Ltd, part of BUE Group, and Mike retired from full time business, the equipment and technology was transferred to Kirkbymoorside, North Yorkshire. 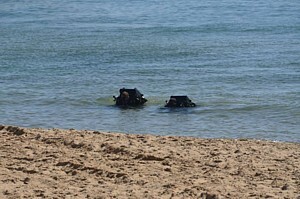 SEL continued the manufacture of the JIM suit and its successors and produced a range of derivatives of the UMEL Seapup remote control vehicle. 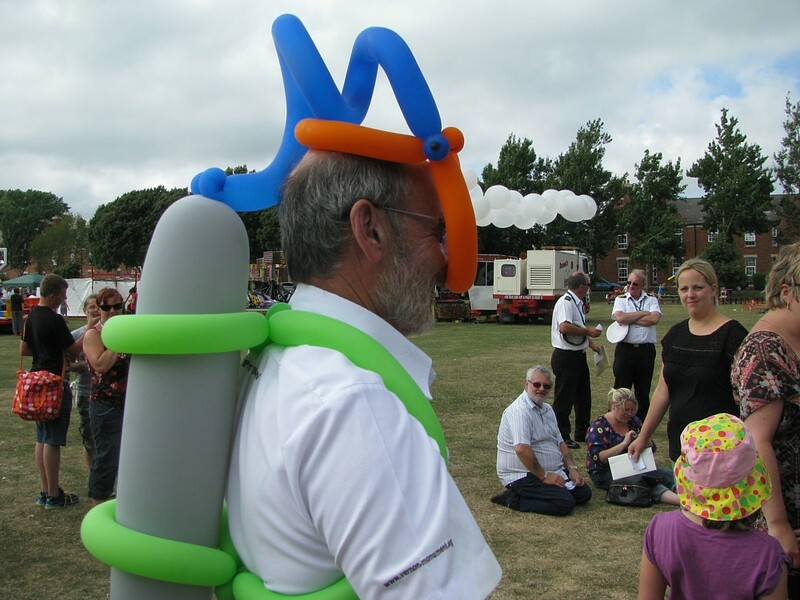 That year Mike was awarded the OBE for his public service to oceanography. 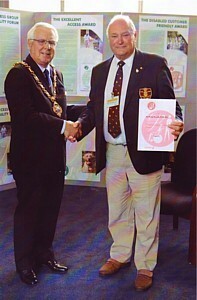 He was a founding member and Fellow of the Society of Underwater Technology and in 1991 was recognised with the Annual Presidents Award, and in 2010 became an honorary fellow of the society. In 1985 the Wellington bomber was salvaged from the deep waters of Loch Ness and JIM, operated by Oceaneering was extensively involved. Following the successful salvage Mike continued his active interest in the Wellington during its refurbishment at Brooklands Museum. Mike helped and inspired many engineers and scientists in their oceanographic endeavours over the years. He maintained his strong interest in people and industry and became a small business counsellor with the Blackwater Valley Enterprise Trust. He gave sound advice on small business start-ups to people in a wide range of industries. Mike was a Rotarian and was an active member of the Hydrographic society. Latterly he also enjoyed his volunteer work with Farnborough Air Sciences Trust and his membership of The Royal British Legion. Mike was still visiting subsea technology exhibitions up to two years ago and past colleagues and old friends always came forward to greet him. Technology had moved on but he was recognised and highly regarded by past colleagues. He enjoyed exploring his old world. Amy, Mike’s first wife, business partner and fellow director of UMEL, died in 2000. He is survived by Frances, his second wife, and his daughter Julia. Daughter Abigail pre deceased him. Mike’s good friend Hans Hass, the Austrian diving pioneer and underwater TV film maker, dived in a JIM suit in the early 80s, and co-incidentally, died on exactly the same day as Mike, the 16th June 2013; we must wonder whether they will be reminiscing about their life in the underwater world. I am grateful to MCDOA member Matt Moore, Commanding Officer of HMS Shoreham (MCM1 Crew 8), for news that the new funnel badge for RN minehunters deployed in the Gulf (see entry for 12 Jul 13) was officially unveiled by Cdre Simon Ancona RN, Commander UK Maritime Component Command (COM UKMCC), in Bahrain last Wednesday. 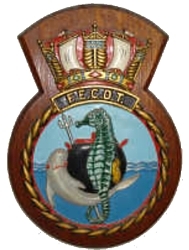 The badge was revealed on the starboard side of HMS Ramsey (MCM1 Crew 6) which was rafted outboard of HMS Shoreham. 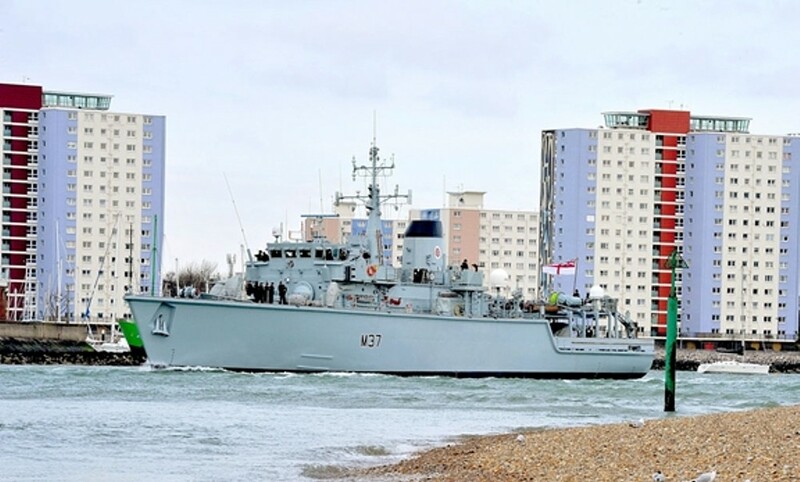 Members of the ships' companies of HMS Atherstone (MCM2 Crew 4), HMS Quorn (MCM2 Crew 7) and RFA Cardigan Bay, together with staff from the Minewarfare Battle Staff, UKMCC and CTF 52, were mustered on HMS Shoreham's port side to witness the unveiling. Bahrain, Qatar and the Trucial States (Abu Dhabi, Sharjah, Ajman, Umm al-Quwain, Ras al-Khaimah and Fujairah) were under British protection from the late 19th century. There was a UK Political Resident in Bahrain who looked after these countries and states defence and tried to prevent squabbles between them. Kuwait was a British Protectorate from 1899 – 1961. After the British withdrew from Kuwait in June 1961 Iraq laid claim to its tiny neighbour. As a result British Forces returned by invitation of the Ruler of Kuwait. The threat to UK vital oil supplies was considered highly possible and so six Ton Class Minesweepers were sent from the Malta Squadron (108th MSS) in July 1961. There was little maintenance support for the ships in Bahrain and the ships had no air conditioning. They were only in the Gulf for less than two weeks sailing from Bahrain on 16 August to Aden. 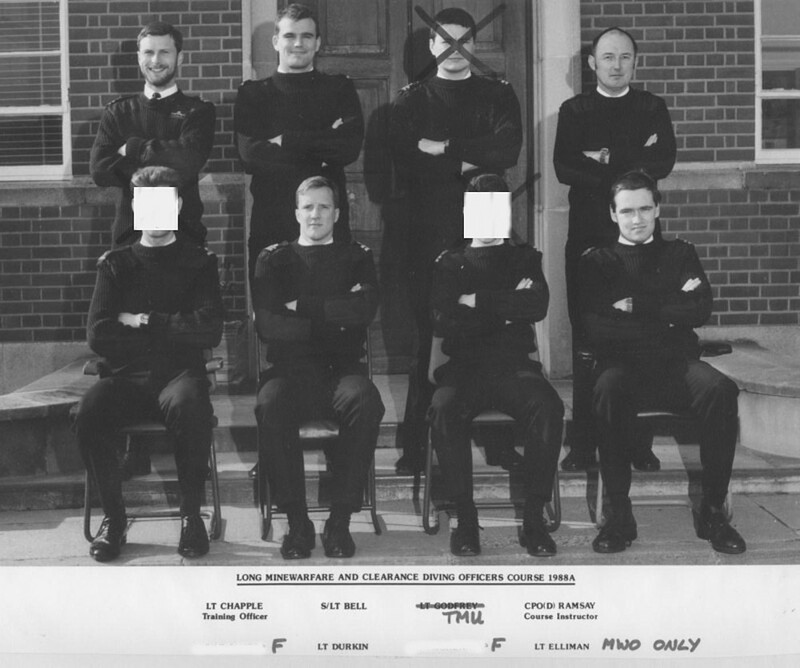 As a result of the failure to set up a MSS in the Gulf in 1961, it was decided to commission a properly equipped and supported squadron – the 9th MSS was born. Early in 1962, four Tons with Mirlees engines were taken out of reserve and refitted – HM Ships APPLETON, KEMERTON, FLOCKTON and CHILCOMPTON. The ships of the future 9th MSS commissioned in June 1962 at Portsmouth and after sea trials and shakedown sailed for Malta for work-up on 20th July 1962. 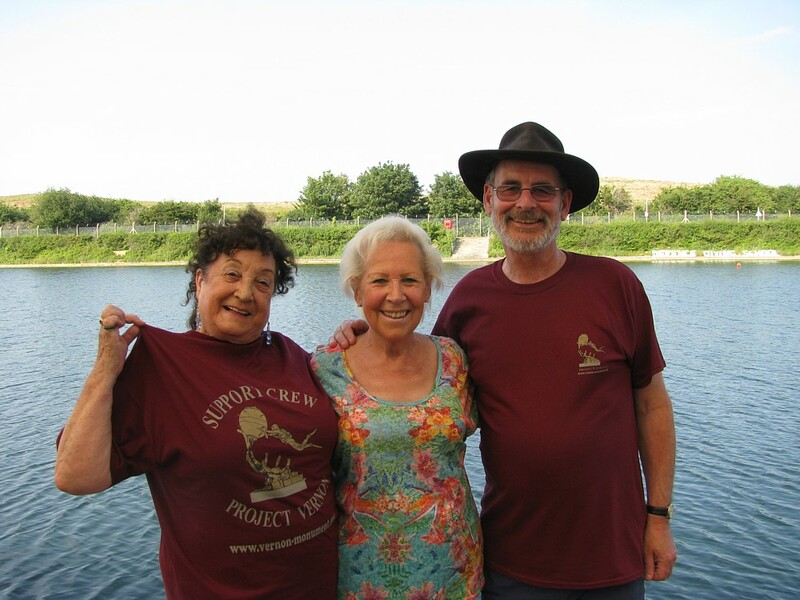 The ships arrived at Malta on 31st July after a very rough crossing of the Bay of Biscay. The ships sailed from Malta on 29th August 1962 having completed work-up and arrived in Aden on 7th September 1962. The 9th MSS was formally brought into being on 1st October 1962 and the ships were soon off for two weeks to Karachi for a CENTO exercise. 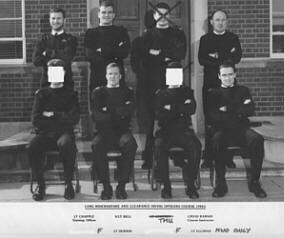 The squadron departed Aden on 1st January 1963, arriving at Bahrain on 7th January 1963 and berthed at Sitra. However this was only a brief visit as there were no facilities for their support; the squadron returned to Aden late in January 1963. A Small Landing Craft (LCT) was taken out of reserve and converted to a Maintenance Repair Craft (MRC) and entered service in April 1963. The 9th MSS sailed from Aden late in April 1963 and berthed on the MRC. A small dhow acted as duty boat and liberty boat. Later in the 1960s a second MRC enhanced berthing for the squadron and a walk ashore improved access. 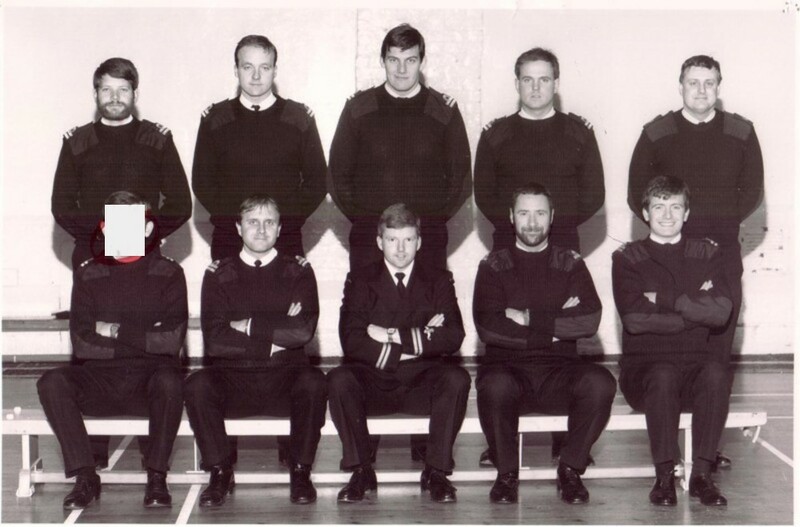 The Squadron was administered by SNOPG (Senior Naval Officer Persian Gulf) later to become CNFG (Commander Naval Forces Gulf) based in HMS JUFAIR. To assist in local identification the ships of the squadron had their pennant numbers painted in Arabic on the stern (starboard side). APPLETON, FLOCKTON and CHILCOMPTON recommissioned on 7th September 1963; KEMERTON did likewise four weeks later. This became the pattern for future years. 1964 - APPLETON, FLOCKTON, CHILCOMPTON and KEMERTON. 1965 - APPLETON, CHILCOMPTON and FLOCKTON were decommissioned during 1965 and placed in Care and Maintenance in Gibraltar. They were replaced by HM Ships CHAWTON, BURNASTON and BEACHAMPTON respectively. HM Ships CALTON and CARHAMPTON were commissioned from the Aden Reserve for the Aden Patrol in January and assigned to the 9th MSS but remained in Aden. CARHAMPTON had a very short operational life – returned to reserve in April! 1966 - BEACHAMPTON, BURNASTON, CALTON (decommissioned in the UK in May), CHAWTON, KEMERTON (returned to the UK and decommissioned in September), PUNCHESTON, WISTON and YARNTON. 1967 - BEACHAMPTON, BURNASTON and CHAWTON (both refitted at Gibraltar from May and sailing in company for Bahrain in December), PUNCHESTON, WISTON and YARNTON. APPLETON recommissioned at Gibraltar in February and thence to the Aden Patrol. 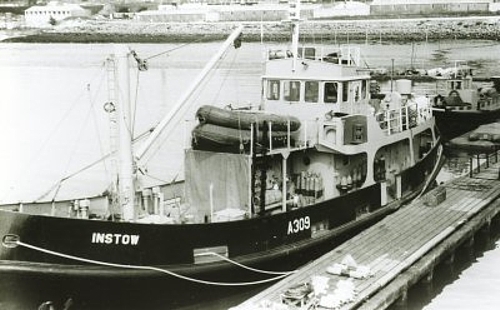 1968 - APPLETON, BEACHAMPTON, BRERETON and BRINTON (both commissioned at Portsmouth in December), BURNASTON, CHAWTON, GAVINTON (commissioned at Portsmouth in December), PUNCHESTON, WISTON and YARNTON. 1969 - APPLETON, BURNASTON AND CHAWTON (all three sailed from Bahrain in January), BEACHAMPTON, BRERETON, BRINTON, GAVINTON, PUNCHESTON, WISTON and YARNTON. 1970 - BEACHAMPTON, BRERETON, BRINTON, GAVINTON, PUNCHESTON, WISTON and YARNTON. Bahrain became independent in August, Qatar in September and the Trucial States in December 1971. Bahrain and Qatar remained as independent countries but the Trucial States formed the United Arab Emirates. The reason for the squadron’s existence had come to an end and it disbanded on 9 August 1971. 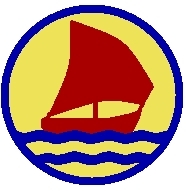 BEACHAMPTON and YARNTON sailed from Bahrain on 13 August 1971 for Hong Kong; PUNCHESTON (for the UK) and WISTON (for Gibraltar) sailed from Bahrain on 5 September 1971 and finally BRERETON, BRINTON and GAVINTON sailed from Bahrain on 2 October 1971 for Gibraltar. 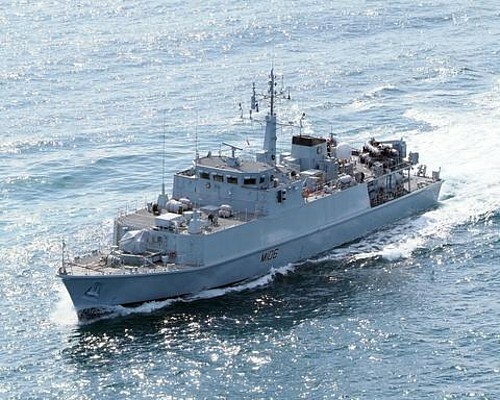 The Dartmouth Chronicle website contains this article announcing that HMS Chiddingfold (MCM2 Crew 5) has been assigned to replace HMS Blyth (MCM1 Crew 2 commanded by MCDOA member Ash Spencer) as guardship for the Dartmouth Regatta from Thursday 29 August to Sunday 1 September. 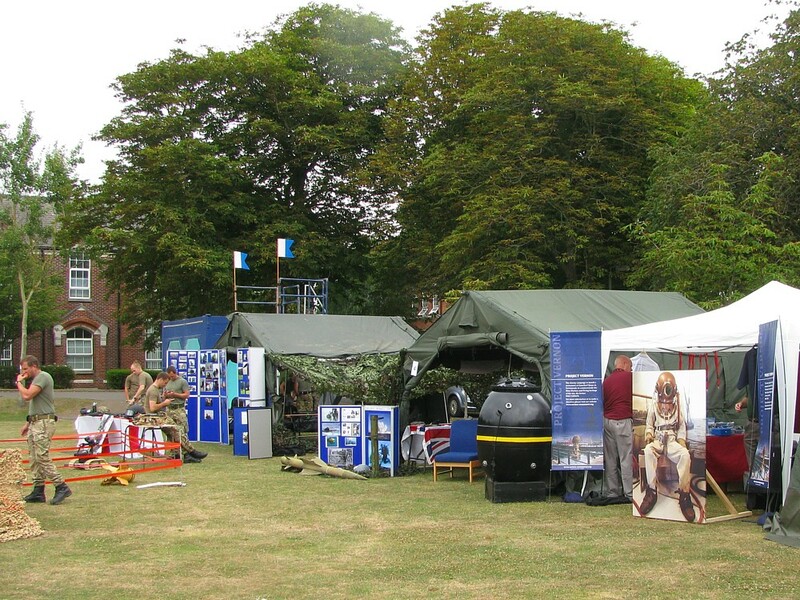 HMS Blyth had been reprogrammed to attend the Bournemouth Air Festival which takes place over the same weekend. 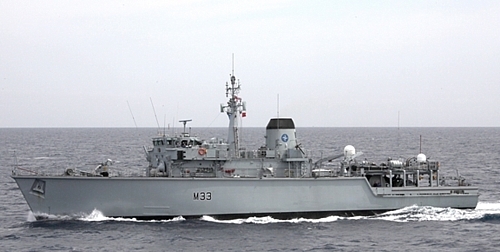 MCMVs are being tasked to cover such major events more frequently owing to the Royal Navy's chronic shortage of frigates and destroyers. After a day of digging and raking we have cracked the clearing of the intended site for the LR3 submersible. Thanks to Dave Sawdon of Southsea BSAC for a magnificent display of formation digging under the close guidance and supervision of Jim Thomson, Clive Egginton, Terry Nash, Mike Fardell and Ann Bevan - THANKS to all! 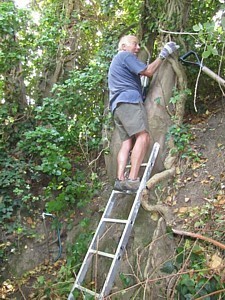 Extra pics: Round peg: Jim Thomson prepares to successfully place the round peg in the round hole! 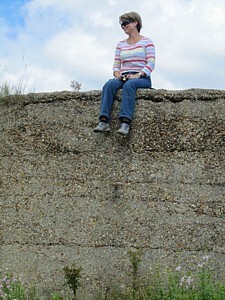 Omnipotent One: Ann Bevan supervises from on-high. 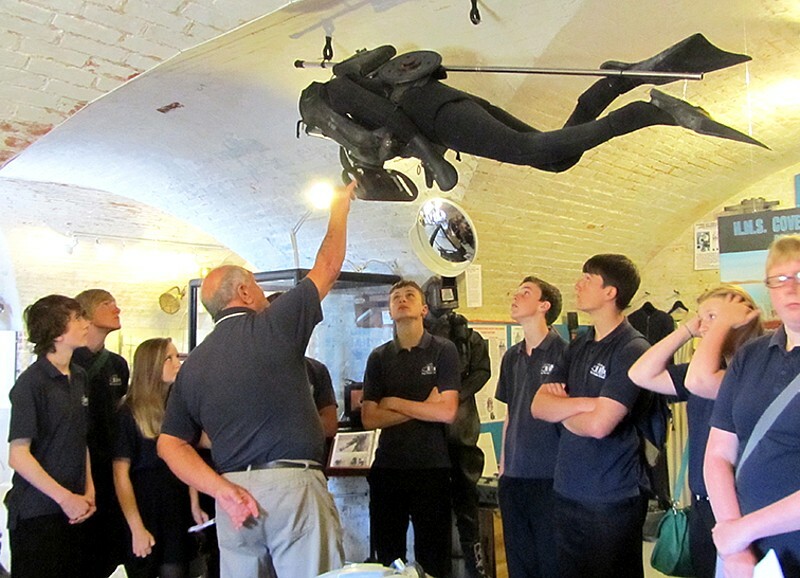 The Royal Navy Submarine and Underwater Medicine Course will be attending the Diving Museum on Thursday, 10 October, between 1330 and 1530 hrs. 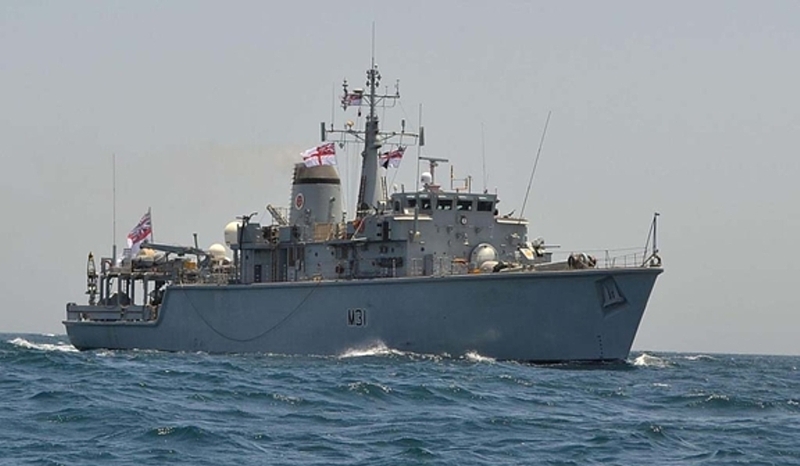 The Royal Navy website contains this article and the Navy News website this article describing training conducted by the Type 45 destroyer HMS Dragon with the four RN mine countermeasures vessels deployed in the Gulf on Operation KIPION (MCM). 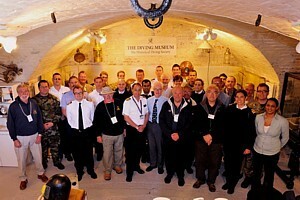 Thu 29: Minewarfare Association Southern Area Monthly Dit Session on board HMS Victory. Members wishing to attend should email Paul 'Taff' Reader at this address by mid-day Wednesday. Thu 5: MCDOA Beer and Curry Night in Central London. 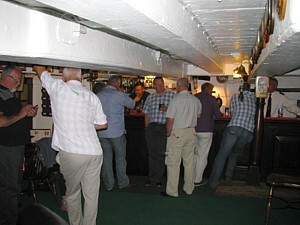 Muster in pub between 1800 and 1830 followed by a meal in an Indian restaurant from 2000. Attendees to date comprise Andy Ward, Kim Godfrey, Martin Mackey, Keith Broughton, Al Nekrews, Chris Ashcroft, Rich Battrick, Dave Hunkin, Dave O’Connell and Peter Greenwood. A few others are still to confirm but there is always space at the table. If any other members are interested, email Andy Ward via this address. Sun 29: Project Vernon VIP visit to Studio 434's private classic car and motorcycle collection. Exclusive event in aid of Project Vernon, the campaign to erect a monument at Gunwharf Quays in Portsmouth to commemorate the minewarfare & diving heritage of HMS Vernon which previously stood on the site. 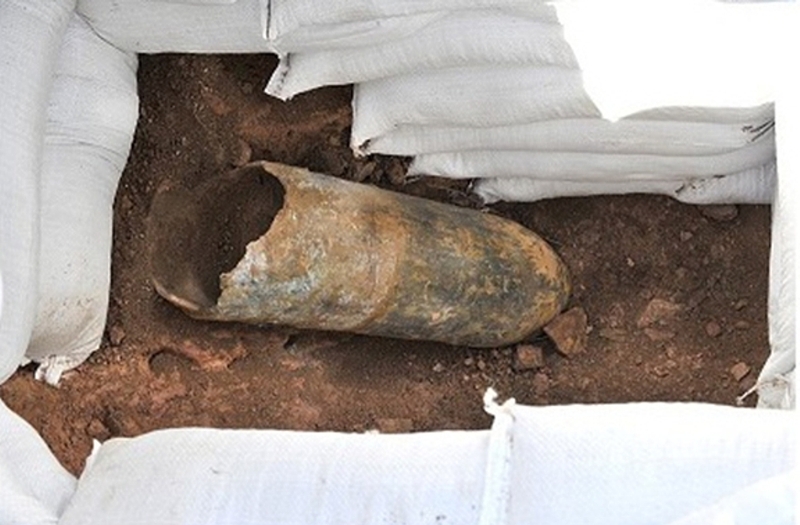 Event at private Potters Bar venue will include guided tour and cordon-bleu luncheon. See www.studio434.co.uk for details of this amazing location (normally the preserve of TV and movie makers). Cost £75 per person with all profits going to Project Vernon. Reserve your tickets here. 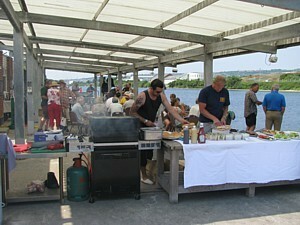 Fri 22: MCDOA Operational updates, lunch and AGM at Fleet Diving Headquarters, Horsea Island. 1000 to 1500. Details to follow. 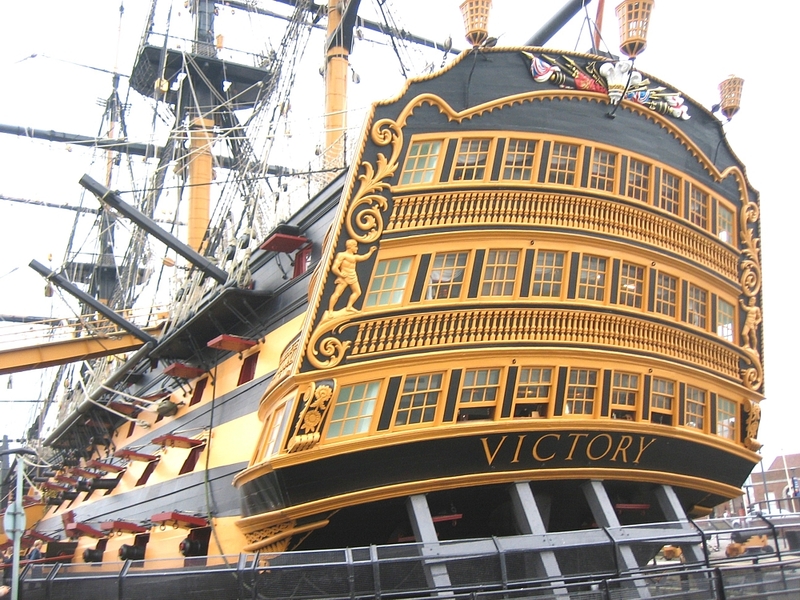 Fri 22: MCDOA Annual Dinner in the Wardroom, HMS Excellent. 1930 for 2000. The Guest of Honour will be Rear Admiral Peter Hudson CBE, Commander NATO Maritime Command and a former CO of HMS Cottesmore. We have some illustrious leavers to dine out this year and the members of LMCDO '88A and '88B are planning a strong turnout to celebrate their 25th anniversary. Note that WO(MW)s and WO(D)s are eligible to attend this function too. 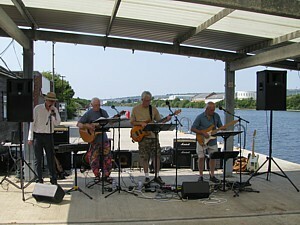 Proceeds in aid of Project Vernon. Details to follow. 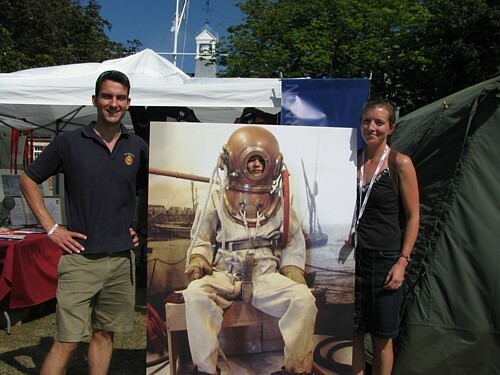 Sat 23 - Sun 24: Historical Diving Society AGM and Conference at RNLI College, Poole. See HDS website for further details. More information on the Forthcoming Events page. The Royal Navy website contains this article covering yesterday's disposal of a wayward Second World War UK parachute mine unearthed on Guernsey in the Channel Islands (see entry for 18 Aug 13). 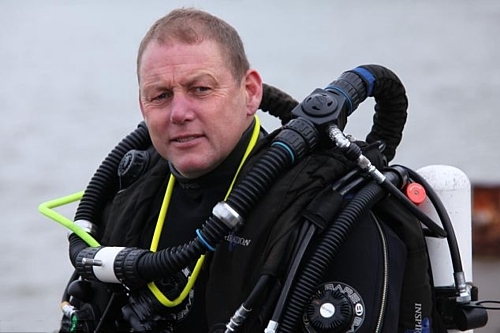 The well-illustrated article features PO(D) Nick Frost of Plymouth-based Southern Diving Unit 1 (SDU1). 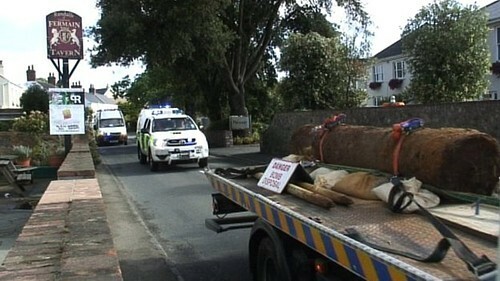 Postscript: On 20 August, the Guernsey Press website published this article about the SDU1 team involved in the incident. Numbers are picking up nicely now the weather is pushing them off the beach! Saturday (windy and rainy): 50 and Sunday (Windy and sunny): 27. Jim Heyworth (ex-LMCDO) visited from Preston. He has a special interest in Syd Knowles history (another Preston man). Jim is a little unusual in having swapped his RN diving career to become a barrister! Peter Leatherhead brought in a picture of his Gt Grandfather, Walter Trapnell who tragically died in 1907 after being entangled at 150 ft for 3 hours. Mike Coralie from Ottawa, Canada, who was amazingly enthusiastic and nearly cleared the shop! 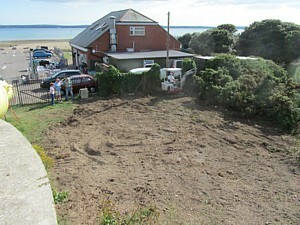 Monday, 19th, we are preparing the ground for LR3 from the RN Submarine Museum. Kick-off at 0900 hrs. The BBC News website published this article announcing that a Second World War parachute mine discovered in Guernsey on Wednesday (see entry for 16 Aug 13) would be taken to sea for disposal by RN EOD experts today. Flights were likely to be disrupted because the exclusion zone overlaps the airport's flight path. 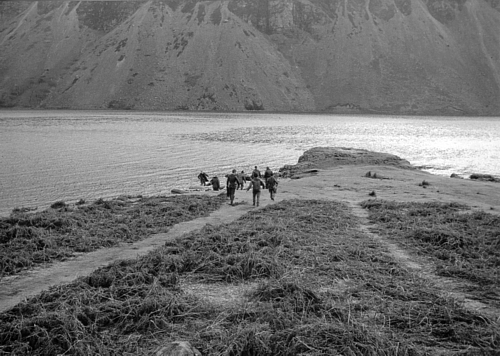 The BBC News website then published this article describing the evacuation required for the removal of the mine to a safe area. 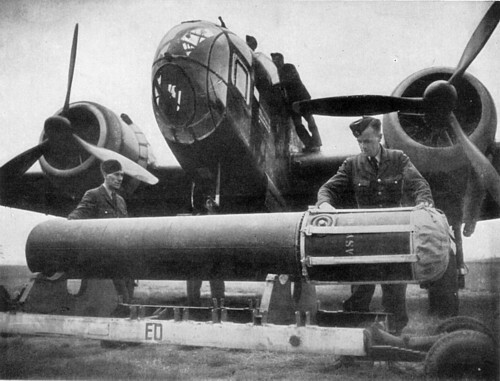 From the accompanying image, it appeared to be a UK air-laid ground mine. 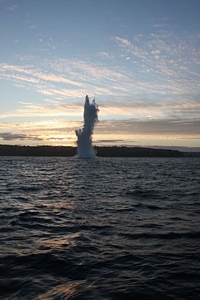 Finally, the BBC News website published this article announcing this evening's successful detonation of the mine at sea, presumably by members of Plymouth-based Southern Diving Unit 1 (SDU1). laid off St Peter Port, Guernsey. 24 A Mk I-IV mines were laid off Alderney harbour. circuits, single sterilizer and arming clock or PDM. 1944 by the A Mk VI. We disposed of several of these mines off Guernsey during my time with the Plymouth Clearance Diving Team in the late 1970s and early 1980s, often combining the operation with a 180 ft (54 m) diving work-up. 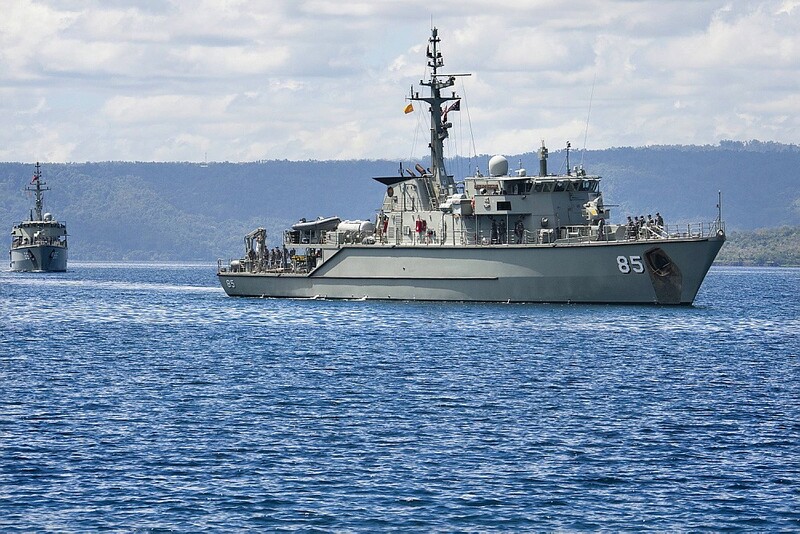 The Brisbane Times website contains this article describing the detection by the Huon class coastal minehunter HMAS Gascoyne of four bombs jettisoned by US Marine Corps Harrier AV-8Bs in the Great Barrier Reef Marine Park last month (see entry for 29 Jul 13 in News Archive 43). The aircraft had been unable to drop their bombs in the approved area owing to the intrusion of civilian vessels. 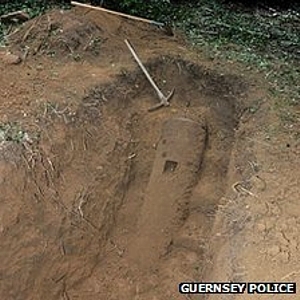 The Guernsey Press website contains this article describing the discovery by local police of a wartime parachute mine buried in woods on Guernsey in the Channel Islands. 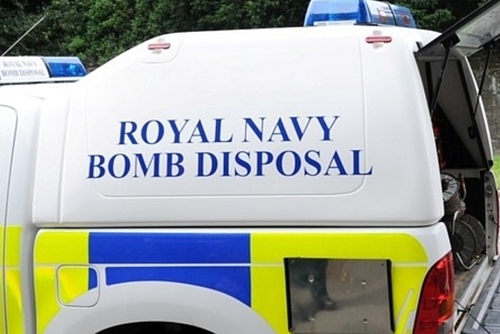 A naval EOD team, presumably from Plymouth-based Southern Diving Unit 1 (SDU1), has been called in to remove the mine and detonate it at sea. Postscript: The Guernsey Press website has published this follow-up report. 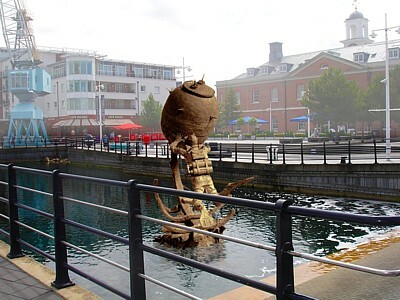 Project Vernon is the campaign to erect a monument at Gunwharf Quays in Portsmouth to commemorate the minewarfare and diving heritage of HMS Vernon which previously stood on the site. The much-awaited miniatures of the monument can now be ordered here via the Project Vernon website. They are available in a variety of sizes and finishes. The exquisitely detailed master maquette, created by world-renowned Australian sculptor Les Johnson FRBS, has now been completed, approved by the trustees and 3-D scanned ready for scaling up to produce the final, almost twice life-size, 14 ton structure. 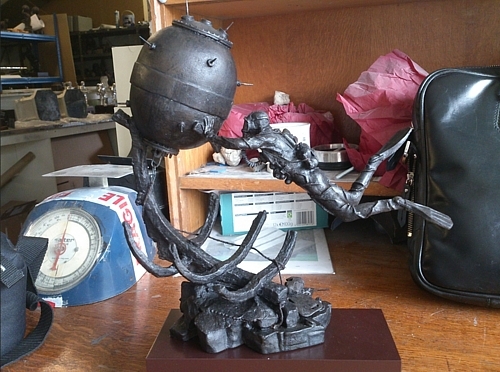 It has also been used to produce reference models for the miniatures. It gives me great pleasure to inform you that the Vernon Monument miniatures are now on sale on the Vernon Monument website. These highly collectible pieces are available in two finishes and two sizes, to best suit your preference and budget. 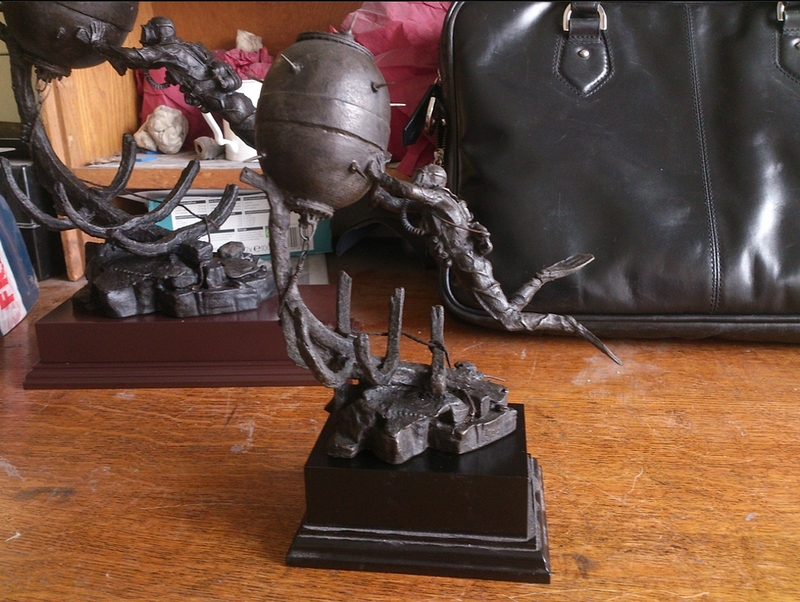 Each miniature is manufactured individually, in either bronze resin (on a mahogany coloured plinth) or with an Electro Hallmarked Silver finish (on a black plinth). Thanks to the latest laser-based 3-D modelling and casting technology, each mini-statue is either 190mm (approx. 7.5 ins) or 290mm (approx. 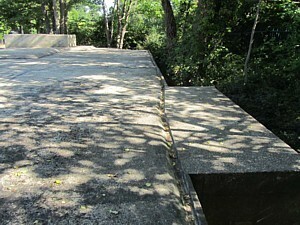 11.4 ins) tall, excluding the 45mm (1.8 ins) plinth. Just click HERE to order yours. These miniatures would make an exceptional Christmas or birthday present so place your orders early to beat the rush. As each miniature is made to order (there is no 'stock' - each is bespoke) there is a 3 to 5 week period for delivery depending upon the number of orders received. Please spread the word to your local RNA or, if you belong to the RNR, let your colleagues know of the availability of Vernon Monument miniatures. The same goes for anyone in your address book who might have some previous role in HMS VERNON or perhaps you have one or two scuba divers who might wish to purchase one. I went to the company premises on Monday to see the first two 'reference models' and they are exceptional. I have attached photographs and make no apologies for the crowded background as it provides a useful visual aid to the size of each. 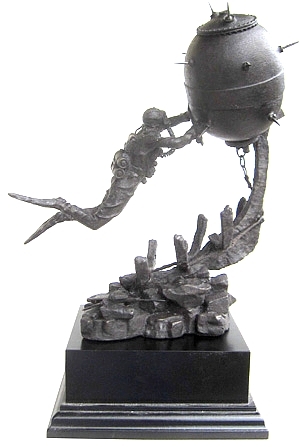 The more we sell, the sooner we install the monument in Gunwharf Quays. I have already ordered mine (scuse the pun). 22 George Crosses (including three posthumous awards) for rendering mines safe and bomb & mine disposal, particularly during the Blitz. 22 Distinguished Service Crosses for bomb & mine disposal, beach clearance or diving including Chariot human torpedo and X-Craft miniature submarine operations. 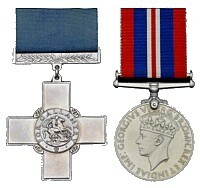 2 Bars to the Distinguished Service Cross for bomb & mine disposal or beach clearance. 121 George Medals (including one posthumous award) for rendering mines safe, bomb & mine disposal or port clearance. 15 Bars to the George Medal for rendering mines safe and bomb & mine disposal. 69 British Empire Medals (including one posthumous award) for bomb & mine disposal, port clearance, diving or mine design. 1 Distinguished Service Order for EOD. 10 Distinguished Service Crosses for EOD, diving and mine countermeasures. 3 George Medals for EOD and port clearance. 4 Distinguished Service Medals for EOD and diving. Watch this space but, in the meantime, place your orders for miniatures as soon as possible. Another good weekend to report with 49 visitors on Saturday and 28 on Sunday. Vic started diving with the RN in 1944, when John Dadd was a one-year-old! He bought himself out of the RN in 1947 for £26 and promptly joined Risdon Beazley. The rest is history, soon to be chronicled by Margaret Marks who is about to pounce with her electric voice recorder for an oral history session. Vic generously donated an unused 'Jack Brown' Desco mask, a 1956 edition of the US Navy Diving Manual and some classic B/W photos from his scrap book. Many thanks to Tony who called in with a car-full of ex-RN breathing kit including a Windak rebreather, French Fenzy O2 rebreather, MRO 4-bottle set, two CDBA bottle sets, a Salvus O2 set (to go with a Clammy Death suit! ), an experimental heliox set and an ABLJ. N.B. 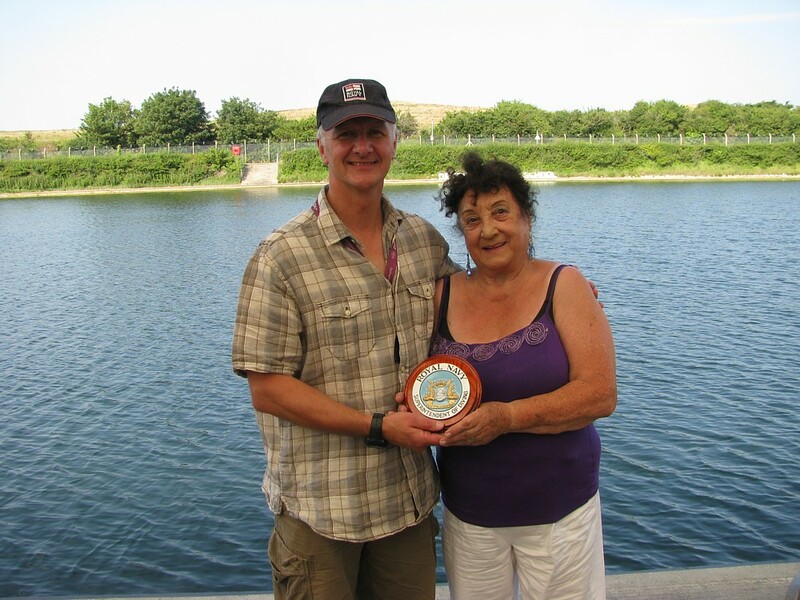 At the 58th AGM of the BSAC held at Ellesmere Port in May 2012, former BSAC Vice Chairman Tony Marshall was presented with Honorary Life Membership for his services. I am sure everyone will join me in wishing Justin and his ship's company an enjoyable leave and every success in whatever the future holds for them. 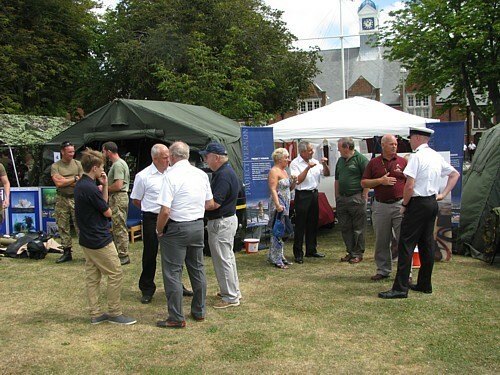 Postscript: The Portsmouth News website has published this article (including video), the Royal Navy website this article and the Navy News website this article covering the event. The latter two articles feature AB(MW) Matthew Fay and AB(D) Ali Shaw. The Portsmouth News contains this article announcing tomorrow's return to Portsmouth of HMS Ledbury (MCM2 Crew 6) after her three-month deployment in the Mediterranean with Standing NATO Mine Countermeasures Group 2 (SNMCMG2). The article features MCDOA member Justin Hains, her Commanding Officer. According to QHM's Movements, HMS Ledbury is due to arrive at Outer Spit Buoy at 0930. 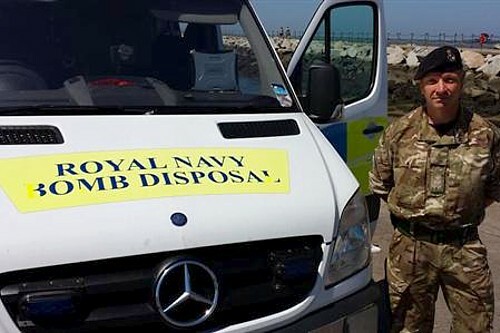 The Royal Navy website contains this article describing yesterday's disposal of a Second World War German unexploded bomb by members of Plymouth-based Southern Diving Unit 1 (SDU1) at St Eval Kart Circuit near Wadebridge in north Cornwall. The article features PO(D) Sid Lawrence. Good figures are back again with 44 on Saturday and 45 on Sunday. The theory we are developing is that if the weather is too good, they are reluctant to leave the beach but if there is any wind or cooler temperatures, they have to get up, walk around and call in the Museum. Ex-US Navy combat diver Craig Rahanian has kindly donated three old USN documents. He is currently working in the UK with the American Battle Monuments Commission and much enjoyed his visit to our reference library. Thanks also go to Barry Ryan (via Martin Marks) for the donation of a splendid example of an Admiralty Pattern diver's torch and to Janet Morrison, widow of the late PO Edward Morrison, RN Clearance Diver, who has placed a collection of items in the library on indefinite loan. 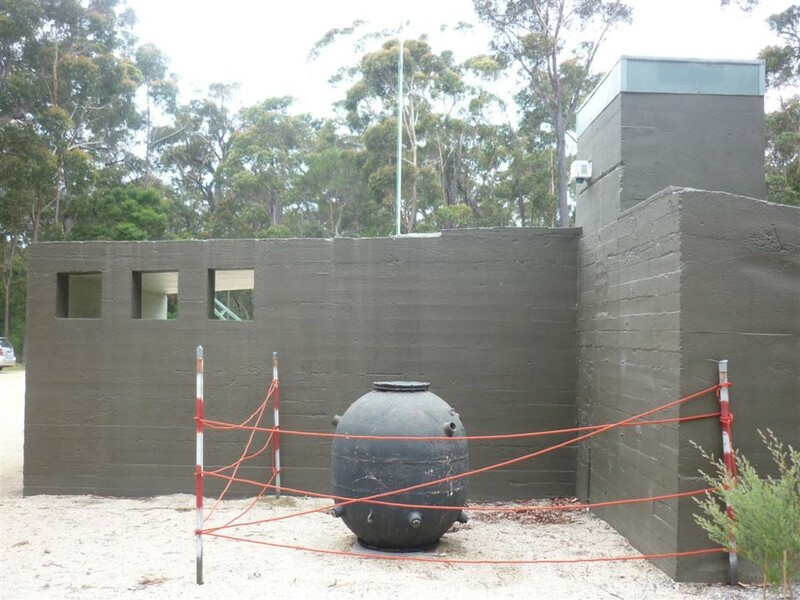 I'm delighted to report that following the recent brief though heavy rainfalls, the library roof has proven to be completely rain-proof and the bunker is now a dry structure. Thanks to all who worked to spread the glue/bitumastic paint on the roof and to Chris Murphy who generously provided the paint on approval. 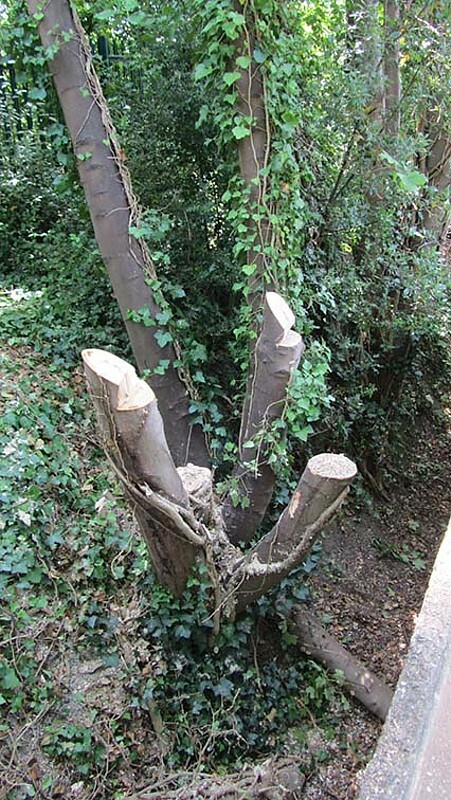 Nigel-chain-sawman-Phillips has successfully finished Phase I of the pollarding and removal of a dead tree. Several museum guides now have their winter's supply of logs topped up. The MCDOA website has increased its following for the third month running. During July 2013, it was accessed by 37,831 distinct host servers, the first time this statistic has exceeded 37,000. The number of people accessing the site is likely to be even higher as many servers (e.g. MoD, US military, etc.) are shared by several users. Keep sending your news items and photos during the silly season (summer leave period) to keep the site entertaining, informative, relevant and (perhaps most importantly) current for the enjoyment of the minewarfare & diving community at large. 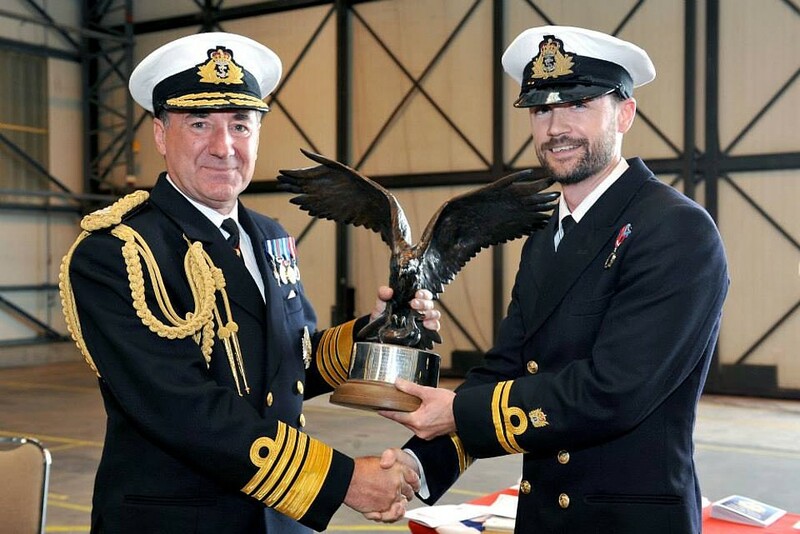 Congratulations to MCDOA member Tim Curd's son Mike on being presented with the Osprey Trophy by Admiral Sir George Zambellas, First Sea Lord and Chief of Naval Staff, as described in this article on the Royal Navy website. This trophy is awarded annually to the front-line Lynx helicopter flight that has contributed most to the ethos, reputation and standing of the Lynx Wildcat Maritime Force over the previous year and Mike is the Commander of 217 Flight of 815 Naval Air Squadron (see first entry for 10 Jan 13 in News Archive 41). I am sure Tim is a very proud father as he has every right to be. "Proud as a proud thing! His proud-to-bits Mum and I were both at the presentation, as was his proud sister, her husband and his new MCD-in-waiting (proud-if-he-knew-what-was-going-on) nephew Sebastian. It was a great day for the Curd household. BZ my son! Mike dives - paddles - a bit too, which proves he has my genes but unfortunately he never quite inherited the looks to be an MCD. Done alright though!" 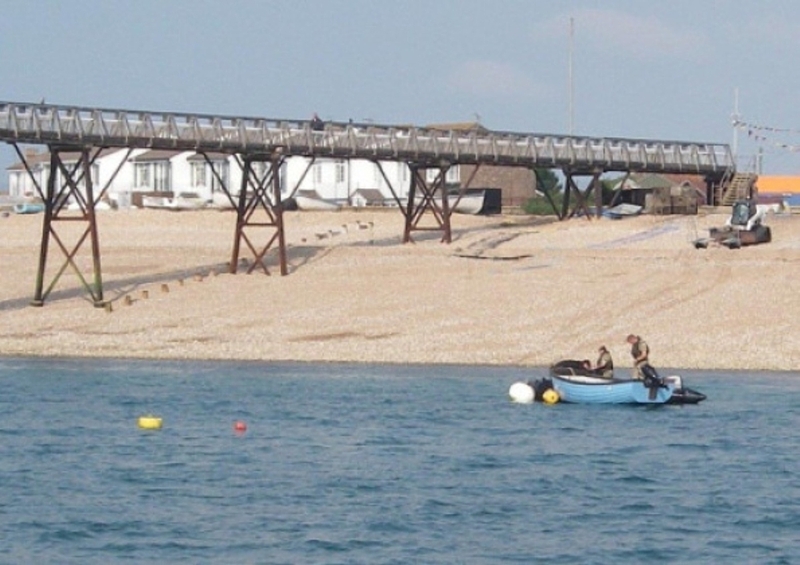 The BBC News website contains this article and the Dorset Echo website this article describing the disposal of a wartime German mine off Weymouth on Saturday, presumably by members of Plymouth-based Southern Diving Unit 1 (SDU1). The Australian news.com.au website contains this article announcing that US Navy divers and a minehunter with a magnetometer will be tasked to locate and recover two BDU-45 practice bombs and two unarmed GBU-12 Paveway II bombs jettisoned by two US Marine Corps AV-8B Harriers in the Great Barrier Reef Marine Park on 16 July although this article on the Navy Matters website indicates an Australian minehunter may be used. 28 Jul 13 - EOD incident at Westward Ho! 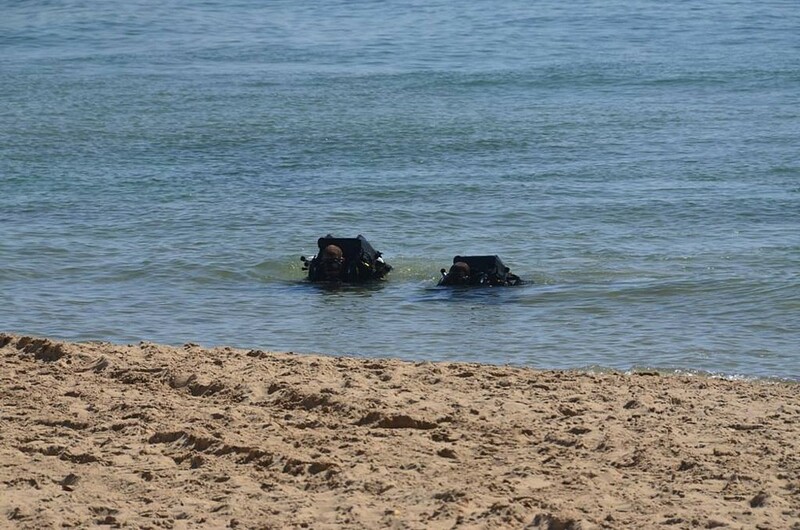 The North Devon Gazette website contains this article and the North Devon Journal website this article describing an EOD incident attended by members of Plymouth-based Southern Diving Unit 1 (SDU1) yesterday at Westward Ho!. Emergency vehicles at Westward Ho! I enjoy your web site. 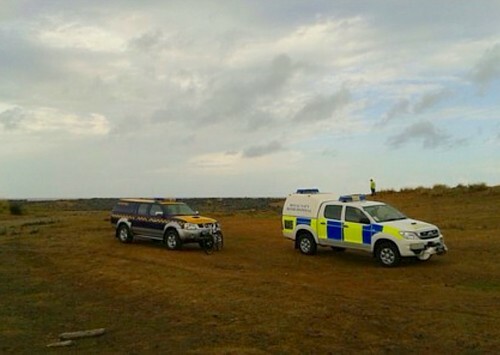 Re 28 Jul 13: EOD incident at Westward Ho! I see that HMCG was involved. I hope that they behaved? With regard to your recent post about Commander Craig (see third entry for 2 Jul 13), I have been sacked as the DCCG [Deputy Chief Coast Guard] and am now Head of Aviation with six times the budget I had before! My daily sign off is £1.5M. Worrying for a diver. 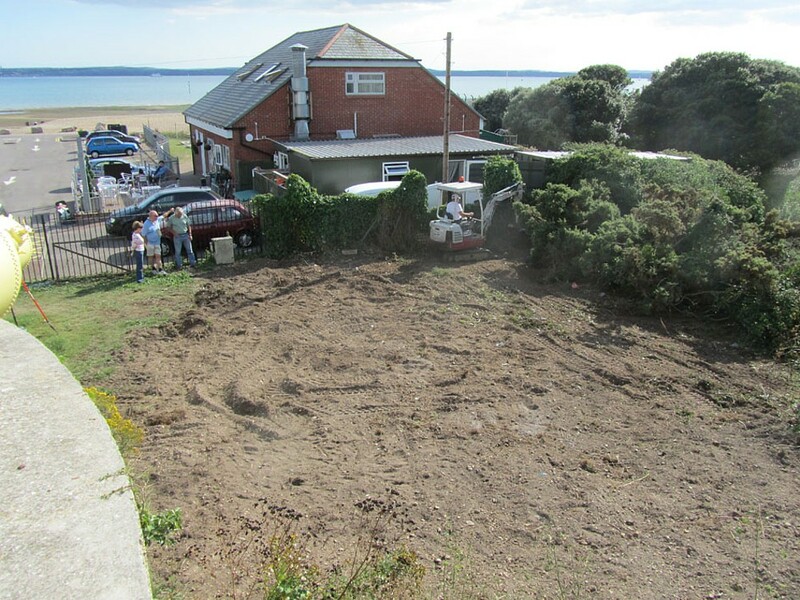 "I've made a breakthrough with the task of levelling the ground at the Museum in readiness for the receipt of the LR3 Submersible! I've met David Sawdon, a local sport diver at Southsea BSAC who operates diggers (amongst other things). We've pencilled in Saturday, 17 August for the ground-breaking experience. The plan is to level the ground at the far (cafe) end of the external exhibits, lay a membrane and pebbles under the LR3 spot and lay turf/grass seeds over the rest. Many hands make light work (again)! N.B. 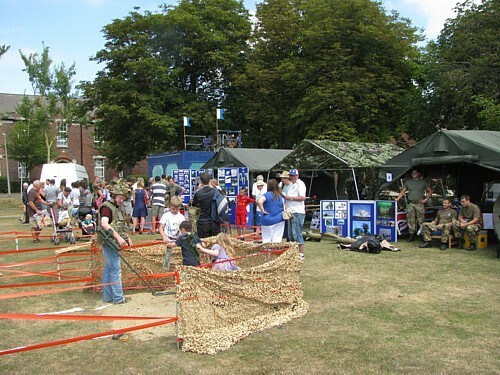 I will be on guide duty at the HDS museum tomorrow (Sunday) with former FCPO(D) John Dadd and ex-CD Jim 'Tommo' Thomson. We will be open from 1100 to 1600 so why not come along and see us? 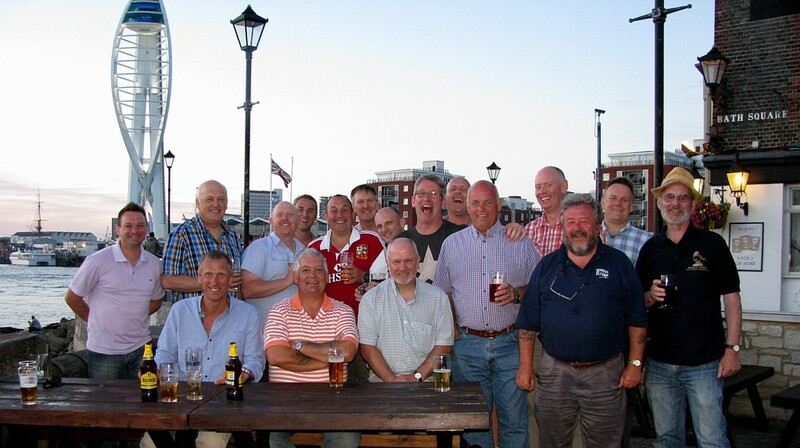 The Minewarfare Association (MWA) had a cracking dit session last night at the Still & West in Old Portsmouth when we marked Ginge Wilcockson's retirement from the RN. Dual-MCDOA members present included John Bainbridge, Steve Brown, Bill Kerr and Yours Truly (Rob Hoole). Forget your miniature glass diver and glass mine 'leaving gizzits'. Earlier in the day, Ginge had been presented with the real McCoy at the Senior Rates' mess in HMS Excellent immediately after the establishment's Families Day. 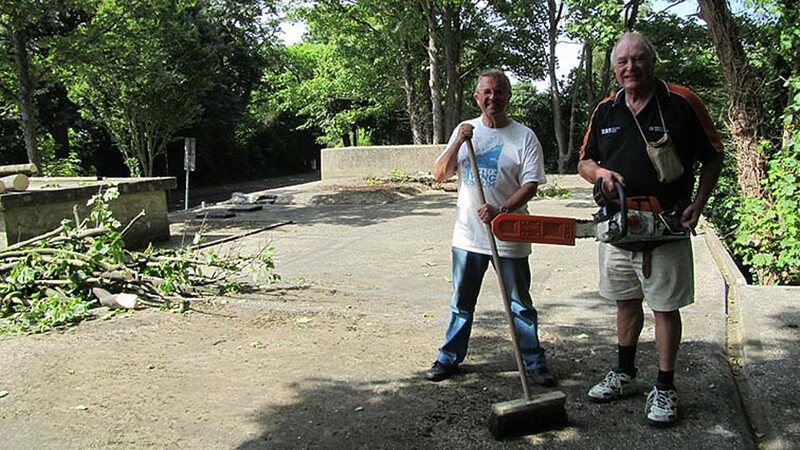 Other PV volunteers comprised MCDOA members Ian Morton and Brian Dutton (accompanied by his wife Audrey) and AORNFCD members Tony Devitt (accompanied by his wife Dawn) and Mike Handford (accompanied by his grandson Jack). Joshua behind 'Fred'. Joseph's father was an Admiralty salvage diver. MCDOA member Doug Barlow also made an appearance, as did fearsome Gunnery Officer Brian Witts with his wife Val. Brian is not only the former scourge of the parade ground and current marina manager, museum curator and custodian of the gun carriage at Whale Island but was also a Leading Seaman with Doug Barlow as a Petty Officer in the cruiser HMS Newfoundland during the Suez crisis in 1956. MCDOA member Roy Armstrong also put in an appearance with his partner Katherine Rackham and her two children: Harry and Angus. We also saw MWA members WO(MW) Andy Strickland, the Surface Flotilla Warrant Officer, and ex-PO(MW) Slinger Wood ('old ships' from my time in HMS Wilton) who works for Special Olympics Scotland West. 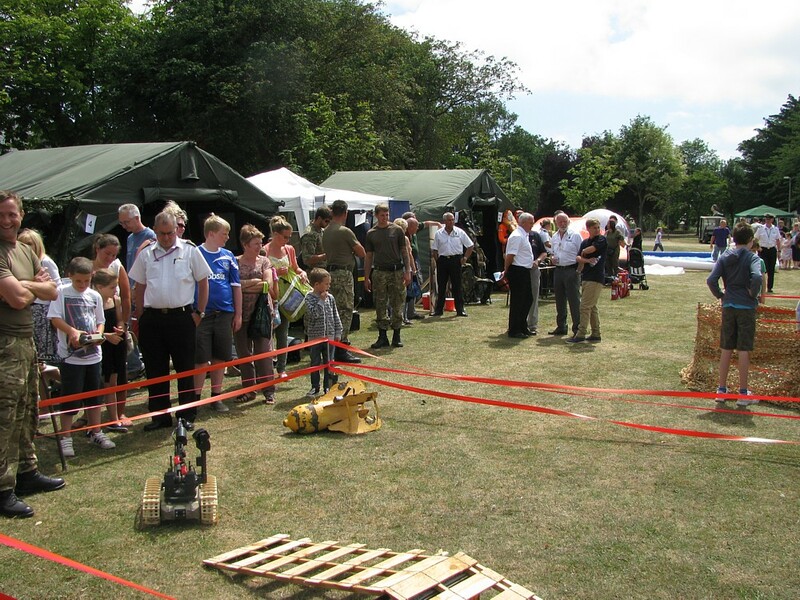 The Squadron brought a bomb wagon and each unit manned a stand with plenty for families to see and do. 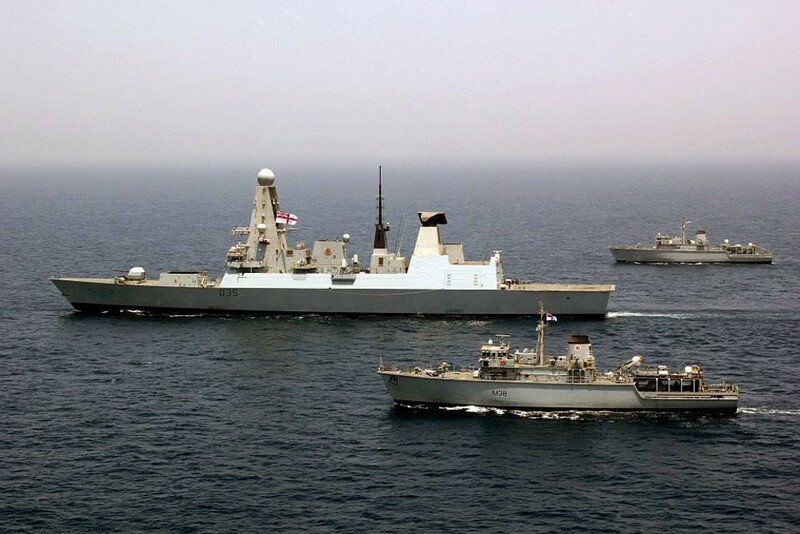 The Portsmouth News website contains this article describing the temporary exchange of personnel last month between HMS Ramsey (MCM1 Crew 6) and the Type 45 destroyer HMS Dragon in the Gulf. The article features AB(MW) Daniel Moseley (See entry for 21 Jun 13 in News Archive 42). I have appended a welcome update from Dave Morris, Chief Instructor for LMCDO '91B, '92A, '92B and '93A, to the entry for 19 Jul 13. 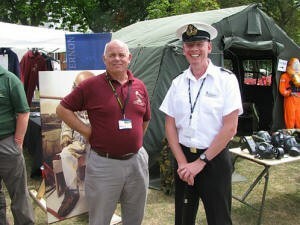 I had a chat with Donald Crosbie of the Fleet Diving Squadron yesterday and he's pointed me to you. I'm researching that perennial item, the Avon drybag. I've got a lot of interesting info from Avon's successor company, but they cannot answer the most important question of all: who designed it!? This is a most significant piece of diving equipment whose story should be recorded properly before it's completely lost. Can you or other members of the MCDOA shed any light on this, please? If you can help, please email Patrick via this address or call him on 01206 823136. Yer ‘tis – a brief history, a rag bag of edited reports, personal accounts and a few salty stories but hopefully it gives a slight idea of what the FECDT got up to during its 20 years of service east of Suez. I am still waiting for some input from Graham Shaw and David Burstall. If and when they send minor amendments, I will forward you an edited copy; if they are more substantial, like Brian Braidwood’s piece from his family history, they can stand alone. I have had no contact with David Lermitte. 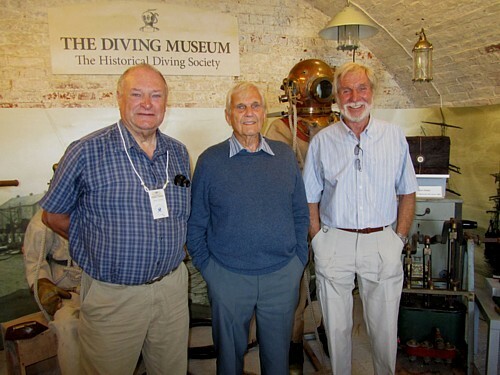 Mike's valuable contribution to the heritage of RN Clearance Diving, 'The Far East Fleet Clearance Diving Team', has now been added to the website's Dit Box. A good weekend with 19 on Saturday and 37 on Sunday. The weather is certainly bringing people down to the beach but, if anything, it's too good and they don't want to leave it! In the sweltering heat, we've managed to lay on one layer of roof paint. 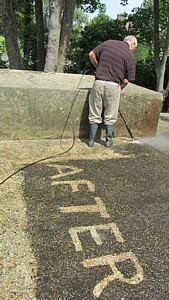 Preparation involved scraping and brushing and finally HP water jetting. Then 8 x 25kg cans of paint were spread, like treacle! There are four cans left which will contribute to a second coat as soon as we can organise it. Slaving away were ex-CD1 Clive Egginton, ex-CD Jim Thomson, Kevin Casey and Nigel Phillips. 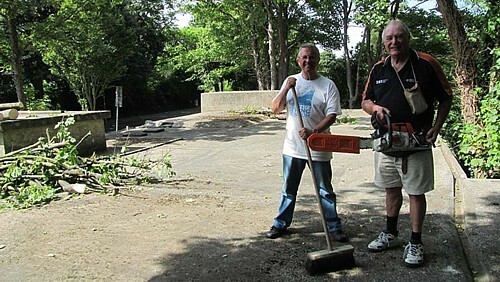 Dougie (IoW) and Nigel have attacked the undergrowth again and countless visits were made to the dump to offload the debris using Nigel's trailer. 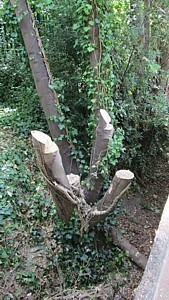 Nigel's chain saw has now cut up the dead tree trunks. There's more to be done in due course, but now there's a light at the end of the undergrowth. 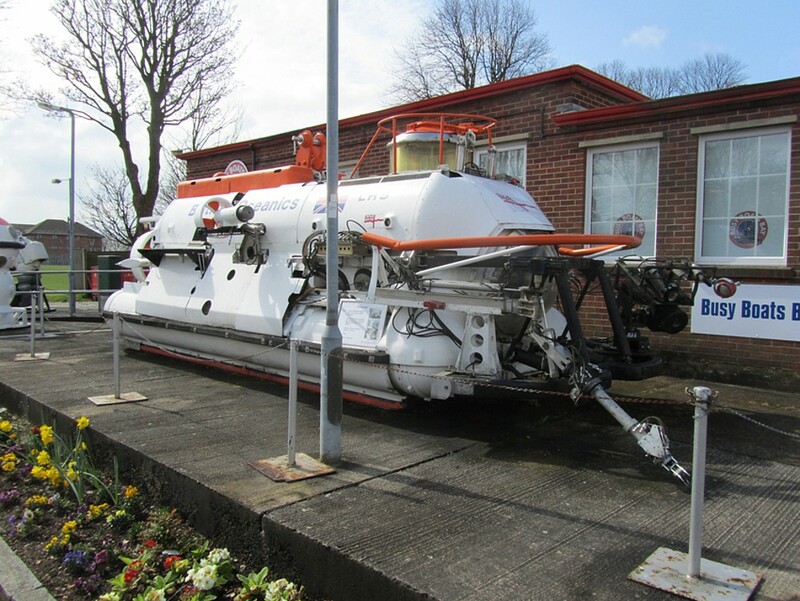 The next project is to level the ground at the Museum to prepare to receive the LR3 sub from the Submarine Museum. Does anyone have a digger? 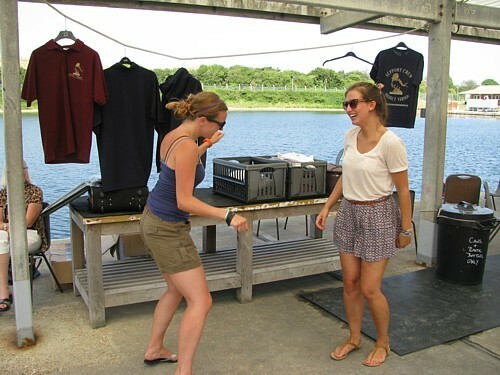 Everything was going fine at yesterday's joint-MCDOA/AORNFCD/MWA/RNCDA barbecue, held in perfect weather at Horsea Island, until two silly old fools decided to start a trend by leaping into the lake. This unruly behaviour sparked off a swimming free-for-all that included former MCDOA Chairman Paul Jones (present with his wife Yvonne) who 'owns' the lake as the CO of HMS Excellent. As ever, MCDOA Honorary Secretary Soapy Watson pulled out all the stops and put huge personal effort into ensuring the success of the event. MCDOA members Martyn Holloway and Dan Nicholson also provided their customary musical entertainment with other members of The Zodions. Other MCDOA members present included our Chairman Chris Baldwin with his daughter Lulu, former MCDOA founding Chairman Dave Sandiford accompanied by his wife Pauline, Surg Cdre Jim Sykes, and Robin Jack who drove down from Worksop especially for the event. Staunch Project Vernon supporter Irene Strange, widow of PO(D) Albert Strange (see third entry for 25 Apr 09 in News Archive 26), turned down a DAB digital radio as her raffle prize in favour of a Superintendent of Diving badge. She then insisted on being photographed for the website with her friend Pat Curtis and Yours Truly. Where else are you likely to find better value for £10, which included the cost of food and first drink? 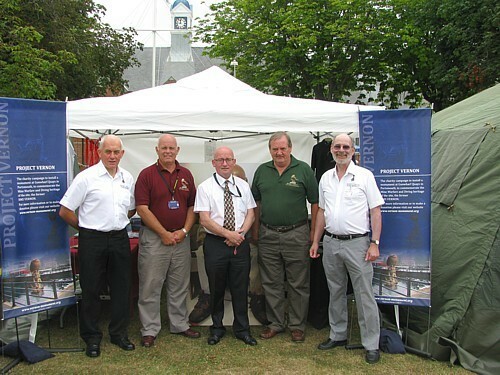 A significant sum was raised for Project Vernon, the campaign to erect a monument at Gunwharf Quays to celebrate the minewarfare and diving heritage of HMS Vernon which previously stood on the site but, above all, the aim of the event was to have fun and this was certainly achieved. 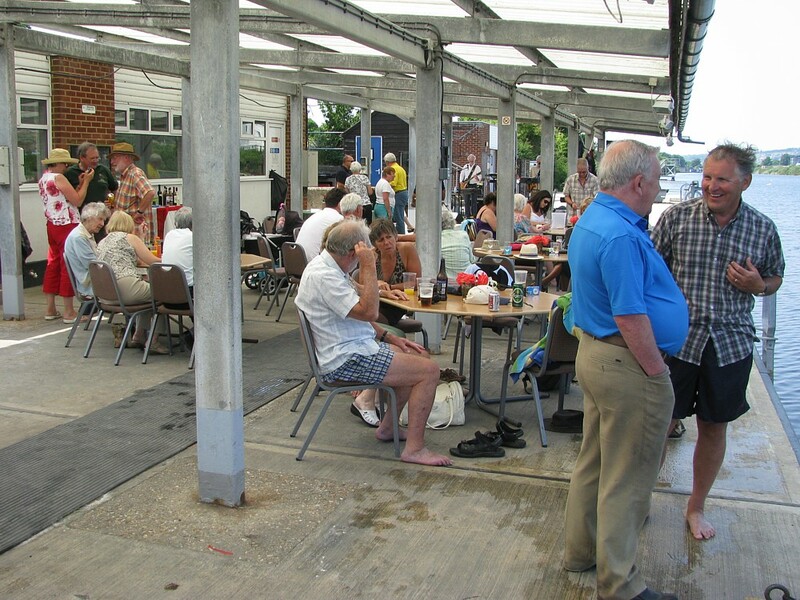 Thanks to Soapy and everyone else concerned with making it such a success, especially Leigh the chef, Paul and Yvonne Jones who manned the bar and Dave Sandiford and Tony Devitt who sold Project Vernon clothing. Let's have some fresh faces around next year. N.B. Project Vernon clothing and other merchandise will be on sale from the volunteer team at HMS Excellent's Families Day this Thursday. 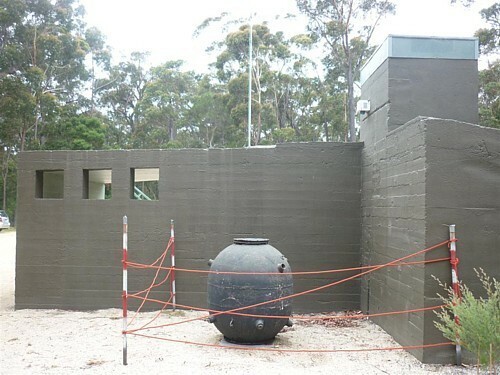 As a result of my B&MD work in Eden NSW and the discovery of a very unexpected buoyant mine on a trailer in December 2011 [now displayed at Mallacoota Bunker Museum - see entry for 11 Dec 11 in News Archive 36], I was requested to give a half-hour talk on mines and their disposal at the Eden Killer Whale Museum on 20 July 2013. I can name two of the team pictured as future CD1s Shiner Brassington and Gabby Haines. Although not required at this stage of minewarfare, I trust that some thought had been given to kitting out the horse with non-magnetic horse shoes. 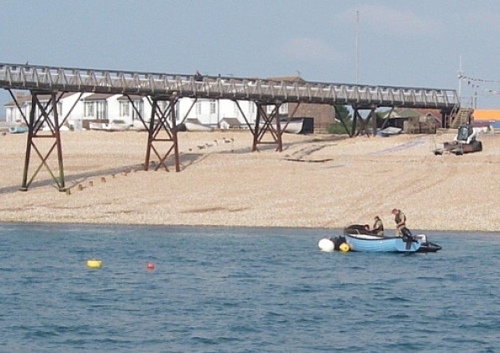 According to The Portsmouth Papers, the torpedo test range at Horsea was in use from around 1889. So I now know why the island was named Horsea after the RN's latest form of transport in getting the torpedoes there from Vernon. And I used to think that, in the mid-1950s, the daily round-trip in the back of a canvas covered and crowded dockyard 3-tonner was pretty basic for diving classes. By Webmaster: As far as I can determine, Mona's moored mine in the top photo is a derivative of a British Mk XIV moored contact mine manufactured in Australia during the Second World War and laid by HMAS Australia and HMAS Bungaroo. It is similar to the Mk XVII but with Hertz horns (removed in example shown) instead of switch horns. No acoustic circuits were ever used. It comprises two 40” diam hemispheres plus an 8” belly band and a 24” diam top cover plate. There were normally two horns on the top cover plate, five on the upper hemisphere and four on the lower hemisphere. It was fitted with three lifting eyes. 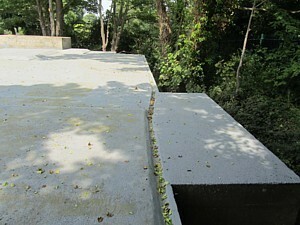 The photo shows it exhibited upside down. 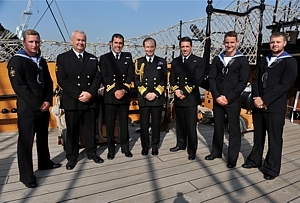 The Royal Navy website contains this article describing last Thursday's ceremony on board HMS Victory at which the Second Sea Lord, Vice Admiral David Steel, formally recognised the achievements of MCM2 Crew 1 (commanded by MCDOA member Ben Vickery) while manning HMS Atherstone for a six-and-a-half month deployment in the Gulf. The personnel returned to the UK on 16 June and are now manning HMS Hurworth. Thanks for republishing our homecoming parade on board HMS VICTORY. It was a great opportunity for the Crew to take a pause after leave as we start a new period in HURWORTH. Unfortunately I was unable to forward it myself as I had to fly to the Gulf on the evening following the event to support QUORN. Hope the BBQ goes well tomorrow. Dave Hunkin and I were the only two to complete LMCDO '93A. Our course officer was Al Trevarthen and course chief Dave Morris. As with all long courses, a great bond was formed between Dave and myself. Although we never crossed paths professionally, we have remained very close friends and meet up whenever the opportunity arises. After a very successful and distinguished naval career, Dave is now establishing himself in civvie street. I have been lucky enough to stay in the diving world and am now enjoying my ninth specialist MCDO appointment as Chief of Staff to the Fleet Diving Squadron soon to be dual-hatted as CO Fleet Diving Group. Last night [Wednesday] was a fantastic evening with Dave hosting me and my wife Marie on his yacht, sailing to Chichester harbour where we came to a buoy and enjoyed a lovely supper at sundown. We look forward to celebrating our course's 25th anniversary at the MCDOA dinner in five years' time and also plan to attend this year's dinner in November. Thanks for all your hard work and efforts in running the website which I regularly visit to keep up with all the news. To spare my blushes, Kev left off one key piece of detail in his update: the reason he was not smiling was that we had just spent ten minutes getting off a sandbank! Calculating we had 4m height of tide, surely we could take the short cut to Chichester whilst keeping an eye on the echo sounder? Apparently not, and after ten minutes of bumping around trying to find a way out with only half an hour of the flood left, we finally managed to go out the same way we came in and into better soundings – phew! As I said to Kev, with a winged keel it’s always difficult to anti-foul its underside so a bit of grinding on firm sand will have done it a power of good The echo sounder is pretty damn accurate too! Proving yet again the old adage that the two most useless things you can have on a yacht are an umbrella and a Naval Officer! 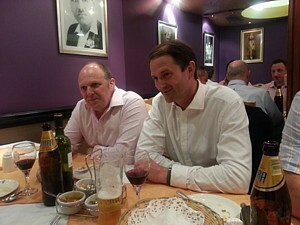 Nice to see Dave Hunkin and Kev Stockton enjoying themselves and kind of them to mention me. I have just retired having sold my gas business so catching up on the DIY stuff at home. 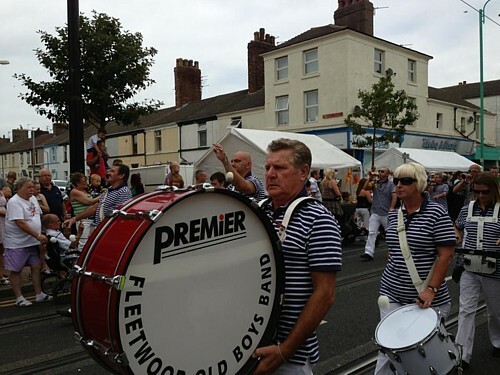 I have been a member of the Fleetwood Old Boys Band for the past three years. The band was made up from ex-members of the Fleetwood Sea Cadet Corps (SSC) as a drum and bugle marching band back in the 1980s but we now have members that are not ex-SCC. We have also introduced Bell Lyras to the band. 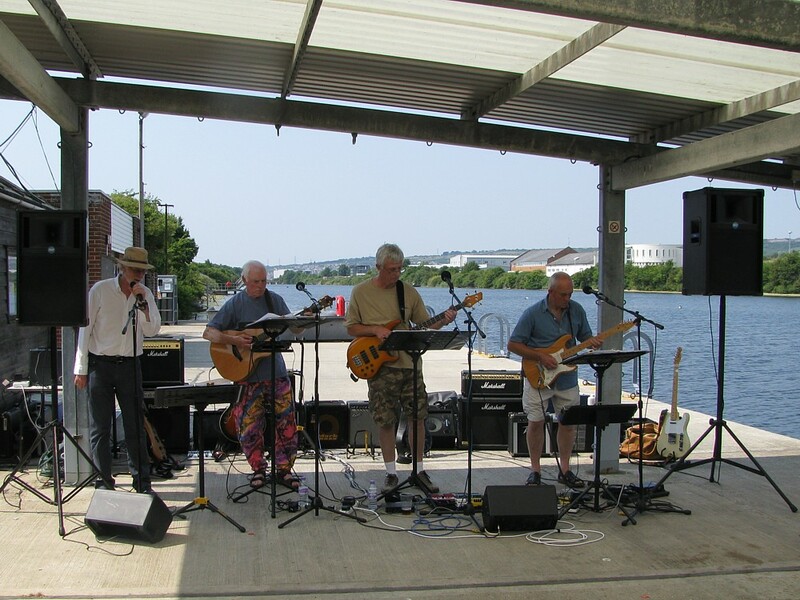 It’s a busy band doing loads for local charities and supporting the town. Bay House School on Monday, Tuesday and Thursday with 60 kids per day! Wardens who gallantly faced up to the invasion comprised ex-FCPO(D) John Dadd BEM, ex-CD James Thomson and Ann Bevan. 23 hyperactive Gosport Cubs were herded around on Wednesday, again by John Dadd, James Thomson and Ann Bevan. 16 very well-behaved "Hands" artisans sacrificed serious beer-drinking time to do the tour as soon as the Cubs had left on Wednesday! And yes, John Dadd, James Thomson and Ann Bevan showed them around. 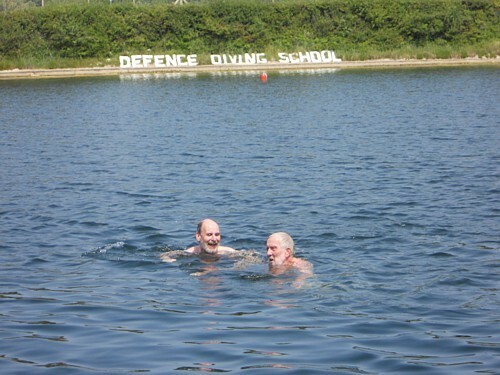 Our contribution to the RN's Standard Underwater Medicine Course (SUMC) is gaining in stature all the time! Jim Thomson represented the Diving Museum at an Awards Ceremony held in Gosport Town Hall on 1 July and picked up the Disabled Customers Friendly Award from Gosport's Mayor, Councillor John Beavis MBE. Well done to all who have helped us gain this recognition. We have been especially privileged to be the sole supplier of an 'in-depth' interview (sorry for the pun!) with Sydney Knowles BEM (1921-2012) in Spain and Gibraltar just a few years before he died at the age of 90 years. The DVD is a whole two hours long and he relates many details of his career with Cdr Crabb in Gibraltar and Italy. It includes his meetings with Crabb in the years leading up to the tragic dive in Portsmouth Harbour in 1956. This is a very personal insight into the close relationship between these two brave and highly decorated heroes of WW2. A touching section was when Knowles met Crabb in London after Crabb had been "bowler-hatted" by the RN and he was reduced to walking the streets with a sandwich board. The memory reduced poor Knowles to tears. 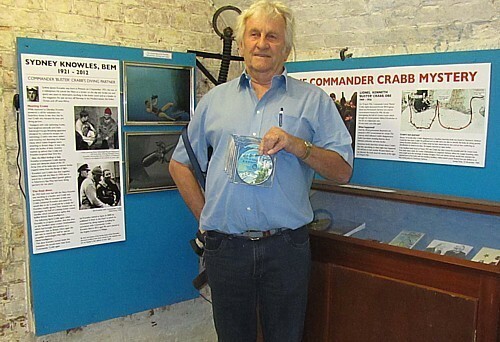 The DVD was made by Phil Money who called in at the Museum on 11 July to deliver the first consignment. Copies of the DVD are available for only £10.00. By Webmaster: Readers may also be interested in obtaining a copy of Sydney Knowles' autobiography, A Diver in the Dark, which has a foreword written by Yours Truly. Amazing help from Tommo, Nigel, Kevin, Dougie and Ann. Many thanks. Three days so far and the roof is finally clear plus a dead tree cut down, plus some serious pollarding plus a lot of ivy cut out. The next step is applying the bitumastic paint. That will be Friday 19 July, hopefully. Start time 1000 hrs. Tommo can't make it till later in the day. Any other takers? MCDOA members Andy 'Sharkey' Ward and Kim Godfrey are organising a beer and curry event for fellow members in central London on Thursday 5 September 2013. If you are interested in taking part, please contact Sharkey via this email address. The Plymouth Herald website contains this article describing a callout for Southern Diving Unit 1 (SDU1) to deal with unexploded ordnance discovered in Millbay Docks yesterday. I thought I would pass on that I’ve written a book on Navy CDs/EOD in Vietnam. As far as I can find out, it is the ONLY book in publication about EOD teams in Vietnam – US or Australian. The Royal Navy website contains this article describing the handover of HMS Ramsey from MCM1 Crew 1 to MCM1 Crew 6 after their six-and-a-half months deployed in the Gulf. 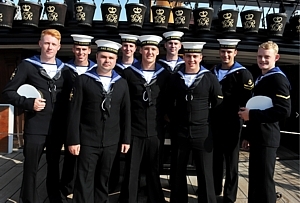 The Royal Navy website contains this article and the Navy News website this article describing the Operational Sea Training (OST) and other activities experienced by HMS Chiddingfold (MCM2 Crew 5) following her lengthy refit in Rosyth. The article features AB(D) Kevin Beecher. This is your last chance to sign up for this year's combined association barbecue at Horsea Island this Sunday from 1200 to 1730. 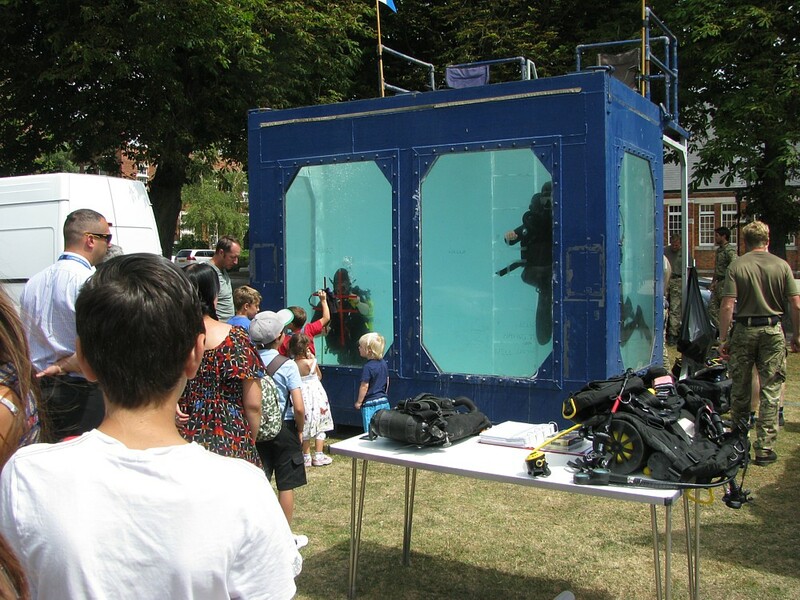 Sponsored by the MCDOA, the Minewarfare Association (MWA), the Association of RN First Class Divers (AORNFCD) and the RN Clearance Divers' Association (RNCDA), it is open to all serving and ex-serving MWs and Divers and their families. Live music will be provided by The Zodions (including MCDOA members Martyn Holloway and Dan Nicholson) and there will be a raffle (bring along a prize), horseracing and other games. 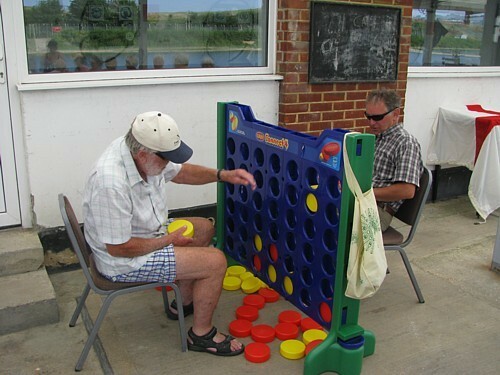 The cost is £10 per head and £5 for children under 10 for food and your first drink is free. 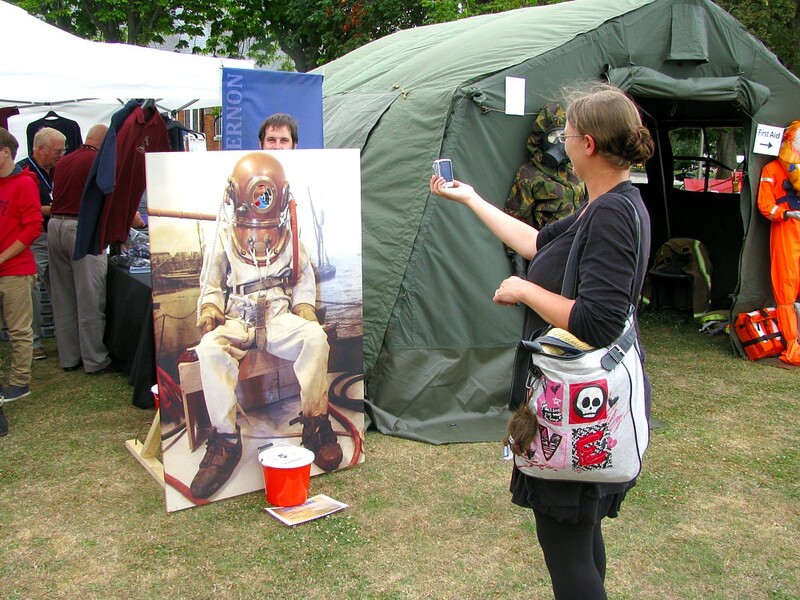 All proceeds will go towards Project Vernon, the campaign to erect a monument at Gunwharf Quays to commemorate the minewarfare & diving heritage of HMS Vernon which previously stood on the site. The calling notice and booking form are available for download here. "The funeral started with a lone piper leading the cortege down the drive to the Crematorium. Bob’s family carried the coffin (covered by a White Ensign with a CPO’s cap on it) into the Chapel, again preceded by the piper. The Service started with the hymn “All things bright and beautiful” which was followed by prayers and a reading. 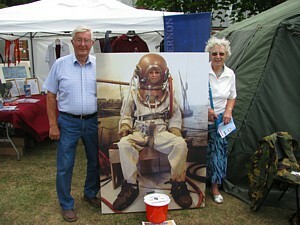 Bob’s son-in-law gave a eulogy explaining Bob’s love of the sea and how he joined the Royal Navy at the age of 15. He was one of the youngest ever to qualify as a CD and saw service in many parts of the globe before retiring after 25 years service. He was then recalled and served in RFA Sir Galahad during the Gulf War. Bob’s son Robert then reminisced about his father including an explanation as to why he wore a spotted bow tie on his diving suit (to look his best when he met his mermaid!!). 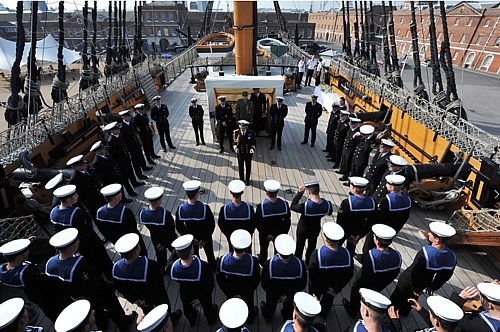 We then sang the Naval Hymn (“Eternal father, Strong to save”) before the commendation and committal. The exit music was Bette Midler’s “Wind beneath my Wings”. A wake was held at Ashby Decoy Golf Club where Bob was an enthusiastic member. Those who knew Bob/Jock will be pleased to hear that his funeral was well-attended and could be best described as a stylish and dignified send-off." 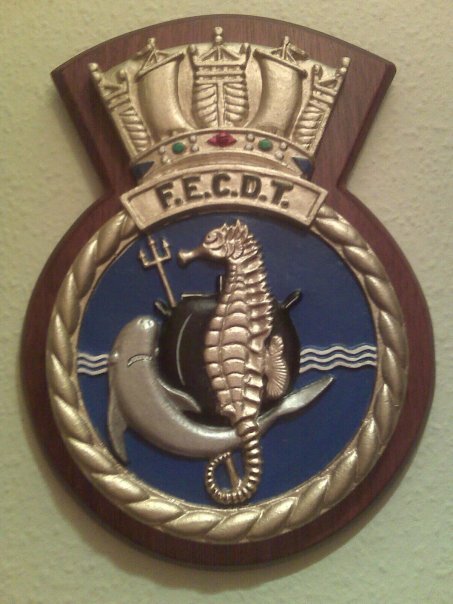 According to MCDOA member Matt Moore, Commanding Officer of HMS Shoreham (MCM1 Crew 8), the funnel badge shown below has been approved for wear by Royal Navy minehunters deployed in the Gulf on Operation KIPION and will soon be a common sight. 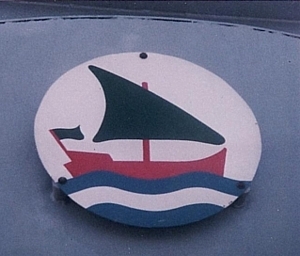 The badge depicting an Arab dhow, known locally as a 'boum', is similar in design to the badge shown below which was worn by the TON Class MCMVs of the 9th Minesweeping Squadron (9th MSS), renamed the 9th MCM Squadron (9th MCMS) in 1969 when its minesweepers were joined by minehunters. 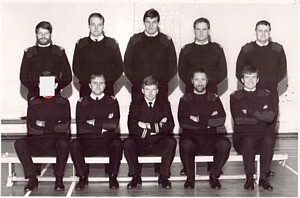 This squadron was based at HMS Jufair in Bahrain (now the site of the US Navy's CENTCOM facility at Mina Salman) between 1 October 1962 and 9 August 1971. 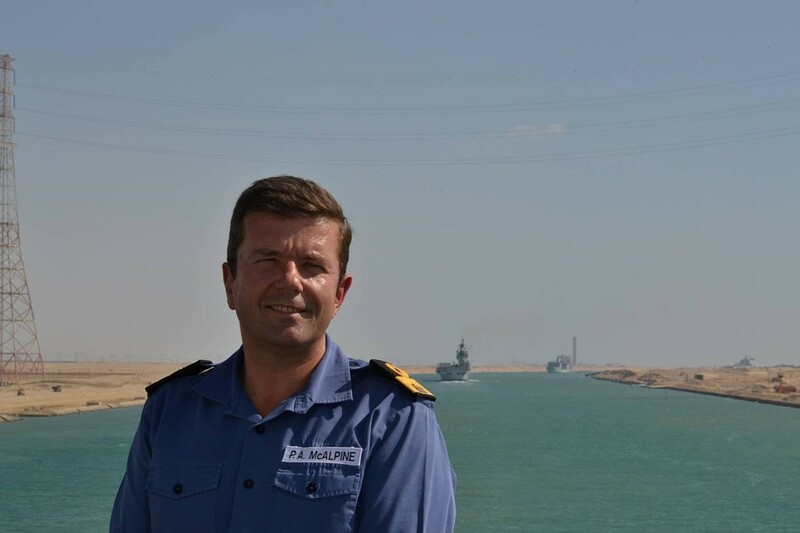 The reinstatement of a specific funnel badge for RN MCM forces deployed in the Gulf was the brainchild of MCDOA member Martin Mackey who was Commander UK MCM Force (COMUKMCMFOR) in the Gulf last year. Thanks for that. I knew it was coming but, as I didn't know when, I didn't say anything. It makes me proud to know that I have managed to get this off the ground. Thanks for your input. No one will remember where it came from, but I hope they all know where it is going. Hope to see you at the MWA Dit session. The Royal Navy website contains this article describing how MCM2 Crew 4 has settled in after taking over HMS Atherstone from MCM2 Crew 1 in the Gulf last month. 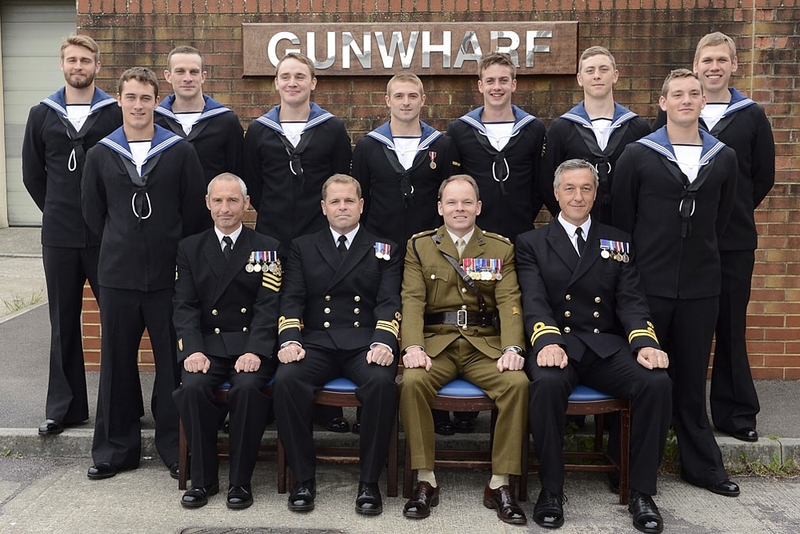 The Royal Navy website contains this article describing the completion of course by the nine latest RN clearance divers to qualify at the Defence Diving School (DDS) at Horsea Island. The Navy News website this article describing the participation of the Gulf-based minehunters HMS Ramsey (MCM1 Crew 1 being relieved by MCM1 Crew 6 this month), HMS Shoreham (MCM1 Crew 7 relieved by MCM1 Crew 8 commanded by MCDOA member Matt Moore last month), HMS Atherstone (MCM2 Crew 1 commanded by MCDOA member Ben Vickery relieved by MCM2 Crew 4 last month) and HMS Quorn (MCM2 Crew 8 being relieved by MCM2 Crew 7 this month) plus RFA Cardigan Bay, together with French and US warships, in the ten-day Exercise ARTEMIS TRIDENT. 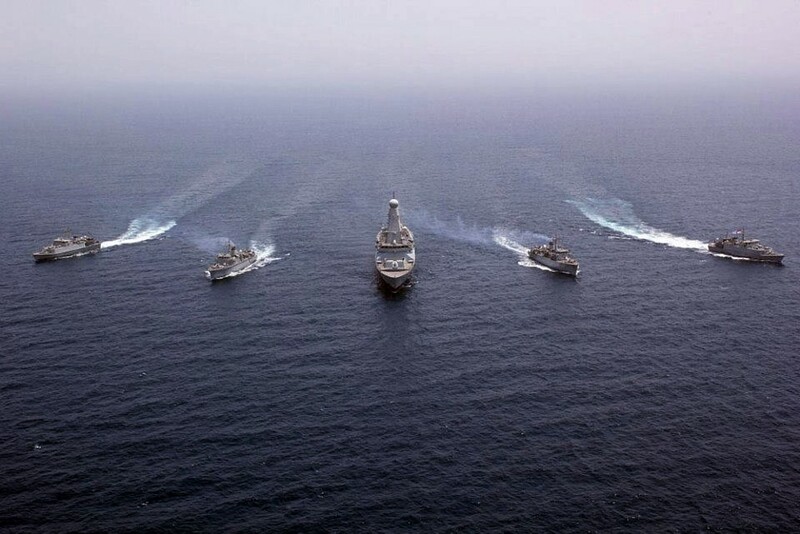 This was the UK MCM Force's second major international exercise within a month and involved 11 warships, fast jets, helicopters, specialist diving teams and underwater vehicles. 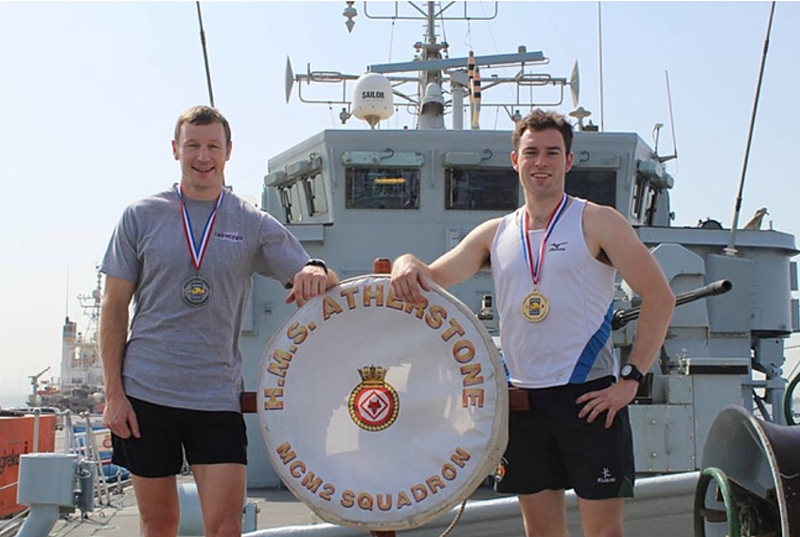 "...Straight after ARTEMIS TRIDENT, Atherstone maintained the quick pace of life in Bahrain with one fifth of the ship’s company volunteering to join the US July 4 Independence Day 3k run at the Americans’ huge support base. 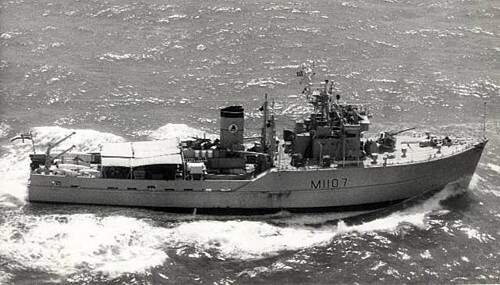 Although Atherstone only had eight runners in a large field, the Hunt-class ship bagged four of the top five places: Sub Lt Matt Brown (first), CPO Al Kennedy (second), Mid Dave Mayes (fourth) and PO Joe Morton (fifth)..."
MCDOA member Mike Gillam is preparing a more comprehensive history of the FECDT's activities which will be published here when available. The Portsmouth News website contains this article describing the attendance of Portsmouth-based Southern Diving Unit 2 (SDU2) following an explosion at HMS Nelson today. 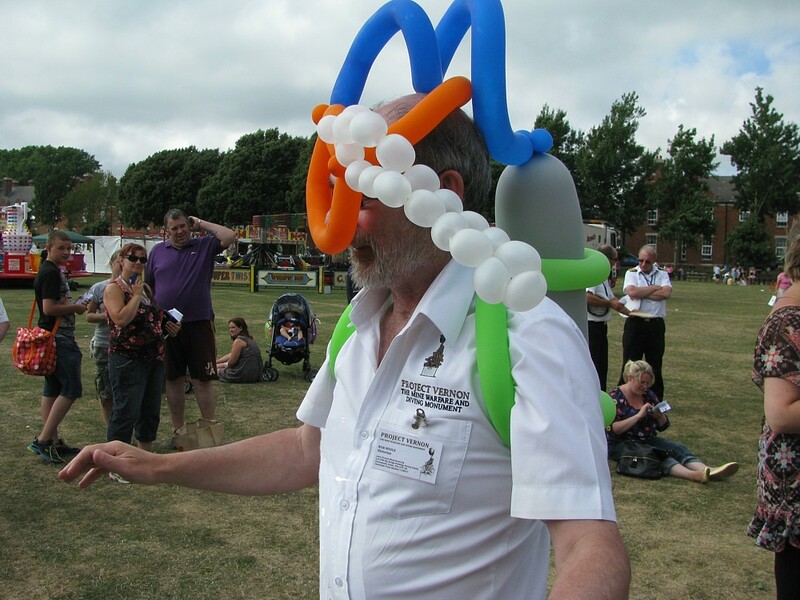 MCDOA member Robin Jack has kindly volunteered to represent the Association at the funeral of Bob Adam in Scunthorpe on 11 July (see second entry for 2 Jul 13). "G'day all and many thanks for the contacts. Stories about Bob 'Jock' Adam? Quite honestly there isn't the space or the time as I would still be typing when he is sadly laid to rest. I first met Bob when he was on board HMS Dipper in Jan 1956 as part of the 50th Minesweeping Squadron Clearance Diving team based at HMS Lochinvar in South Queensferry, then commanded by a younger Lt Bill Filer. At that time I was on board HMS Brenchley in the 51st MSS Clearance Diving Team, also based at Lochinvar. I think my next meeting with Bob was our two-year stint together in the Med Fleet Clearance Diving Team where I arrived in August 1958. I could have written a book at the time about some of the incidents that we got up to and the great diving times and friendships that we had as team members. Not all of these incidents would have been pleasing to our boss, Lt Cdr George 'Franky' Franklin. After leaving Malta at the end of our 'tour of duty', Bob and I remained together for our CD2s' course in 1961. 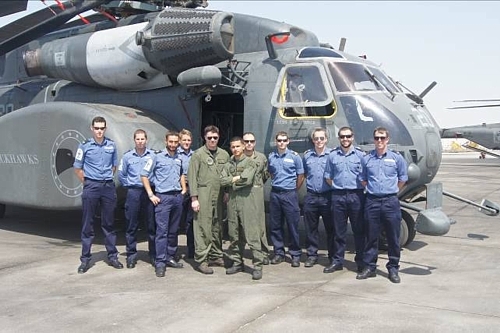 Our course was not only a class under instruction but was also used as Vernon's front line Diving Team, being sent on a variety of jobs such as helicopter recovery. You name it and we probably did it. 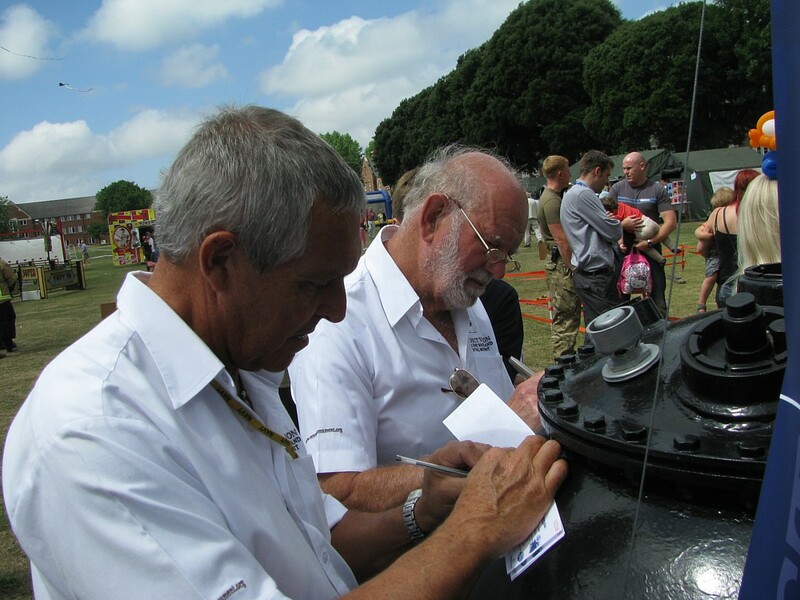 PJ Messervy was our course officer and Taff Roberts (CD1) our instructor. 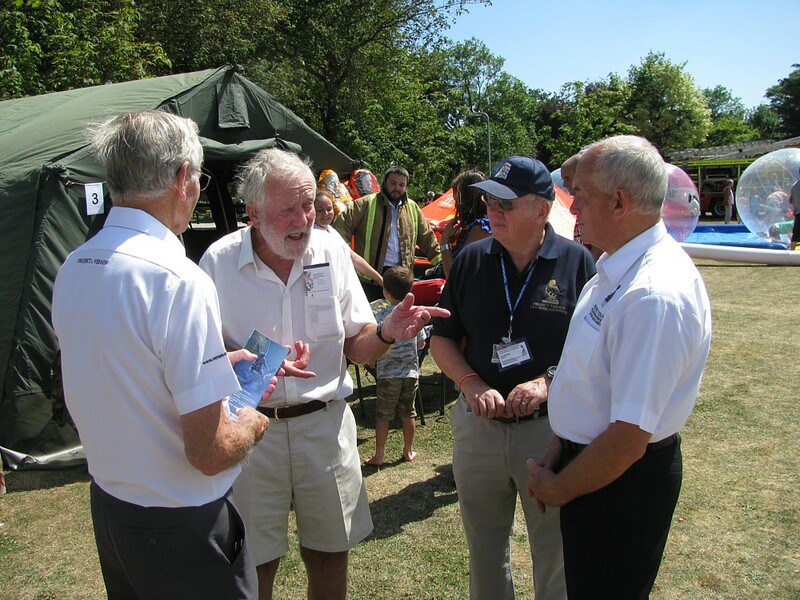 Bob and I kept in close touch but did not work together again until we had both left the RN and become Life Support Technicians for Strongwork Diving International, formed previously by ex-CDO Harry Wardle. The company had so many ex-CDs that it should have been named HMS Strongwork. This is certainly not a plug for book sales* but I have covered a few of the antics that Bob and I got up to in a fairly serious account of how the CD branch was fairing from 1955 to 76. Many of the antics came about as a result of our 'escape and evasion' taught to us by the Royal Marine Commandos at Poole as a small part of our CD2s' qualifying course. Well done Robin on offering your services to my mate's family members in their hour of need. I am sure that it will be much appreciated. * See 'A Corkhead's Chronicle - Experiences of a Royal Navy Clearance Diver 1955-76' by David J Lott. 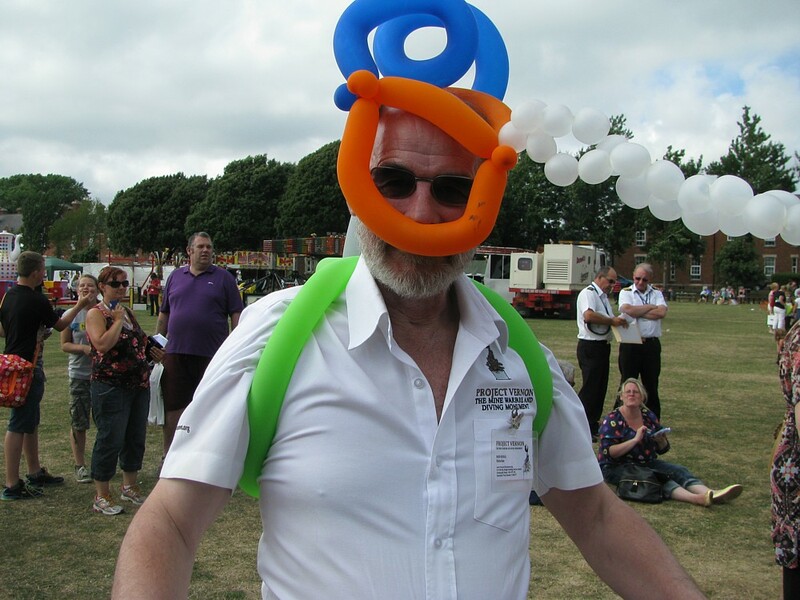 The funeral service for Bob Underwood will take place at Portchester Crematorium at 1230 on Thursday 18 July 2013 (see entry for 30 Jun 13 in News Archive 42). Bob's daughter Nicole has asked for family flowers only. She would be pleased if donations could be made to the Vernon Monument Project in Bob's name. After the service, Nicole has asked that fellow mourners join the family at the Queen's Hotel in Southsea. "For anyone attending Bob's funeral on Thursday, the Queens Hotel is offering a special rate for the night with a number of rooms put by. Contact me via this email address for the ref. number." Here is a photo taken at the funeral of Cdr Lionel 'Buster' Crabb OBE GM RNVR. 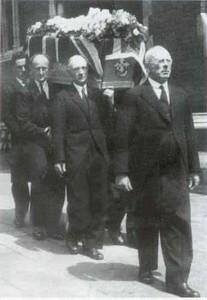 Can anyone identify the coffin bearers in the picture? 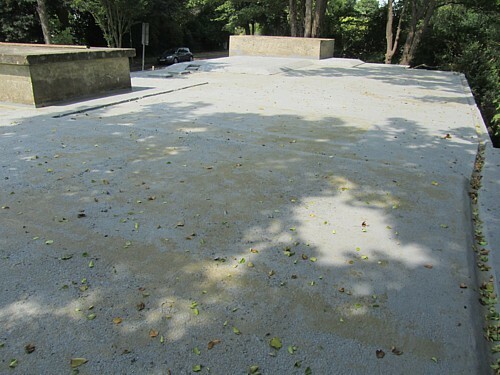 The roof of the HDS bunker in The Avenue, Gosport presently leaks water. 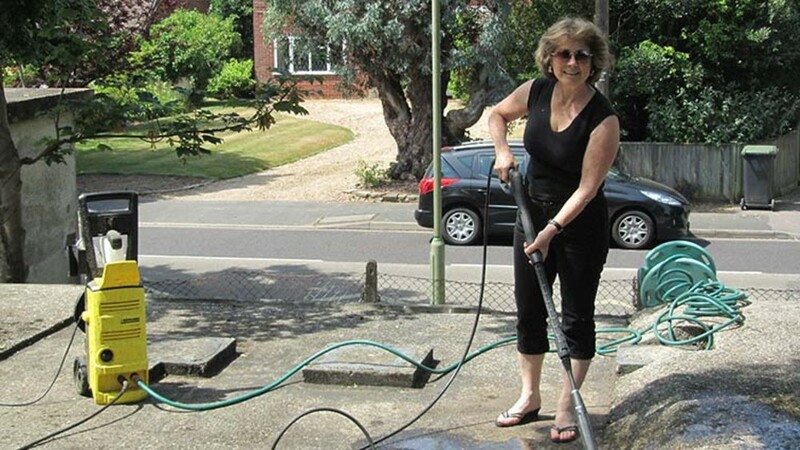 Thanks to HDS members Chris and Pam Murphy, we have been able to acquire 12 x 20 kg cans of Cromapol bitumastic, fibrous roof coating. 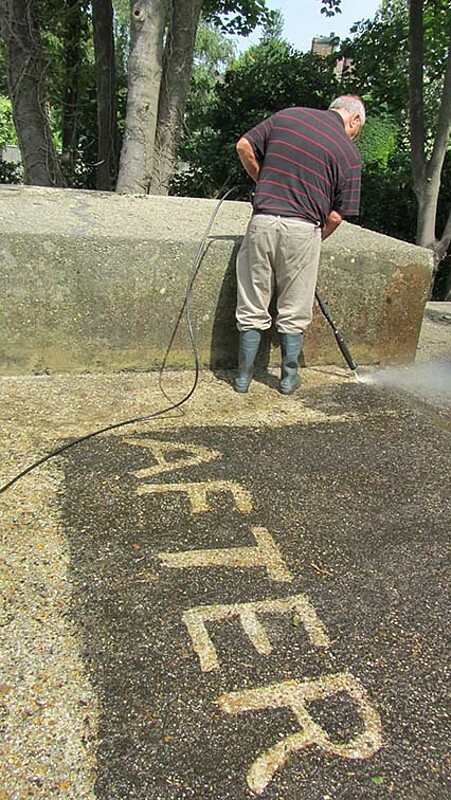 * Applying the Cromapol - I think this will be done mainly by pouring and brushing with brooms. We’ll need help to achieve the above objectives so please let me know if you will be able to join the team. We will review the timing closer to the days to take the weather into account. If you wish to respond to John's appeals for assistance, please contact him via this email address or call him on 07802 785050. 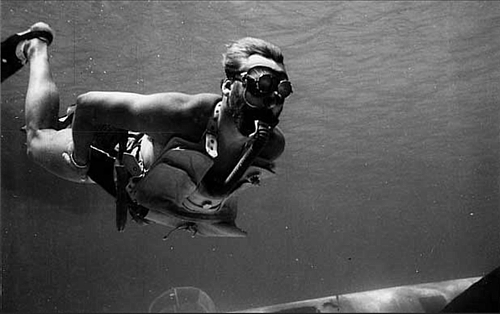 I am researching for a non-fiction book about frogmen, small/midget submarines, SDVs, kayaks and generally all things along those lines. Clearence Diving is a key part of the story. 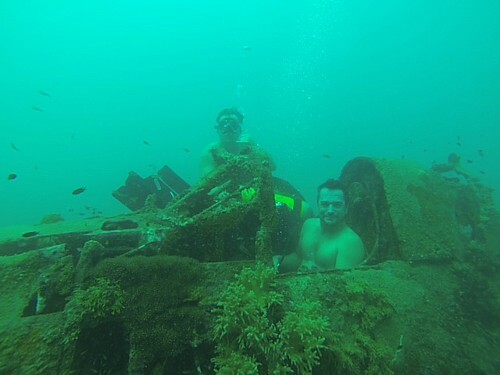 I would be particularly interested in speaking to anyone who knows about or has experience of post-war British submersibles (Chariots, SDVs, Scooters, Sleds, LR series, etc.). I think that a lot if this stuff is forgotten to history which we can correct; in particular, anything about Archimedes, AML, the Cook brothers, Baptism, SubTug, SubSkimmer, SubCat or any others. 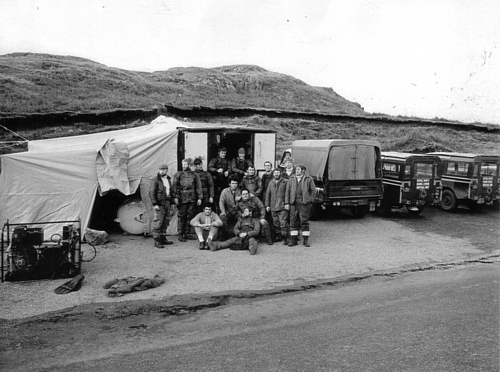 I would also like to hear from anyone who conducted clearance diving operations during the Falklands conflict. If you wish to respond to Haydn's appeal for assistance, please contact him via this email address. The Royal Navy website contains this article and the Navy News website this article describing a visit by sailors from HMS Ramsey (MCM1 Crew 1) to see the MH-53E Sea Dragon helicopters of the US Navy's Helicopter Mine Countermeasures Squadron 15 (HM-15), known as the 'Blackhawks', ahead of a US-UK-French exercise in the Gulf. The article features LS(MW) Graeme ‘Blood’ Reid. I have heard from Jenny Adam, via former FCPO(D) Dave 'Mona' Lott BEM, that the funeral service of her late father will take place at 1440 on Thursday 11 July at Woodlands Crematorium, Brumby Wood Lane, Scunthorpe, DN17 1SP (see entry for 28 Jun 13 in News Archive 42). Dave also advises me that ex-CPO(D) Les Sharpe will be representing the Association of RN First Class Divers (AORNFCD). I promised you that I would send you an update when my article on MCMVs vs UUVs was finally published and, after surprisingly little to-ing and fro-ing, it appears in the latest (July) version of Proceedings Magazine. The U.S. Naval Institute holds the copyright, and is responsible for the smattering of 'Americanisms' that litter the article, but any intellectual errors are all my own! 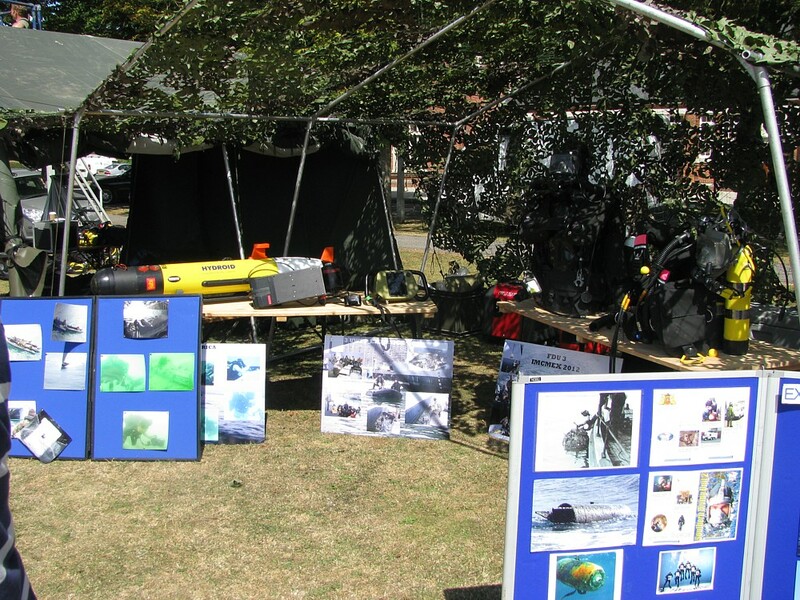 US Naval War College - Joint Military Operations Faculty"
The Navy is succumbing to the siren-song of using underwater robots for detecting and destroying mines. But the technology still is far from ready, and policymakers would be far better off holding onto traditional mine-countermeasures vessels. The U.S. Navy is making what could prove to be a costly — and potentially dangerous — mistake by moving away from surface mine-countermeasures vessels and toward unmanned underwater vehicles (UUVs) instead. As a result, replacing traditional mine-countermeasures vessels with UUVs is likely to diminish the ability of the United States and its maritime allies to meet the threat posed by the growing use of sea mines — particularly by rogue states and insurgent forces — thus endangering U.S. national security and imperiling the global economy. Worse, the loss of such capabilities is irreversible. Once it has begun, it can’t be checked easily. While we might like to wish the mine threat away (see the “Interest wanes as memories fade” category in Lyons’ recurring MCM cycle), the evidence clearly shows that the mine threat is increasing as weaker nations with smaller defense budgets seek to hobble the U.S. Navy’s maritime hegemony. The confidence shown by Iran’s Navy chief, Admiral Habibollah Sayyari, in December 2011, when he said that “Closing the Strait of Hormuz . . . will be easier than drinking a glass of water” was a clear allusion to his country’s previously demonstrated ability to lay mines in the Persian Gulf. Similarly, anyone who thinks that China’s recent advance in carrier aviation suggests that the People’s Liberation Army Navy (PLAN) will be counting primarily on air power to challenge the U.S. Navy in Asia’s sea-lanes might want to read the excellent assessment of China’s mine-warfare capability produced by the U.S. Naval War College’s China Maritime Studies Institute. 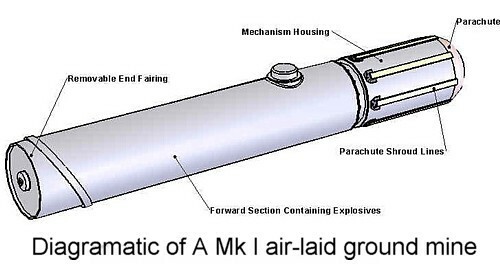 6 The PLAN’s “Assassin’s Mace” capability makes for sobering reading. Such realities are too often dismissed by technophiles, but they are convincing enough to our adversaries. Indeed, in U.S. policymaking circles, the threat posed by sea-mines is so well known that it is in danger of being dismissed as background noise. Given such a clear and present danger, why is the U.S. Navy being seduced away from mine-countermeasures ships and toward UUVs? The answer, in a nutshell, is money. With declining defense budgets and soaring costs for other new weapon systems, U.S. policymakers have found themselves squeezed for funds, and sometimes willing to grasp at spectacular new technology that seems to promise budgetary savings even if it requires that they accept increased strategic risk. In the case of the UUVs, proponents have been able to sell the new concept by arguing that the robots are ready to replace manned surface ships as the Navy’s primary mine-detecting and -destroying vehicles, siphoning off the funding that otherwise might be used to expand the traditional mine-detection and mine-destruction force. With the mine-countermeasures community unable to lobby against that, it has sought to make surface ships seem “sexier” in order to compete for funding. And it has lost out. But the UUV proponents’ argument is flawed. U.S. and Western weapons designers sometimes have come up with technological breakthroughs that offer major cost-cutting opportunities and improved capability, but the “no-brainers” that provide both of those benefits are few and far between, and the prospect of technological advances in coming years does not necessarily guarantee that a weapon will prove more capable. Unfortunately, in the tradeoff between surface ships and UUVs, there are serious risks that the U.S. Navy will lose maritime access “for the want of a nail.” Indeed, the risks are so large that they imperil not only U.S. national security, but the entire Western economy. At the same time, given the influence of the U.S. Navy as the only truly global maritime power, the navies of U.S. allies, which face even greater constraints on military spending than the United States, will likely follow Washington’s lead in shifting funds from surface ships to UUVs. That will end any chances that other countries will fill the mine-countermeasures gap the United States leaves behind, and the entire Western inventory will suffer. Decisions of this magnitude should link defense spending to broad strategy in a logical and dispassionate analysis of the most potent threats to the national economy. With that in mind, the U.S. Navy should reconsider its UUV policy and seek instead to preserve its current capabilities. 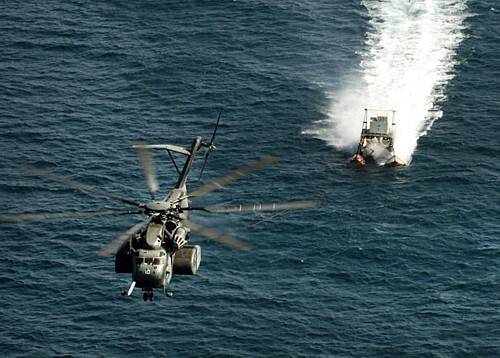 To understand how this dire situation has arisen and appreciate why corrective action is required, we must consider two distinct threats: the strategic threat to MCM in general, and the tactical threat to the maritime community at large. Many of the supposed advantages that UUVs are said to have over surface ships are superficial or simply not true. Contrary to what proponents have contended, today’s UUVs don’t come close to matching surface ships in their ability to detect and destroy mines. Much of the argument over this issue involves classified information, but you only need a basic grasp of sonar theory to appreciate why a surface ship’s variable-depth sonar, physically attached to a source of electric power and constantly monitored by a team of professional operators, performs more capably than a small, battery-powered UUV that cannot provide real-time data. And detecting a contact is only part of the mine-countermeasures effort. Once the mine is found, it must be classified (as mine, non-mine, mine-like, etc.) through careful assessment of a variety of characteristics — size, shape, shadow, target echo strength, etc. Then it must be prosecuted — more often than not these days using a remotely operated vehicle (ROV) or explosive ordnance disposal (EOD) diver. The need to prosecute so many contacts arises from the fact that many mines are deliberately designed to look like non-mines — for example, the Swedish “Rockan” or the Italian “Manta” — while many non-mines have numerous mine-like characteristics. Till notes that “the sea bottom in the littorals is notorious for being covered in a remarkable diversity of old iron (wrecks, oil drums, old washing machines, the list is endless) and this makes detection extremely difficult. New UUVs may, however, help." 9 Note that Till uses the word help — meaning it could assist the effort, not replace current capabilities. Surface ships also consistently outperform UUVs in other areas. For detection, their greater sonar power increases the volume of water “hunted” and improves the speed of advance. 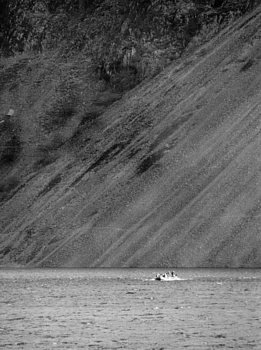 For classification, the operators who view the sonar picture in real-time can change the frequency of the sonar, allowing more accurate classification of contacts that appear amorphous at first glance. Finally, for prosecution and neutralization, surface ships carry their own ROVs, including spares, and can embark and support an EOD diving team; UUVs cannot. UUVs only have the advantage when it comes to supporting diving operations within confined harbors, where surface ships might struggle to operate. And, perhaps most telling, UUVs are cheaper. Admittedly, such arguments apply primarily to present-day UUVs. But what about future versions? Technology is developing rapidly, and many of its proponents predict that a new, far-more-capable model is coming soon. Admiral Jonathan W. Greenert, the Chief of Naval Operations, often mentions Intel Corporation co-founder Gordon Moore’s famous 1965 prediction that the number of transistors per processor chip would double every two years, increasing overall computing speed and power. Might there be a similar “Moore’s Law” for UUV development? 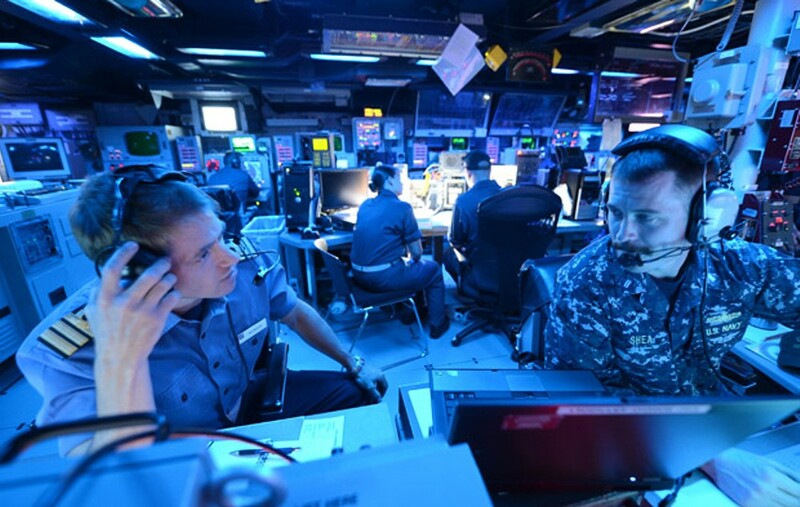 But Admiral Greenert has been careful to suggest that this growth in computing power “enables” precision weapons — it does not necessarily replace them. 10 “Technology, especially information-processing, will continue to evolve more quickly and become more widely available,” he says, but adds: “We appear to be reaching the limits of how much a platform’s inherent stealth can affordably get it close enough to survey or attack adversaries.” Indeed, not all technological advances keep pace with processor chip transistors and, while we might hope for a technological breakthrough in UUV technology, hope is not a principle of war that we should employ in the face of a serious and increasing threat to the U.S. Navy’s ability to secure maritime access. Two other points: First, even an “unmanned,” “underwater” vehicle requires a substantial manned surface platform to support it. Second, the Navy is planning to use modular hull platforms on board the Littoral Combat Ship (LCS) to carry its UUVs if the robots ultimately replace manned surface mine-countermeasures ships. Modular hulls have been tried before. The Danish Flyvefisken SF300-class patrol vessel was designed to use interchangeable modules to support four distinct missions: mine countermeasures, mine-laying, combat, and surveillance/pollution control. As the ship has evolved, however, each version has taken on one specific role — the first seven ships are specialist mine-countermeasures vessels in all but name — which raises some serious questions about the validity of the entire concept. As Captain Robert C. Powers notes in a September 2012 article: “As the LCS evolves, it is likely that the module concept will prove to be unsupportable from both a financial and operational point of view. What may evolve are two ship types; one with a mine-countermeasures capability to replace the wooden-hull minesweepers… and a second one with antisubmarine- and surface-warfare capabilities.” 11 Using the well-known Duck Test, it seems reasonable to conclude that if a ship looks like a mine-countermeasures ship and operates like a mine-countermeasures ship, then it’s a mine-countermeasures ship. As Milan Vego warns us most clearly in his 2011 U.S. Naval Institute prize-winning essay, “Technological superiority is not a panacea.” 13 We must always go back to the basics in order to remember what our strategic objective was, before we find ourselves distracted by the shiny new equipment available at the tactical level. Let us ensure that such a system of systems does not involve throwing the baby out with the bathwater in a imprudent rush to embrace unproven UUV technology at the expense of tried-and-tested surface ships. 1. Dwight H. Lyons Jr., Eleanor A. Baker, Sabrina R. Edlow, and David A. Perrin, Occasional Paper, “The Mine Threat: Show Stoppers or Speed Bumps?” (Alexandria, VA: Center for Naval Analyses, July 1993), 2. 2. For a comparative assessment, see Dan Parsons, “Undersea Mines Could be Next Decade’s IEDs,” National Defense Magazine, September 2012, at www.nationaldefensemagazine.org/blog/Lists/Posts/Post.aspx?ID=885 . 3. BBC posting 5 May 2011: www.bbc.co.uk/news/world-africa-13300510 . 4. 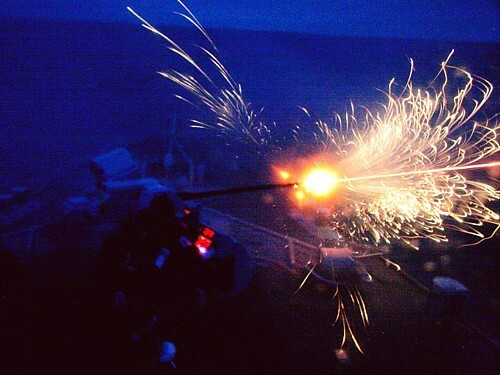 “21st Century U.S. Navy Mine Warfare,” U.S. Navy Expeditionary Warfare Directorate, Program Executive Office, Littoral and Mine Warfare, 2009. 8. 5. Commander, Mine Warfare Command, “An Introduction to Mine Warfare,” briefing slides with scripted commentary, Mine Warfare Command Headquarters, Corpus Christi, TX, 22 May 2002. 6. Andrew S. Erickson, Lyle J. Goldstein, and William S. Murray, “China Maritime Study Number 3, Chinese Mine Warfare: A PLA Navy “Assassin’s Mace’ Capability” (Newport, RI: Naval War College Press, June 2009). 7. Geoffrey Till, Seapower, 2d ed. (London: Routledge, 2009). 10. Admiral Jonathan W. Greenert, U.S. Navy, “Payloads Over Platforms: Charting a New Course,” Proceedings, July 2012. 18. 11. Captain Robert Carney Powers, U.S. Navy (Retired), “Birth of the Littoral Combat Ship,” Proceedings, September 2012. 47. 13. Milan Vego, “Technological Superiority is Not a Panacea,” Proceedings, October 2010. 28–32. 14. Sydney J. Freedburg Jr., “Eye on Speed, Navy Minesweepers Take Cues from NASCAR,” AOL Defense, 26 September 2012, at http://defense.aol.com/2012/09/26-eye-on-speed-navy-minesweepers-take-cu... . Commander Craig, a diving officer and a specialist in mine warfare, is a joint military operations professor at the U.S. Naval War College. 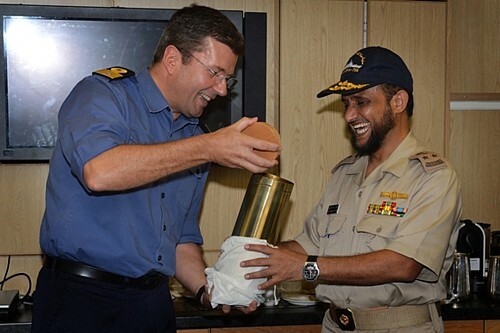 He recently commanded Britain’s 2nd Mine Countermeasures Squadron and served as U.S.-U.K. Surface mine-countermeasures commander in the Persian Gulf. He is a graduate of the U.S. Naval Command College at NWC. I am most grateful to John for allowing us to share his candid thoughts on this issue in such fashion. Commander Craig is spot on. If the USA sees a need for influence mine sweeping, why don't we? Now off to run the only expanding air force in Europe (HM CG's fleet of 11 S92s, 11 AW189s, B 737s and ..... Cessnas). 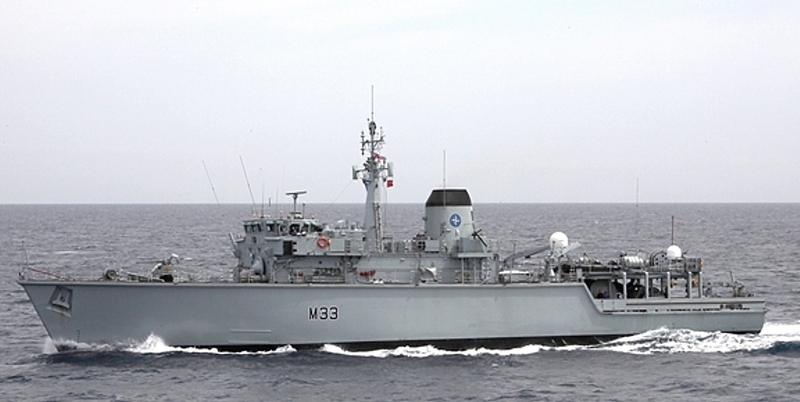 The Royal Navy website contains this article announcing that HMS Brocklesby (MCM2 Crew 3) will accompany the Type 23 frigate HMS Somerset during a visit to the Isle of Man this week to support the opening of the Tynwald (the Isle of Man's parliament). Brocklesby will be open to visitors alongside Victoria Pier in Douglas from Thursday until Monday. Things are warming up at last! The sun is starting to bring them out! Last Saturday tempted 30 and sunny Sunday peaked at 52! 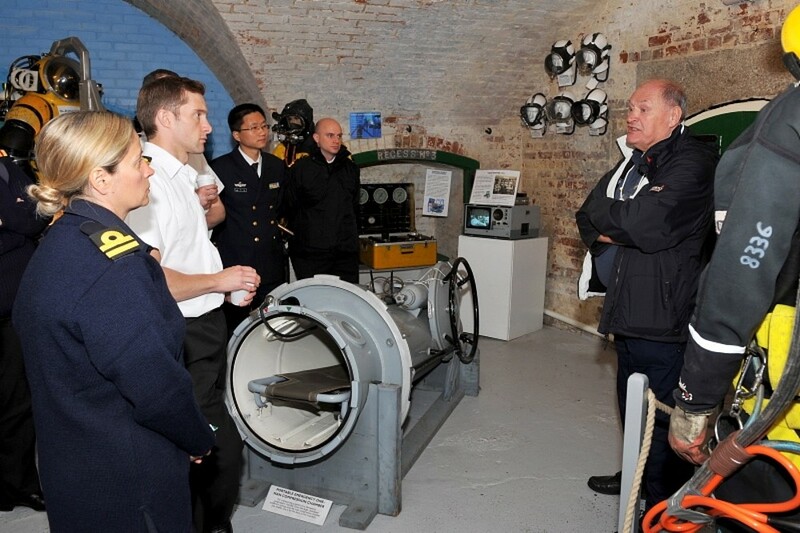 Captain Mark Michaud USN, Director of Undersea Medicine US Navy accompanied by Captain Brett Sortor MD USN (US Navy exchange officer) called in on Saturday and were most complimentary about the Museum. 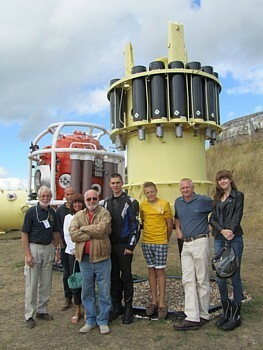 The previous weekend, we were visited by two HDS USA members. Brian and Donna Fuerman had made the journey from Florida specially! They also made a serious dent in the shop's stocks before departing. 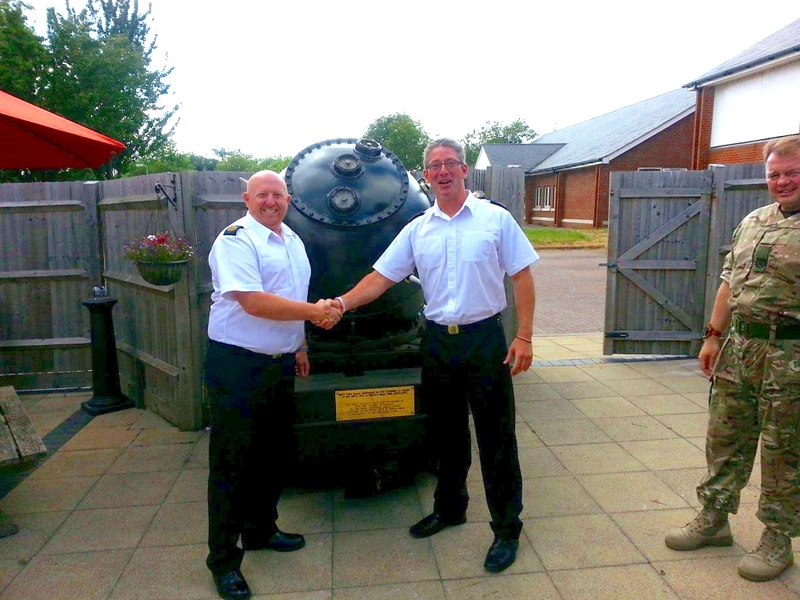 Lt Trev Orton RN from the Defence Diving School (DDS) paid a visit and said he would be sending various diving course trainees over in the future. The weekend prior to that saw Bob Crawford of HDS Canada call in. On Tuesday 18 June we were invaded by 22 10-year-olds from the local Siskin School. These were supposed to be 'disadvantaged' children but they were the best-behaved we have ever had! On Sunday 9 June we were visited by eight nurses and a doctor on a course at the Institute of Naval Medicine. On Thursday 13 June, we had the return of the annual Diving Doctors' Course from the Institute of Naval Medicine. We hosted a most successful private function on the evening of Friday 7 June with 45 visitors enjoying a wine & cheese evening. 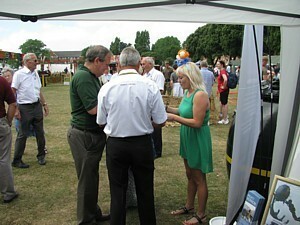 Our local MP Caroline Dineage headed the VIP list and a raffle was held to raise funds for the Museum. Altogether a most successful event. 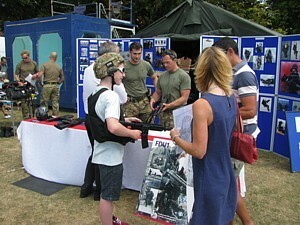 The local 'cubs' held an educational evening at the Museum on Wednesday 5 June. Ann Bevan provided the Beavers with various challenges and a physics (buoyancy) experiment to carry out. Another successful educational event! Welcome to new guide Tug Wilson who helped out during our hours of need on the Sunday. Barry Stayte did us proud by turning out in full, nineteenth century RE uniform. Mrs A Neal, widow of Cyril Neal (of the Deep Trials Unit, RNPL) has generously donated 22 classic photos and Cyril's RN Diving Logbook for our archives. 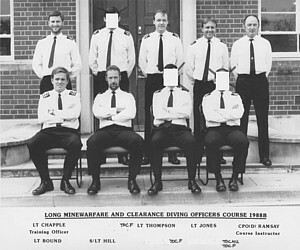 The example below, taken in the early 1970s, includes (first stab at names, left to right): Lt Cdr Bill Filer, CPO 'Hoppy' Hopwell, Mr Wiltshire, Cliff ..., Johnny Peach, Cyril Neal, unknown, 'Donkey' Bray, USN officer. If you can help with names, please do. 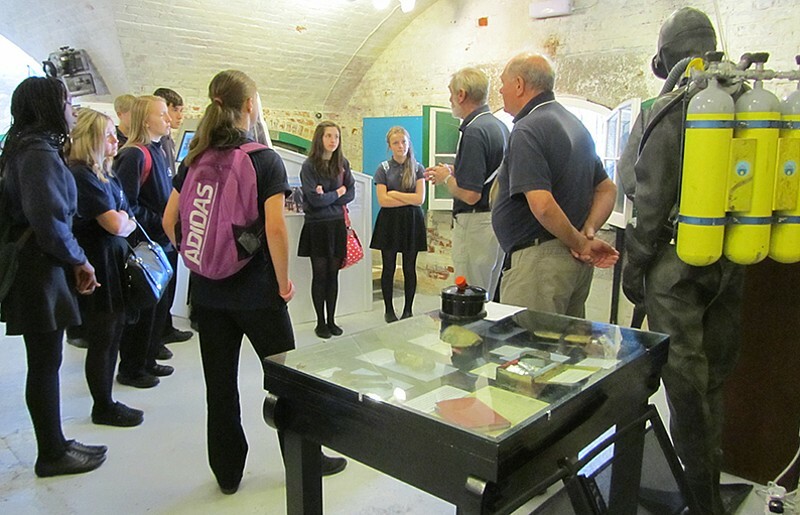 60 pupils from Gomer Junior School were given a lesson in WW2 at the ARP Bunker on Thursday, 27th June. Ann Bevan and Jim Thomson played the roles of ARP Wardens amongst calls of "Don't panic Mr Mainwaring!". 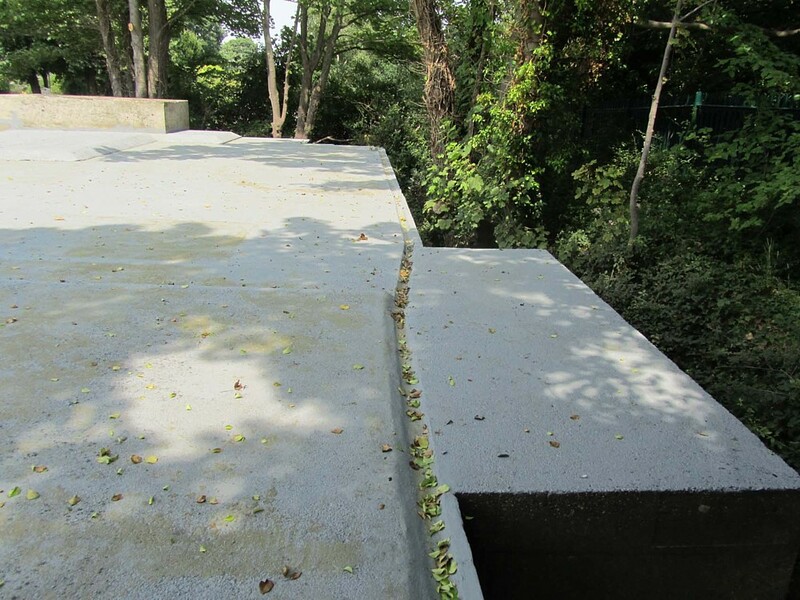 I'm starting a "ROOF FUND" to raise money to 'fix' the bunker/library roof. I've sent out a few requests to test the waters and have received an encouraging reply from Captain T J Gulley RN, the Commanding Officer of HMS Sultan. I think this will end up being an application to the HLF in due course. HDS member John Smilie recently helped a video company make an advertisement which is now on Youtube. John generously donated the fee to the HDS. 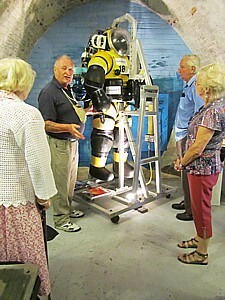 Ann has now added Diving Museum postcards to the shop stock and new car stickers are on order. We now have a smart new money till, with bells on, so we look a little more professional. 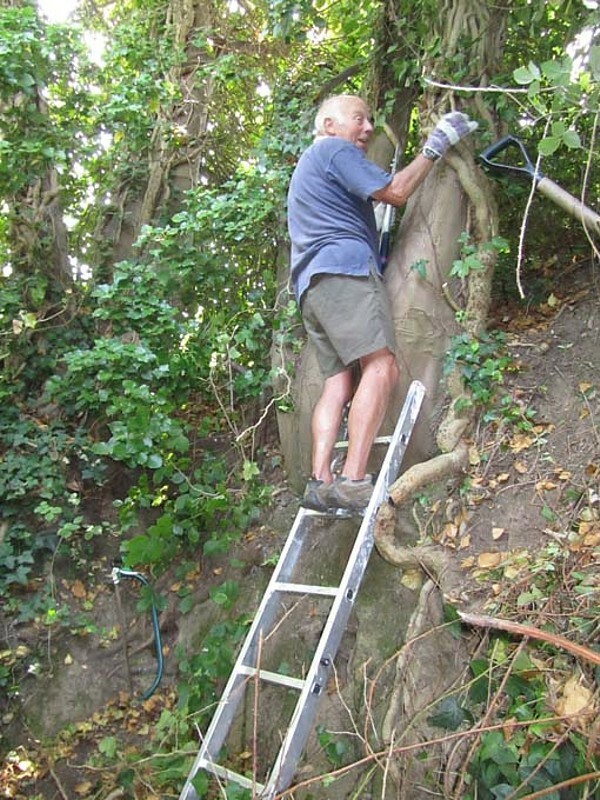 Portchester Society are descending on us on Tuesday, 2-4pm, organised by John Towse. The MCDOA website has broken barriers for the second month running. During June 2013, it was accessed by 35,416 distinct host servers, the first time this statistic has exceeded 35,000. The number of people accessing the site is likely to be even higher as many servers (e.g. MoD, US military, etc.) are shared by several users.